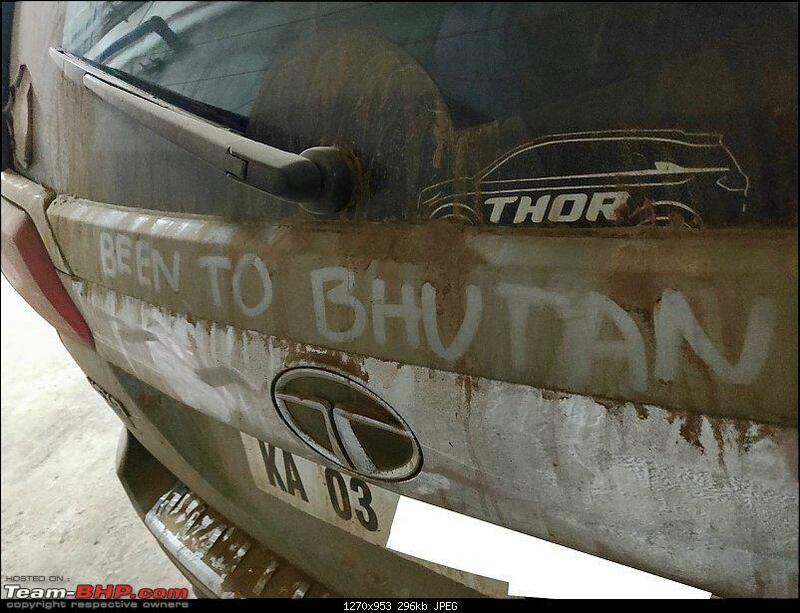 “We drove to another country from Bangalore! 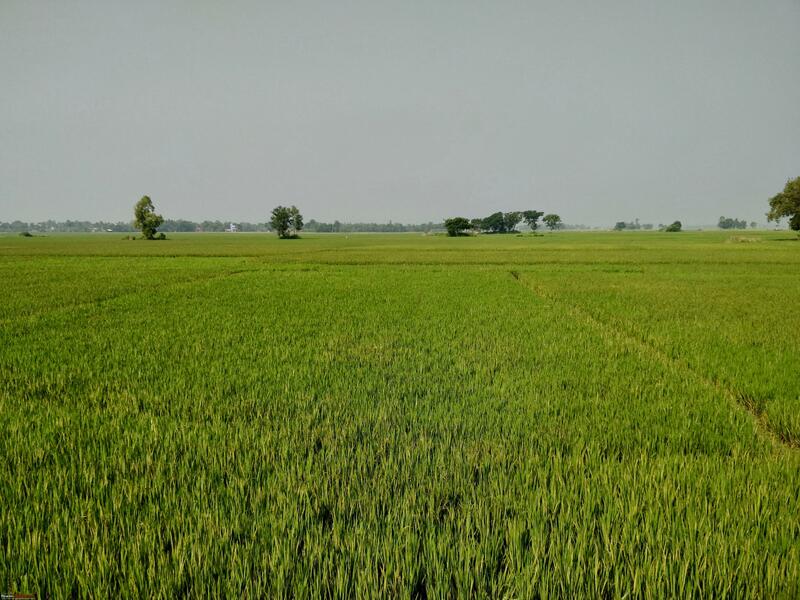 "– This phrase sounds unrealistic to a lot of people living in southern part India, as we don’t have any foreign land close by to which we can drive. 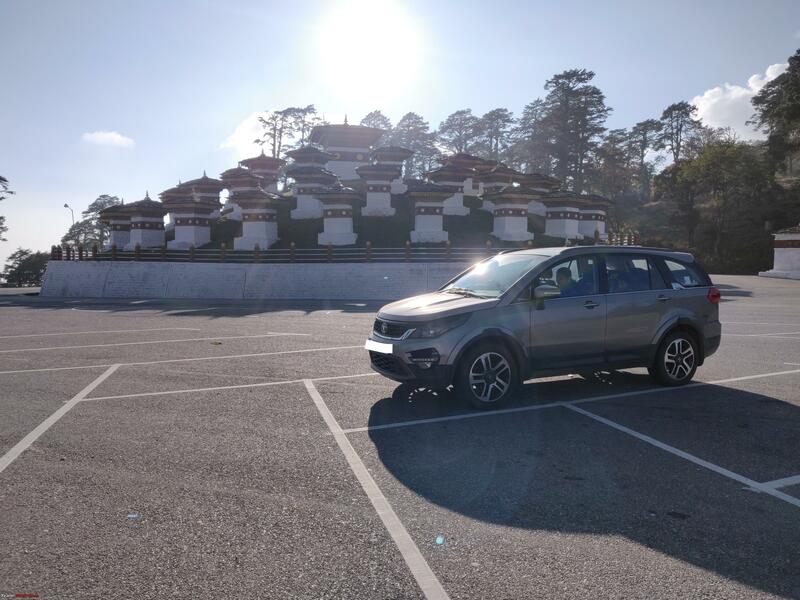 This uniqueness, combined with desire to make our daughter’s first international trip a memorable one, made us drive to Bhutan, from Bangalore. 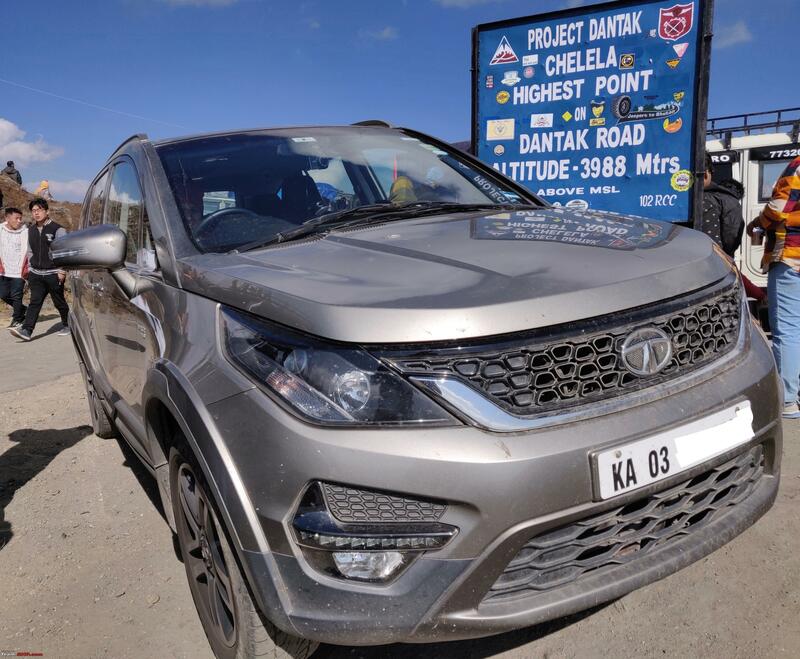 Three of us (myself, my wife and our daughter) and our one-year old Tata Hexa, completed this amazing journey of 6,700 kilometers in 18 days. We chose dates that are convenient to three of us and applied leaves from respective offices and school. Fortunately, all leave requests were approved well in advance and we stepped into next phase of the journey - itinerary planning. 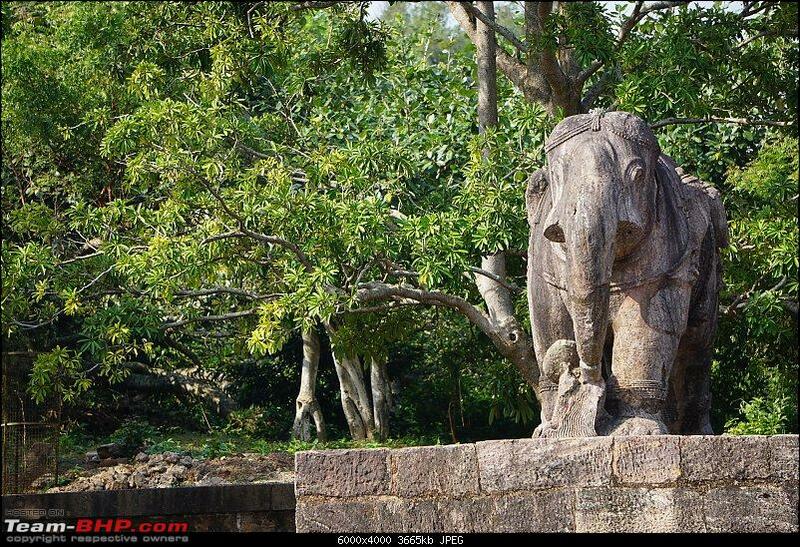 Itinerary was planned based on various blogs, travelogues here and inputs from Parag Sachania. We decided stops based on distance we can cover comfortably in a day and availability of decent hotels. 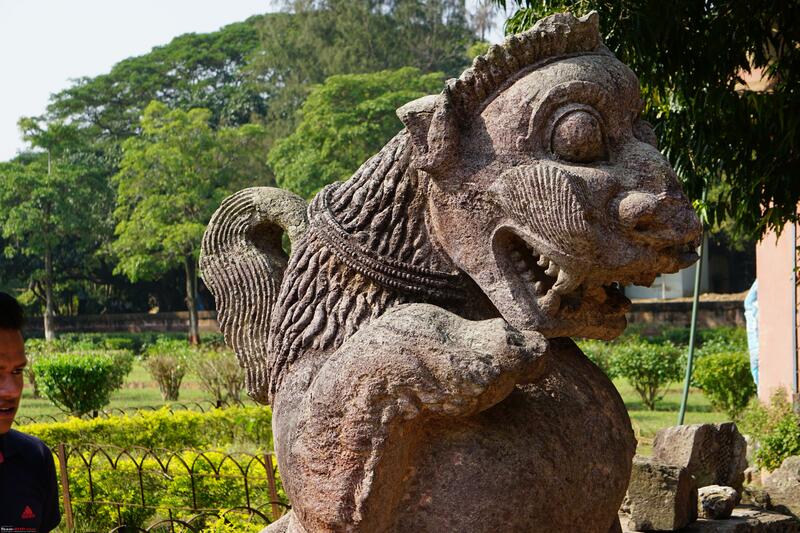 All stays in India were booked on the go. 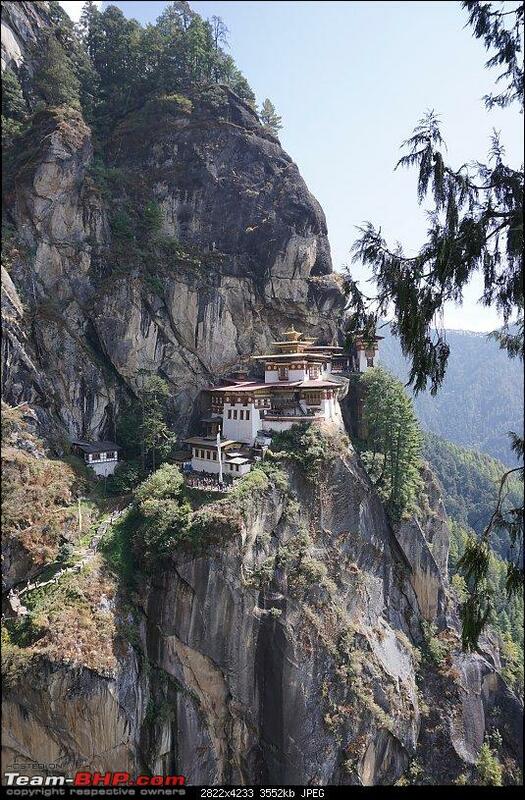 Only few hotels in Bhutan were booked in advance. Some through booking sites and some directly. All bookings were refundable, which proved to be a boon later. As part of preparation, made a list of things we already have and the ones we need to buy. And the later was longer! On the first spot of the list were car related items and documents. Bought double cylinder air compressor, SJCAM dash cam, 5L X 2 safety cans for diesel, jump start cable, tow rope and few miscellaneous items. Also, for the car – did fluid top-up and changed all 4 brake pads under TATA AMC. Listed all documents needed for people and vehicle, took required number of photocopies and filed them in order. Stored originals and copies in two separate folders. This helped to avoid a lot of running around during immigration and vehicle permission. Surprisingly, food that we wanted to carry gained second most important spot in our list! Our uncompromising vegetarian nature was the reason behind. We packed an old Amazon pantry carton full of MTR upma and poha packets, along with dry fruits, biscuits and few packets of snacks. Also packed breakfast cereal, rice, dals, salt and masalas. We even packed (read bought!) a Coleman duel fuel stove, an electric rice cooker, 10 L Tupperware water can and few utensils. After these priorities came in clothes, sweaters, umbrellas, raincoats, toiletries and whole lot of things, which were labelled and packed in three 100L duffel bags. When we finished all packing, and moved all luggage to our tinier second bedroom of the tiny apartment, there was hardly any space left for us to walk out and close the door! Gathered all items in the checklist and completed packing two days before planned start date. 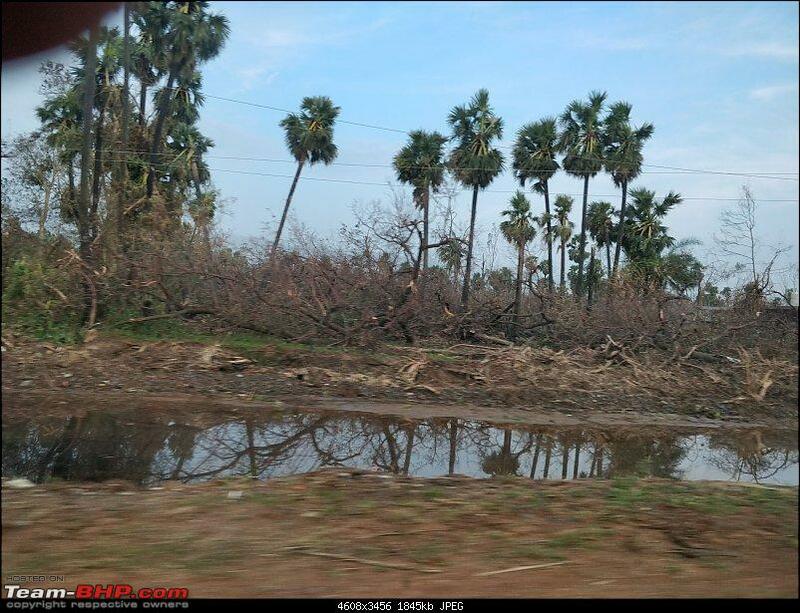 The day we finished packing, meteorology department issued severe cyclone warning for areas around Srikakulam and the cyclone was expected on 11th October. True to the reports, a day before our planned start date, cyclone Titli wrecked some coastal areas of Andhra Pradesh and Odisha and bad weather warning was extended till 13th October. Which made start of our journey filled with some anxiety for us and a lot for our immediate families. However, we struck to planned start date of 12th October. Note : Jump to post 14, if you want to skip rant and go to summary directly. Last edited by prasanna_indaje : 19th March 2019 at 15:35. 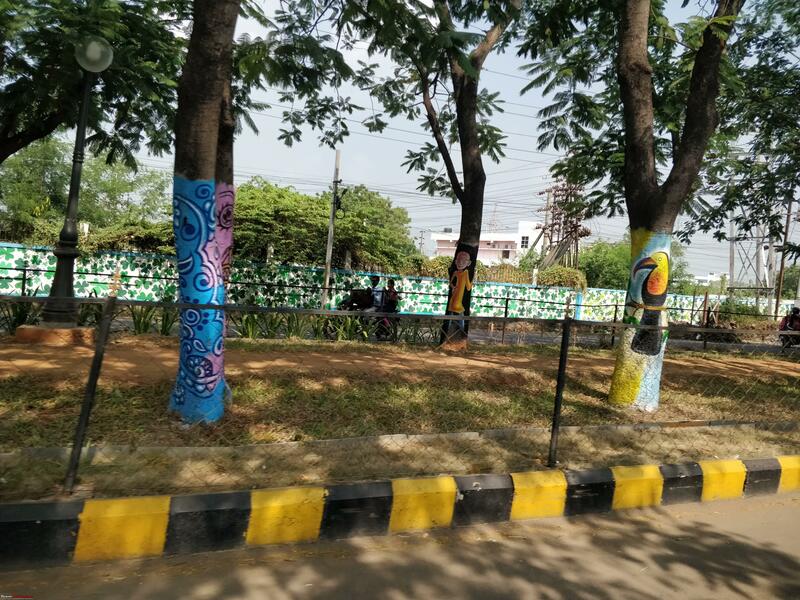 First day started with lot of excitement, some anxiety, faint smell of Dasara holidays in air and a room full of luggage to be loaded into the car. Dropped daughter to school and started loading luggage in the car. Loading, organizing and re-organizing took good couple of hours to complete. After a late breakfast and packing curd rice for the road, picked up daughter from school (fortunately, two days ago they declared a half-day!) and came back home. After one final check of all preparation, we were all set to GO! With all luggage in boot, excited and a little worried about weather, we rolled out of our apartment by 1.30 PM and, this was the moment, for which we waited from long time!. 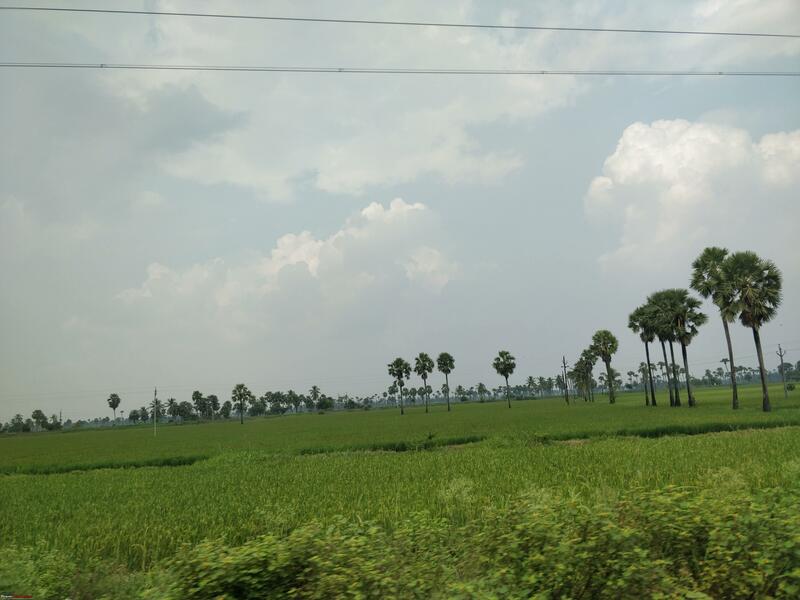 Had late lunch of packed curd rice and pickle on the outskirts of Kolar and proceeded to our planned destination Vijayawada. By 6 PM, while sipping hot coffee in a restaurant near Palamaner, we understood reaching Vijayawada before 12 AM was impossible. We decided to stay in Srikalahasti instead. Drove non-stop from that point and reached Srikalahasti by 8.30 PM. Took a room in APTDC Harita. This hotel has safe parking and a vegetarian restaurant which helped to neutralize ‘Where to have dinner?‘ worry. After checking in, asked the receptionist whether bad weather has eased out and the answer was a sad facial expression with a suggestion to watch news channel. Continued my loyalty to Google news instead, which continuously played the video of 11th October, which did no good job to ease our anxiety, as the video showed how we are helpless if nature becomes unforgiving. Prayed for a better tomorrow and slept well! Day 2 started with the alarm ringing at 4 AM and we checked out of Harita by 5 AM. 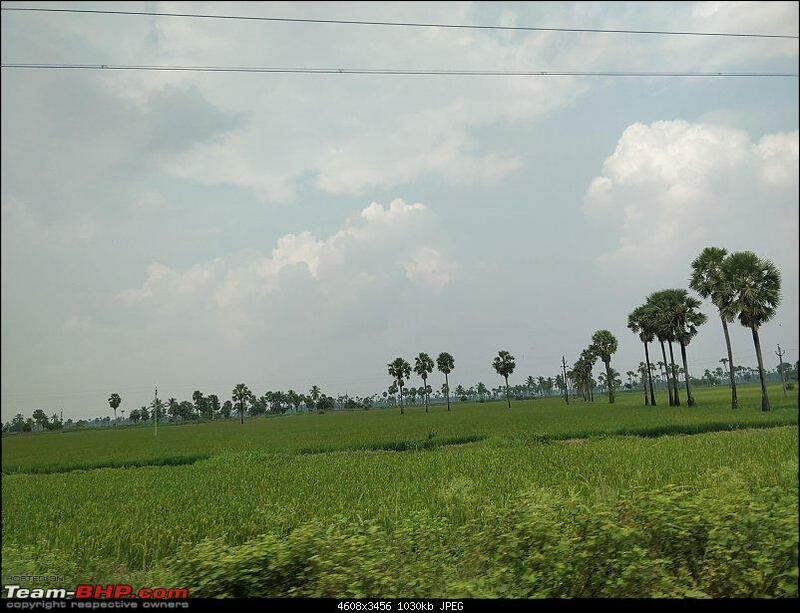 Destination of the day was Srikakulam This early start helped to avoid some traffic till Naidupeta. 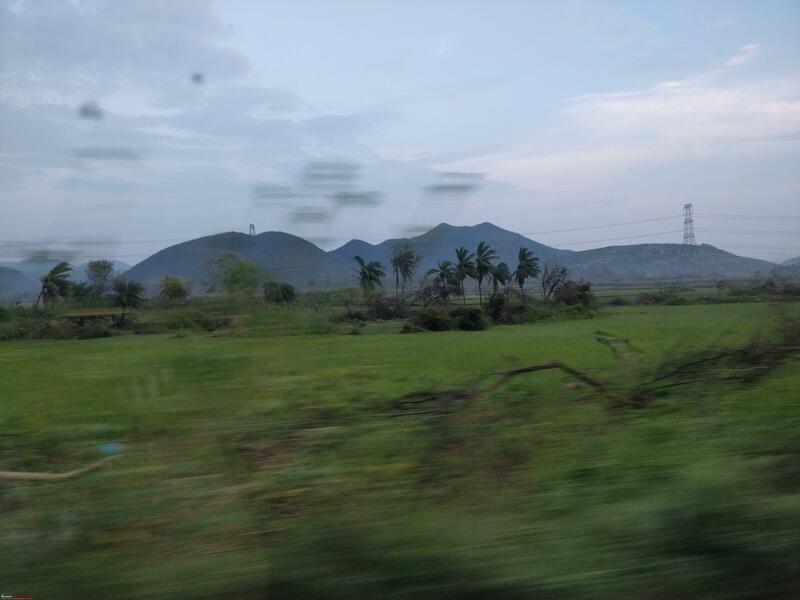 Around 6 AM, we reached Naidupeta, from where we embarked on the lifeline of this journey – NH 16. 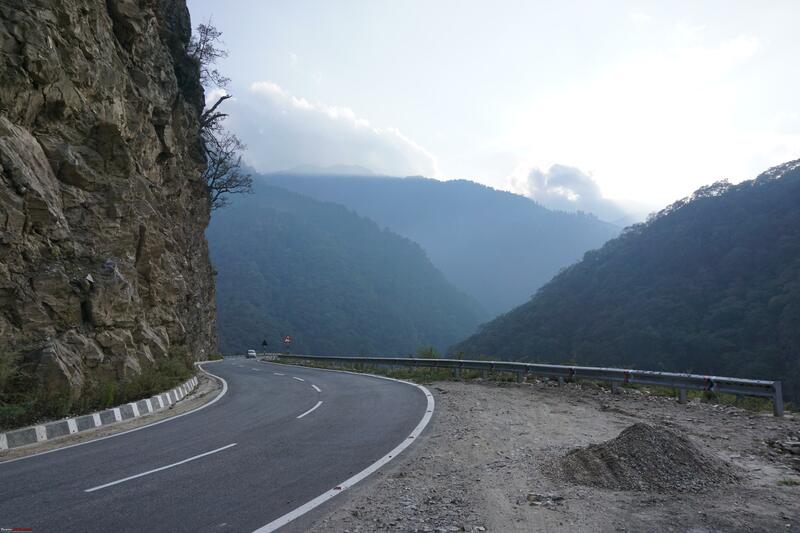 In this entire trip, we spent a total of 4 driving days on this national highway. 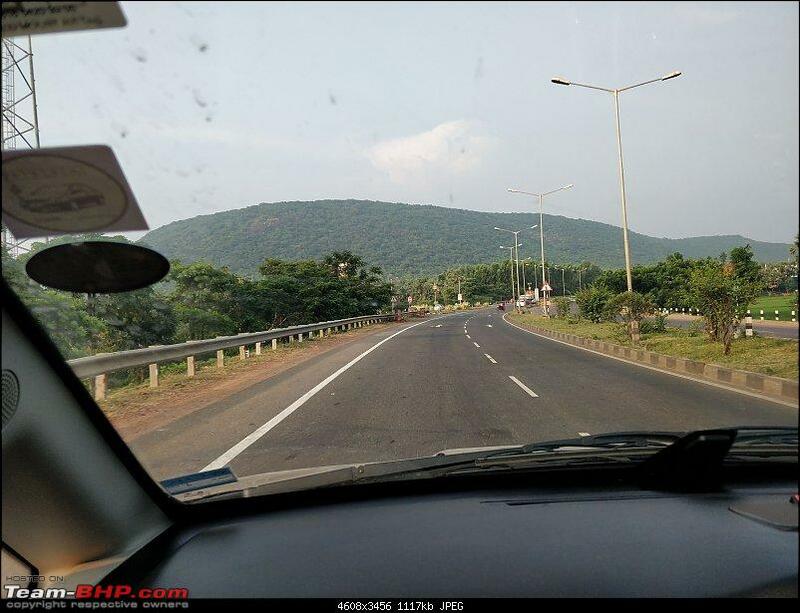 We drove at good pace till Vijayawada and reached around 10 AM. After negotiating city traffic, we stopped on the outskirts to cook some ready to eat breakfast and have it. 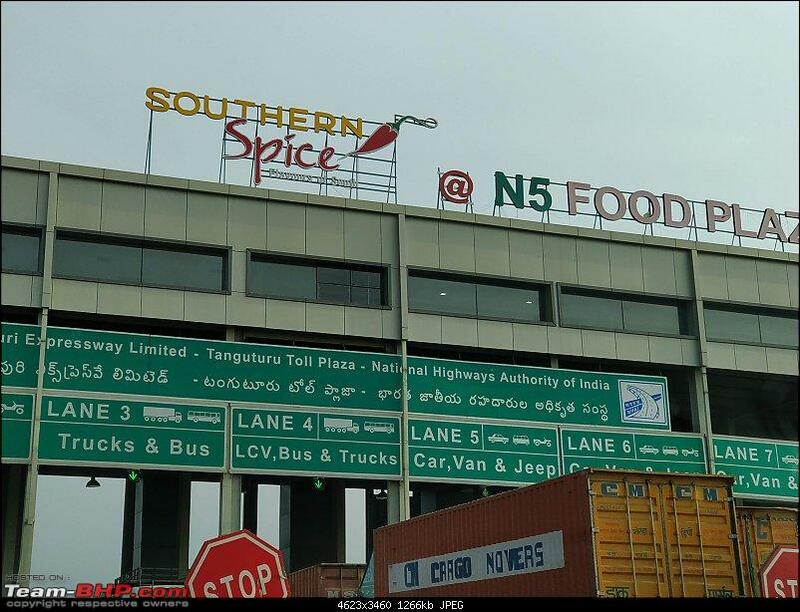 N5 Food Plaza - Good restaurant, above a toll booth, 20 kilometers before Ongole. 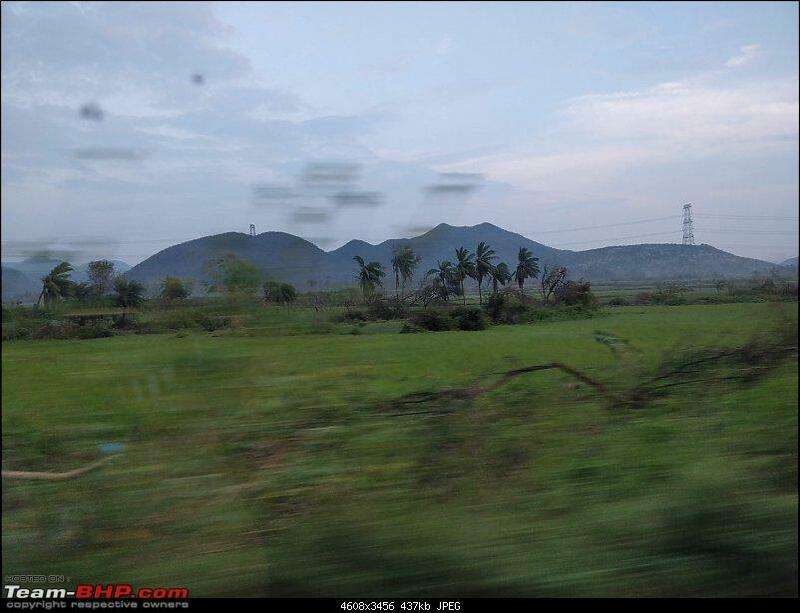 This was our first drive in Andhra Pradesh beyond Tirupati. 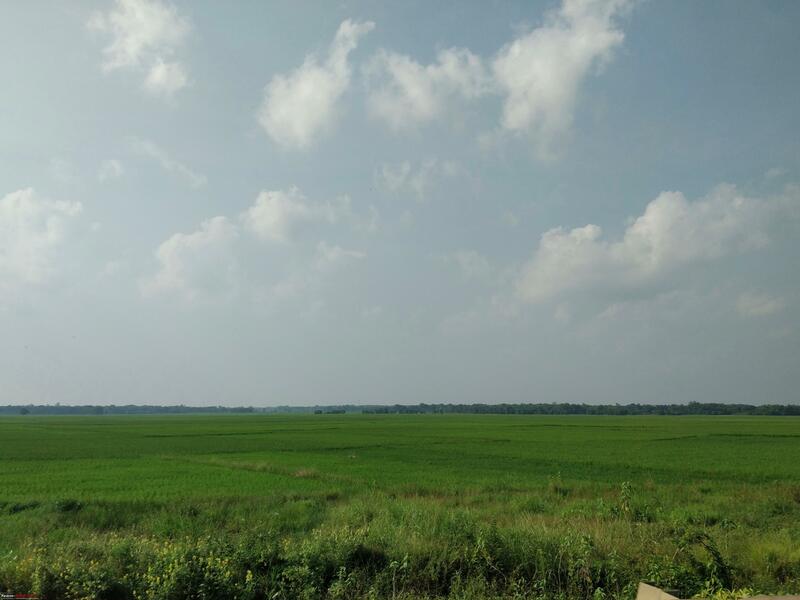 All of us were impressed with sea of lush green paddy fields on either side of highway, spread till horizon. 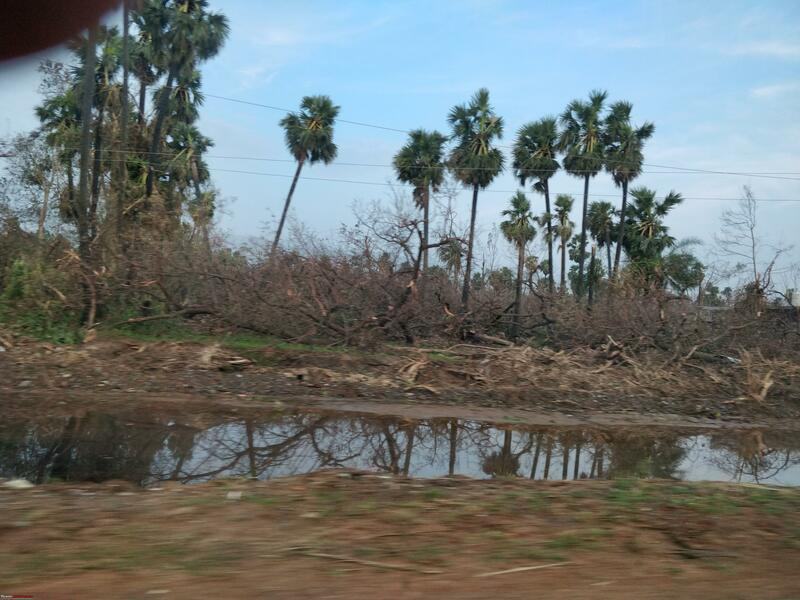 Google Maps deviated us for few kilometers from NH16 and routed us through Rajahmundry. 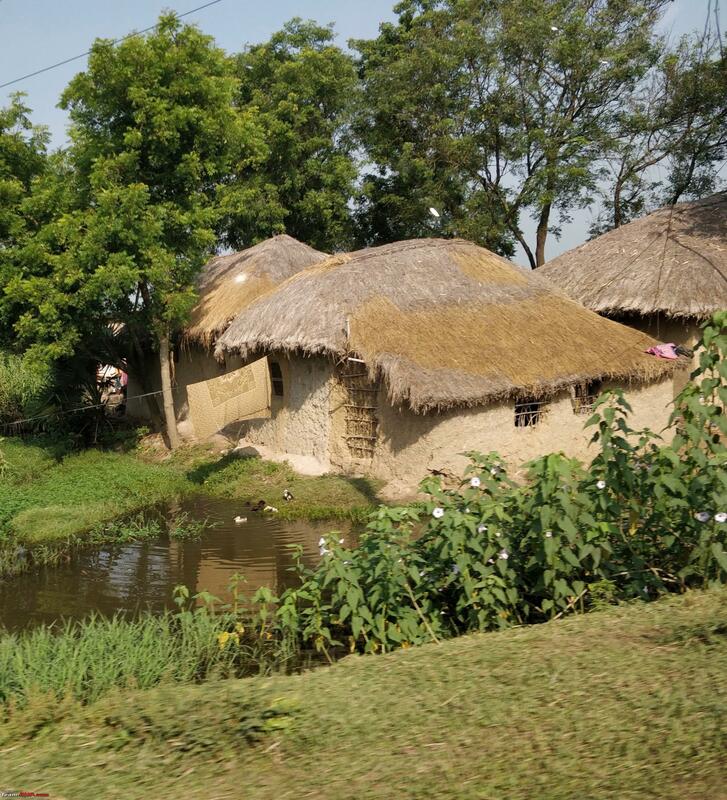 The roads were narrow but gave us enjoyable insight to few small villages and beautiful water canals. Had lunch at a lone vegetarian hotel we found on the way. 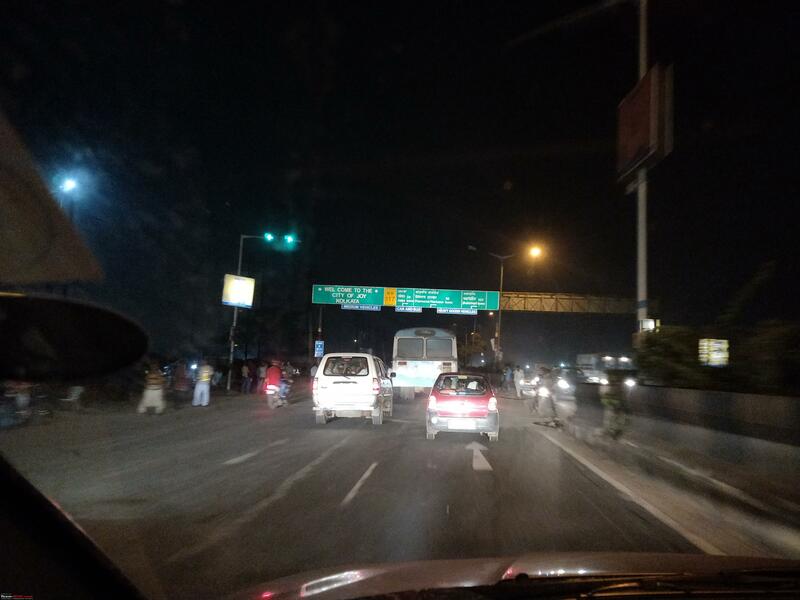 After having coffee in a CCD before Vizag, and struggling an hour and a half to cross Vizag city traffic, we reached our hotel in Srikakulam by 10.30 PM. The hotel (and restaurant) was filled with government officials who were part of relief activities. We were ready to go to bed by 11.45, after first use of our electric rice cooker, to cook the most delicious Bisibelebhath we ever had!. Weather gods were kind on us as we did not encounter any bad weather. Traffic situation as we reached Vizag. Felt at home ! Day 3 started at 5 AM for us and destination was Kolkata. We reunited with NH 16 and immediately started noticing aftereffects of Titli, the storm. 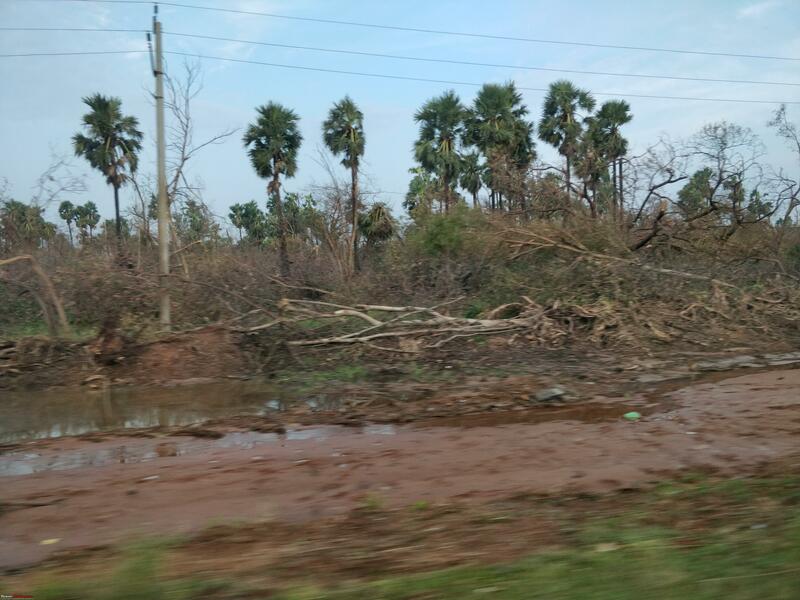 Storm showed its supremacy by leaving uprooted trees, destroyed paddy fields, fuel pumps / houses/ warehouses without roof, upturned large container trucks and a lot of other destruction. Some villages were just getting their people back from rehab centers. 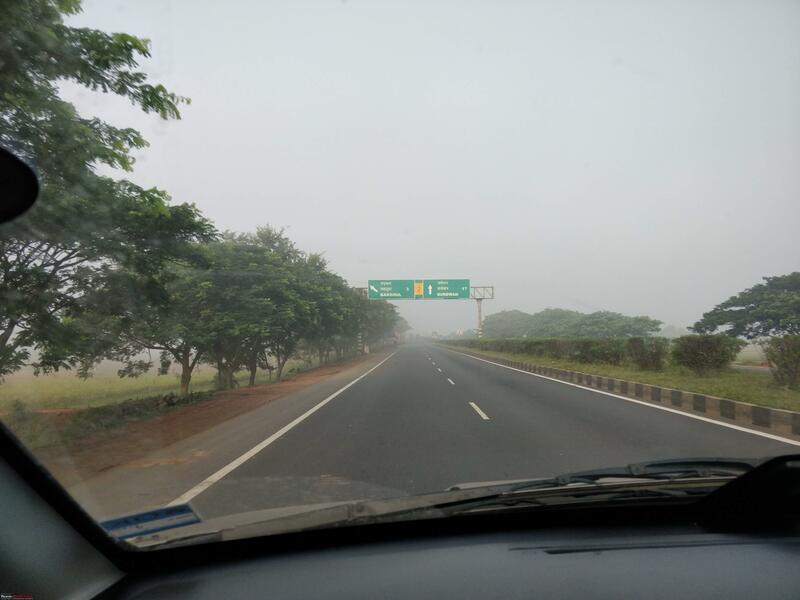 Despite of storm and aftereffect road was good, and we entered Odisha by 7.30 AM. 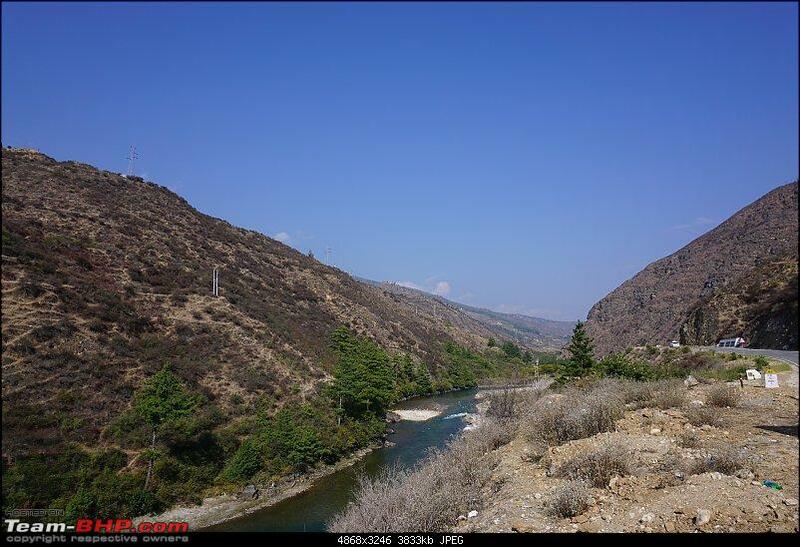 It was a smooth crossing as there was no line of trucks blocking our way at the border. Before Brahmapur, we stopped at a small eatery by highway and had few tasty V(B)adas along with green peas curry for breakfast and few Jamoons too as desert!. Sweets along with breakfast was new combination to us and we enjoyed it. 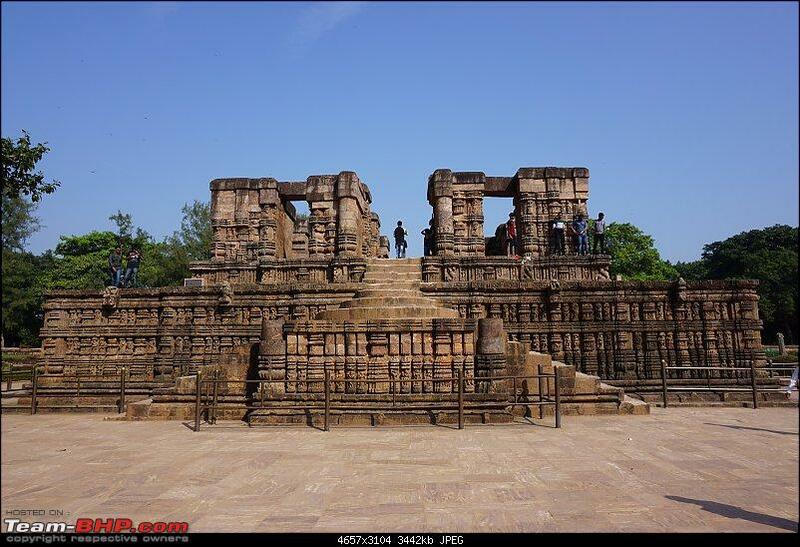 We crossed Bhubaneshwar around 1 PM and planned to stop at next pure vegetarian hotel that we would see, for lunch. In the process of finding a pure vegetarian hotel, we crossed Odisha – WB border, crossed few Durga puja pendals, crossed Kharagpur, entered Kolkata, booked a hotel in Park street, checked in to the hotel and finally found a vegetarian hotel by name ‘Hakuna Matata’. But, it was dinner time and we had dinner instead of lunch!. 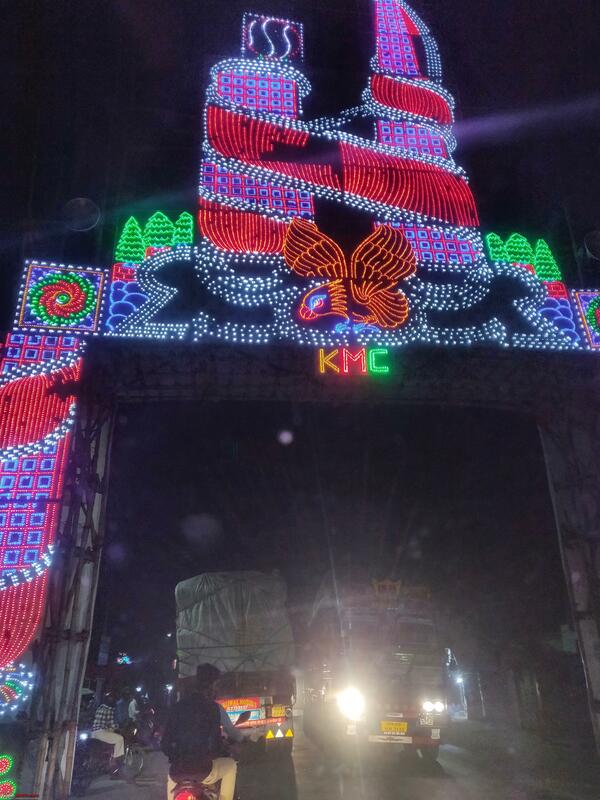 Kolkata, city of joy, with all Puja decoration on in white and blue, was looking like a wonderland. City of Joy, welcomes us. Fourth day started at 6 AM. 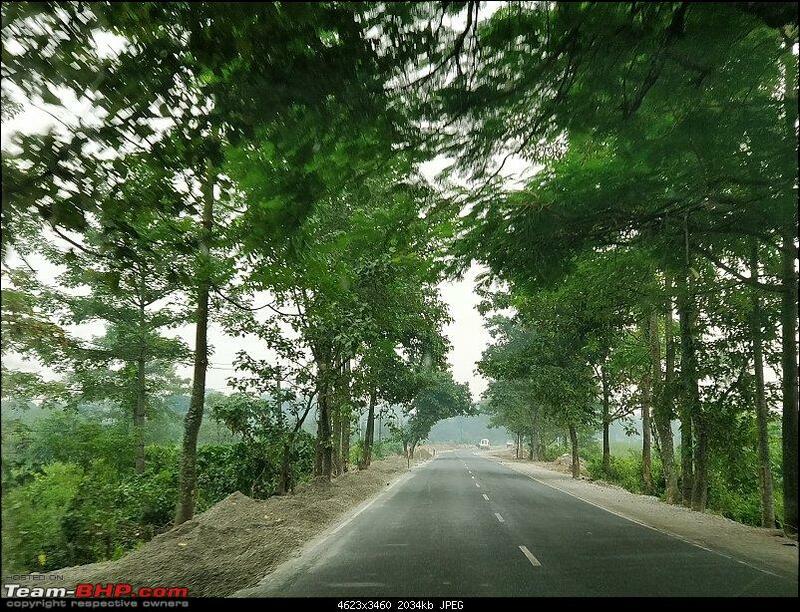 We came out of Kolkata in no time and were cruising comfortably on 4-lane highway towards Bardhaman. 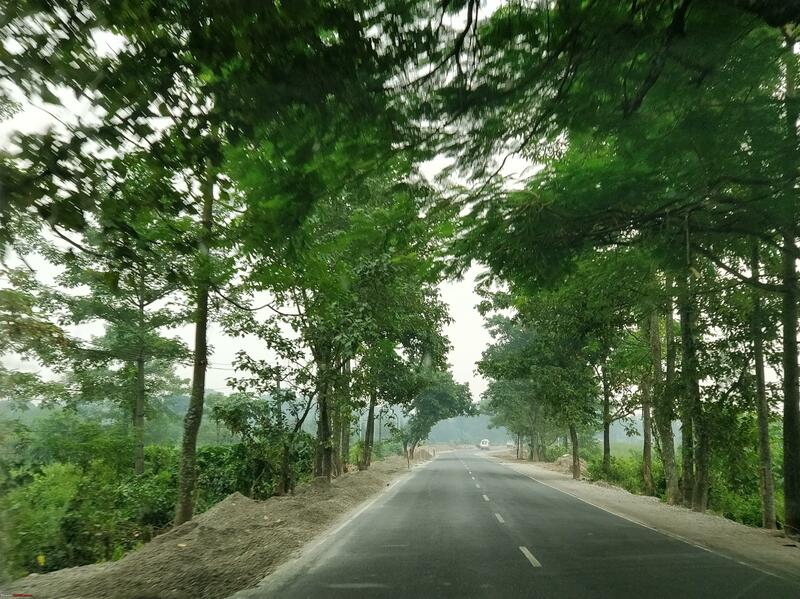 Early morning drive towards Bardhaman. 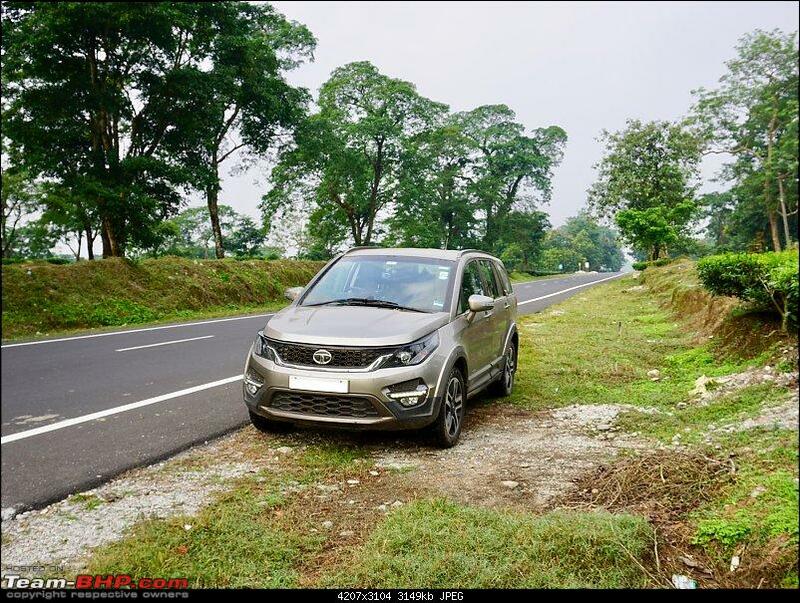 We covered those 120 odd kilometers under 2 hours and at some point of time we were even dreaming of reaching Siliguri by 4 PM. 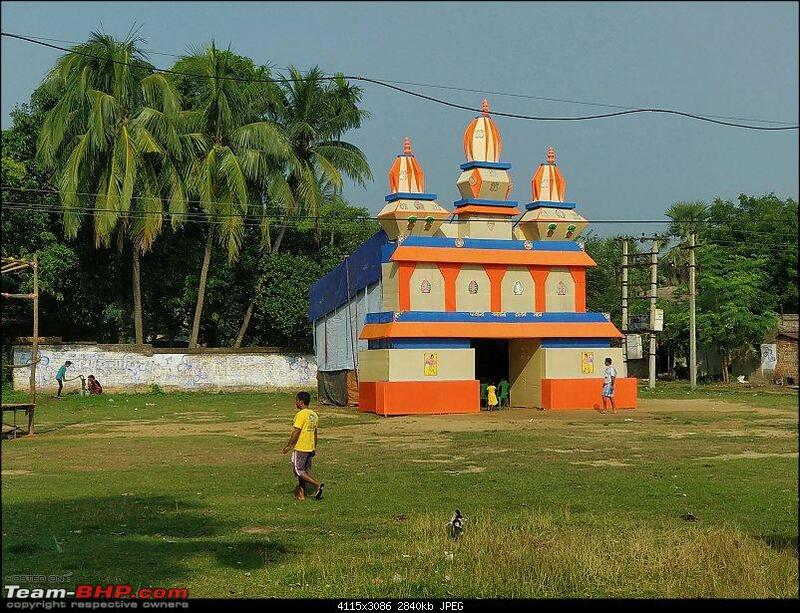 Dream shattered as soon as we took deviation to SH7 from Bardhhaman. From here it was a narrow state highway for another 100 odd kilometres, which took us through beautiful paddy fields, lovely canopy of trees in some places, crowded railway crossings, weekly village markets, herds of sheep / cow, endless line of bicycles who would budge only after 30 seconds of continuous honking, occasional encounters of depleted private buses with people on top and beedi smoking driver, series of speed breakers / barricades and infinite number of livestock and humans (walking, on bicycle and two wheeler) deciding to cross the road in front of the car at last moment. 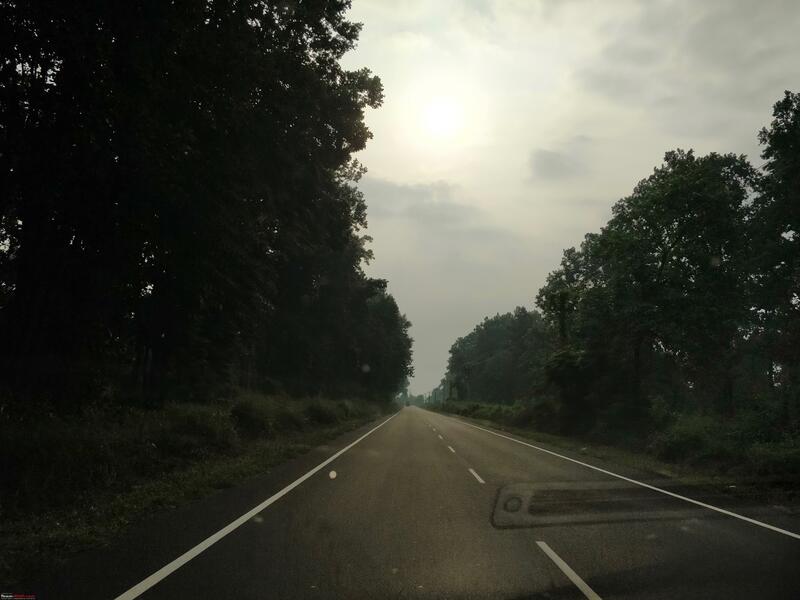 Post this adventure on SH7, we joined another national highway for a short stint full of potholes and then NH34 till Siliguri. 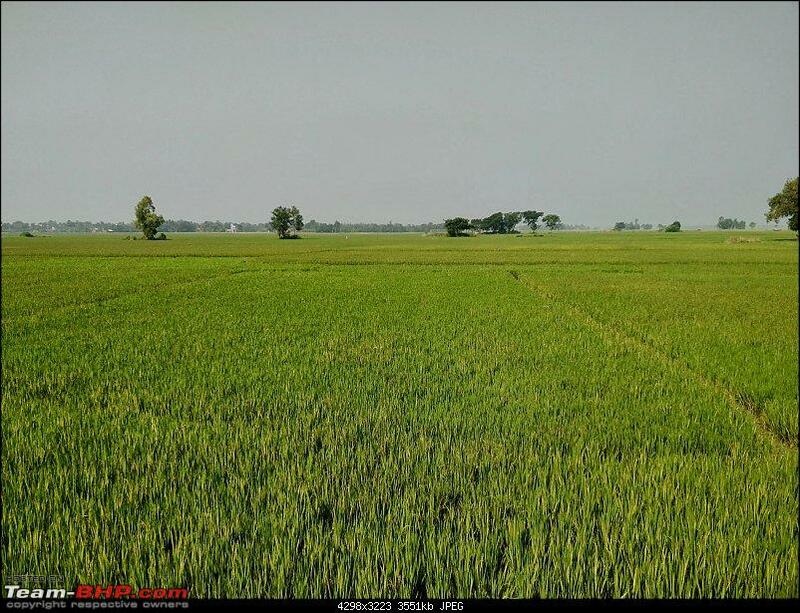 Beautiful and endless paddy fields of Bengal. NH34 is a NH for namesake. Some stretches are 4 lane and some are no lane. 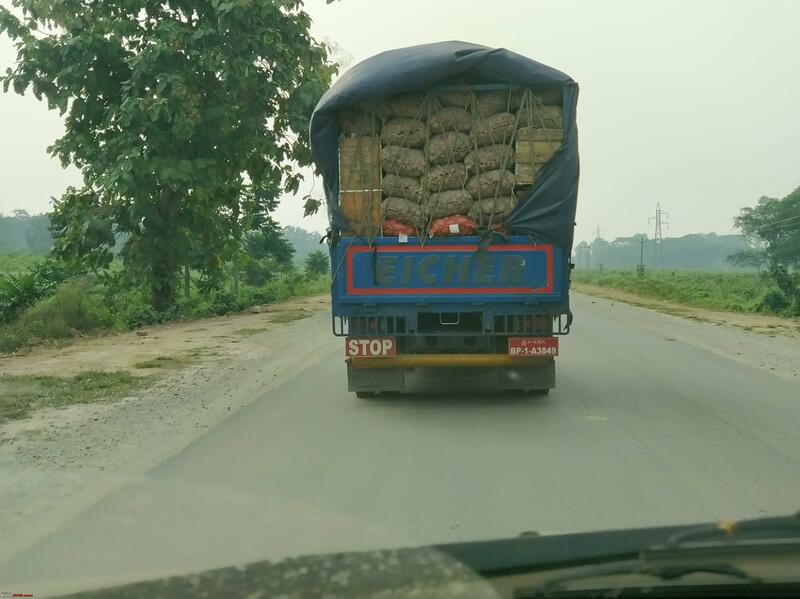 One needs to keep driving on wrong side of the road for few kilometers every now and then because correct side is blocked by 3-4 lines or trucks waiting to cross some check post or road blockade ahead. 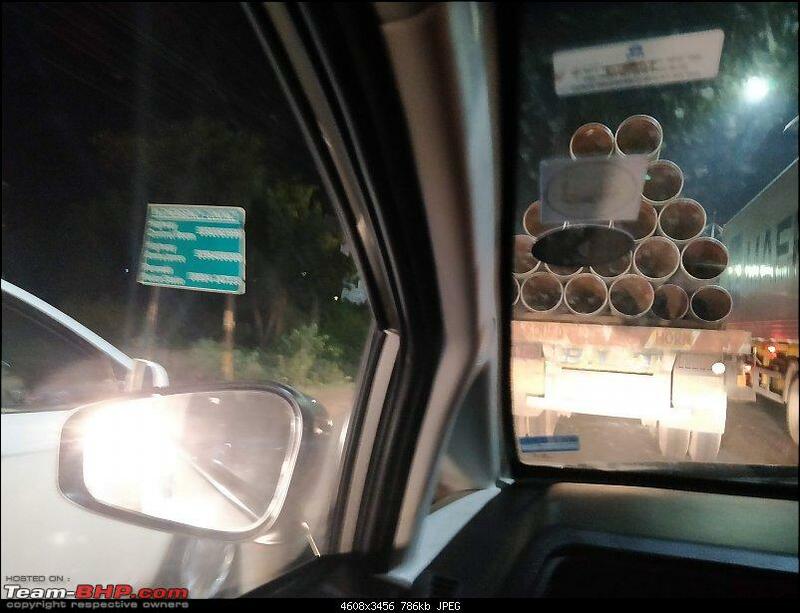 So, thumb rule is that, if you start seeing line of trucks not moving, switch to wrong side. 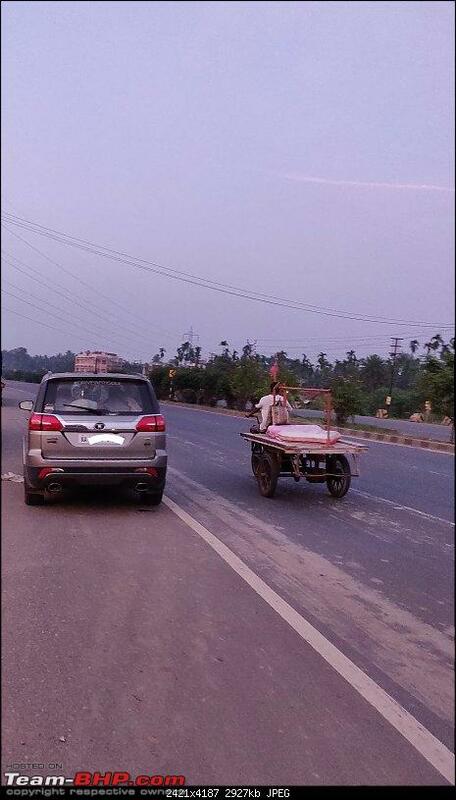 If you are not too confident of driving on wrong side, like me, wait for a 4-wheeler with local plates and follow them. They will drive ‘like a boss’ on the wrong side. If you miss to switch to wrong side on right time, don’t worry, truck drivers, policemen and locals will stop and ask you to switch to the other side. 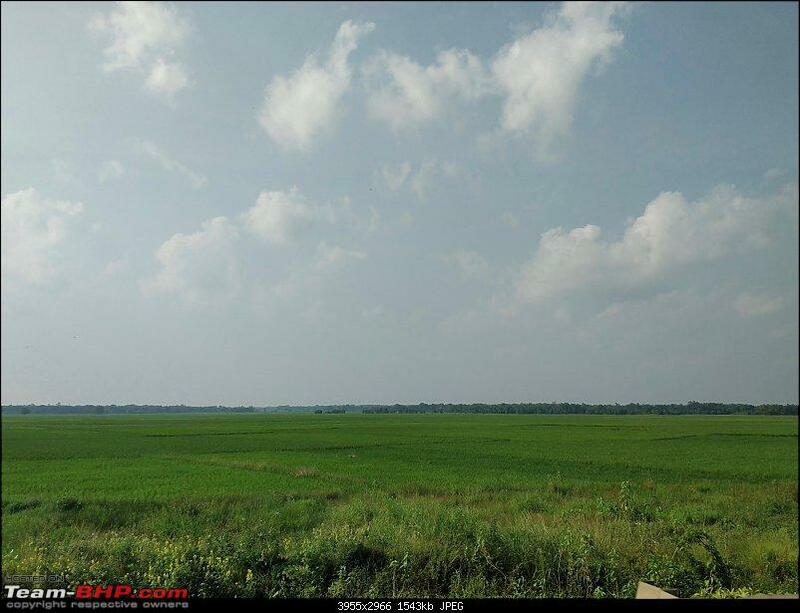 There are few driver’s nightmares such as Malda, Kalichak, Farakka barrage and Dalkhola. 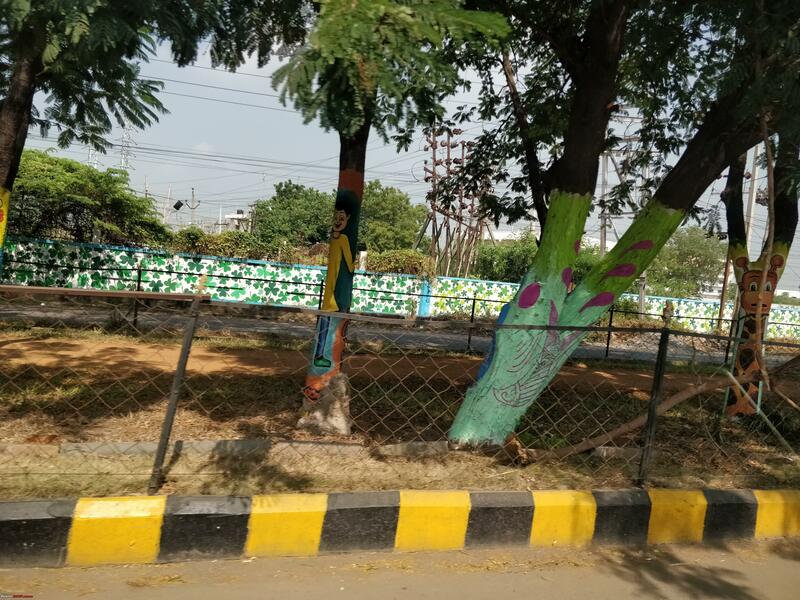 Traffic deadlocks at these places have the capability to make one appreciate how smooth and fast Bangaluru’s KR Puram and Silk board signals are. 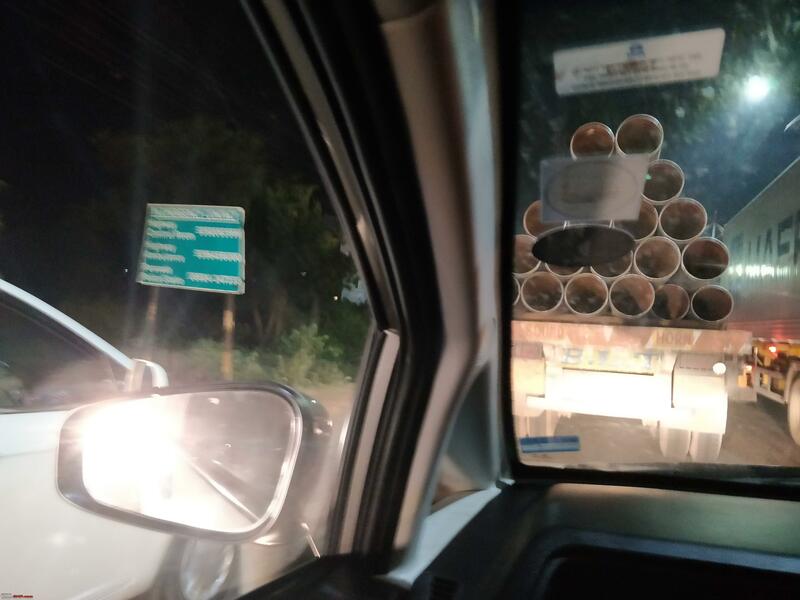 I was promptly struck for more than an hour in each bottleneck and at few more places (Islampur and a couple of other locations), despite of act of kindness from truckers, who let me merge from wrong side in many occasions. On two lane roads with endless line of trucks , norm for the cars is to drive on the right most side of the road (leaving space for oncoming traffic) and then merge to line of trucks when possible and keep repeating the task either until end of bottleneck or till a heart in mouth situation where an oncoming 14 wheeler truck passes within few millimeters of your car’s left side. Truckers are kind and they let you merge in most of the cases. 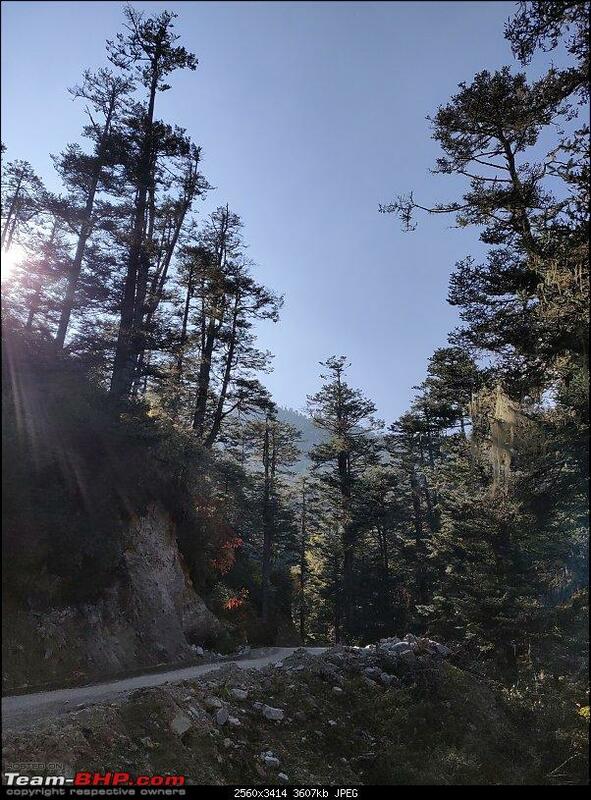 Google Maps was constantly prompting to take Raskhova road to bypass Dalkhola jam, and I ignored it because it was already dark and was not very sure of the road conditions. Instead chose to stick to NH12. Needless to say, we did not get any vegetarian hotel en-route for entire day and stuck to our stock of MTR ready to eat and fruits combo. After fighting this battle on wheels for 17 hours, we reached Siliguri by 10.30 PM. Checked in to our hotel, which was pure vegetarian (Cinderella) and rewarded ourselves with nice dinner. Next day’s plan (also a dream!) was to cross an international border by car, and we were just a night away from realizing that. 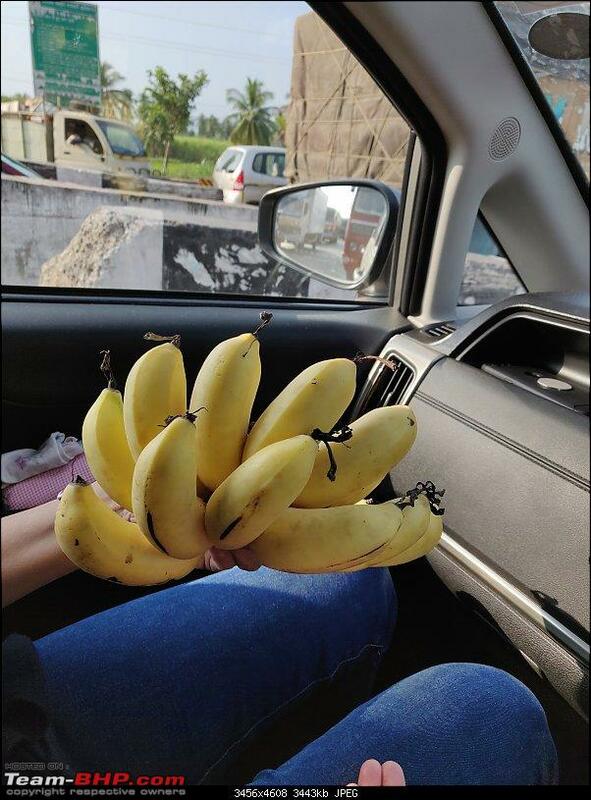 Last edited by moralfibre : 22nd March 2019 at 09:52. Reason: Removing a picture. As requested. Day 5 (16th October) saw us starting from from Siliguri by 6 AM and we were surrounded by tea estates in no time. Crossed coronation bridge by 7 AM and after driving through good 2 lane roads for 3 more hours, we reached Jaygaon, which is a border town. Navigated through thick traffic where everyone was honking as if there is no tomorrow. 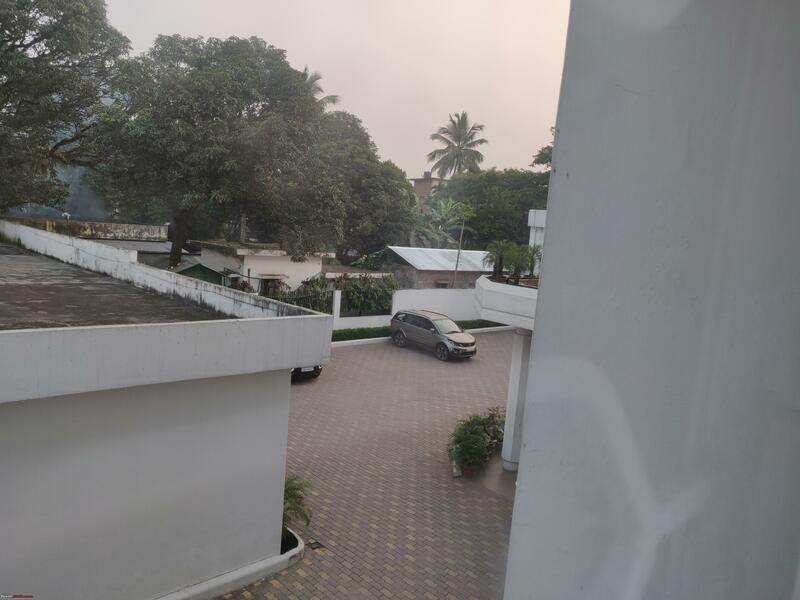 View from the room - Siliguri. 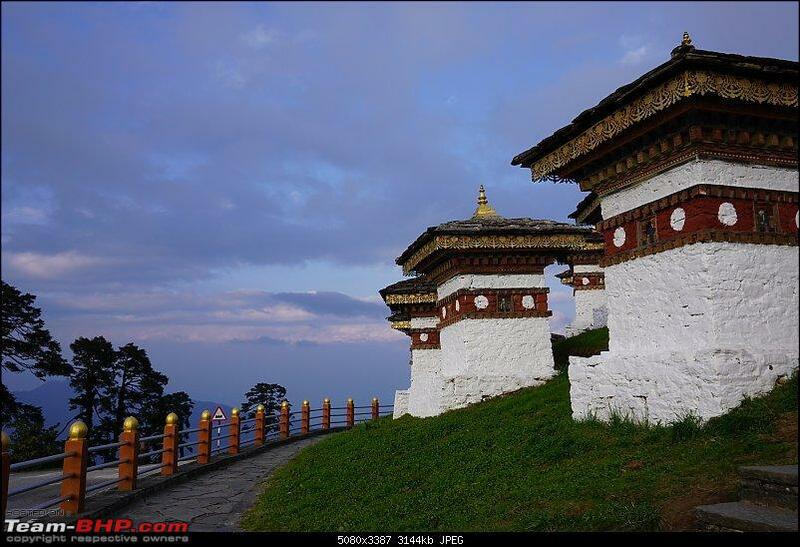 Finally, we saw the huge arch with a gate which separated India and Bhutan and entered into it with cameras rolling. 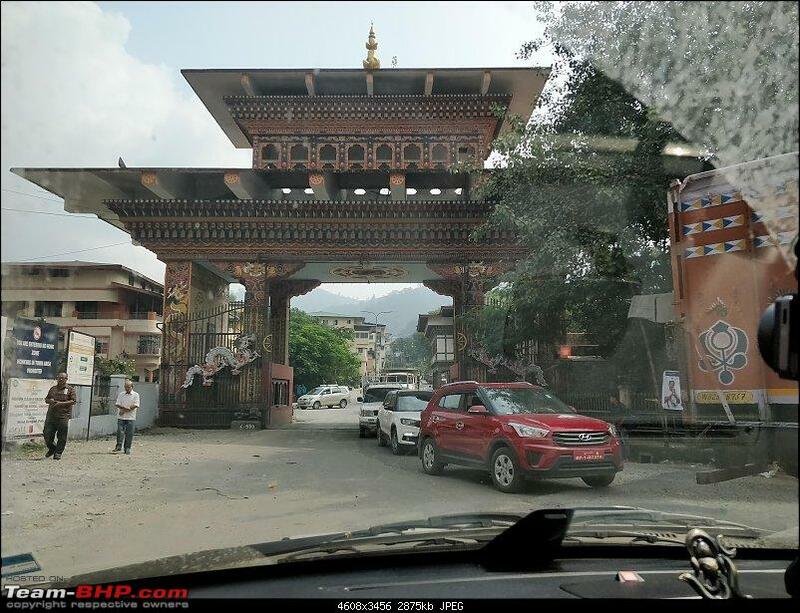 But, as soon as we entered, a police officer came running, with signature Bhutanese smile and told us to back up and take another gate, as only heavy vehicles were allowed from the gate which we entered. So, we exited the foreign land as soon as we entered! But, we entered from here ! 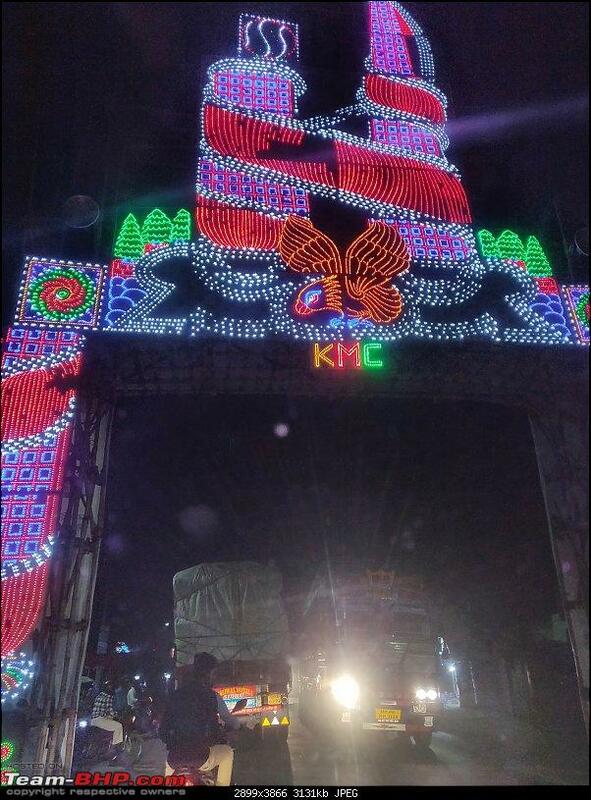 Closer look of the gate (from which we entered). 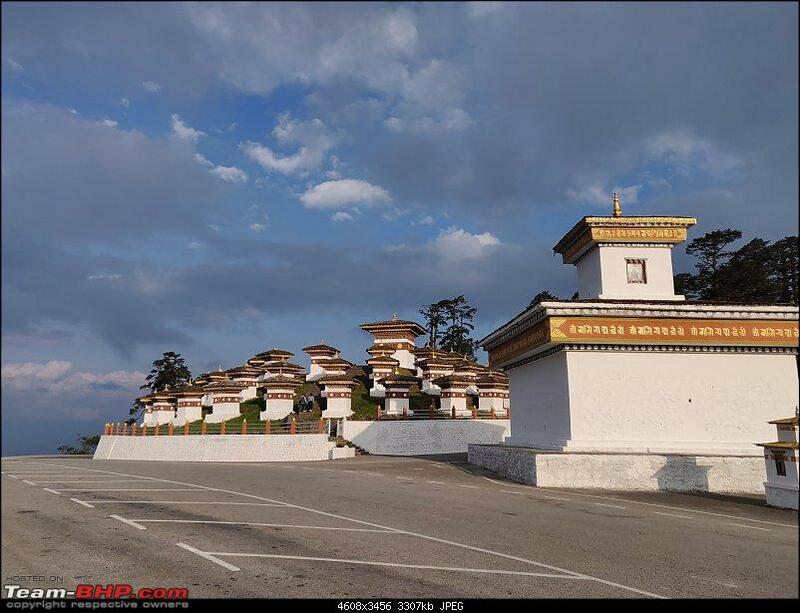 We took the detour as suggested and entered Bhutan from another no frill gate. Now we were in Phuentsholing, border city from Bhutan side. 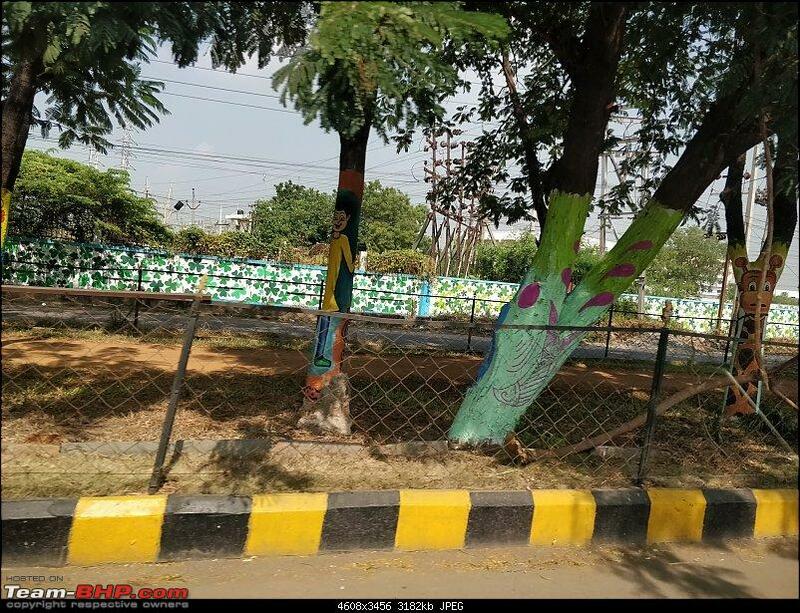 Police officer at that gate asked “Ismein kya hai ? ” looking suspiciously at the overflowing boot, covered with an old bed sheet. After explaining him how we drove from Bangalore, how long we took to reach there and why so much of luggage, he, with a smile, guided us to immigration office. 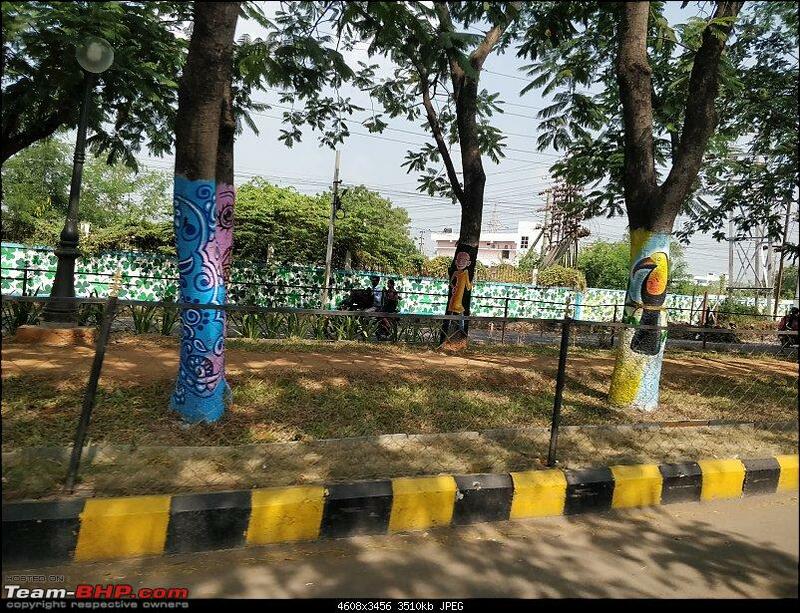 However, we did not understand directions given and with help of NaviMaps app, we reached immigration office, which was crowded like Bengaluru’s Kempegowda bus station on a Friday evening. Obliviously, there was no parking anywhere nearby and we parked half a kilometre ahead. It was 10.30 AM, when we entered the crowded immigration office complex with all documents, copies and empty stomach. It took us 30 minutes to collect the immigration form and figure out which queue we should be standing in. Immigration process kicked in, once we were in the right queue. Step 1: Collect free immigration form from a counter (well, it’s a table with a tear-away book of immigration forms and mostly no one around). 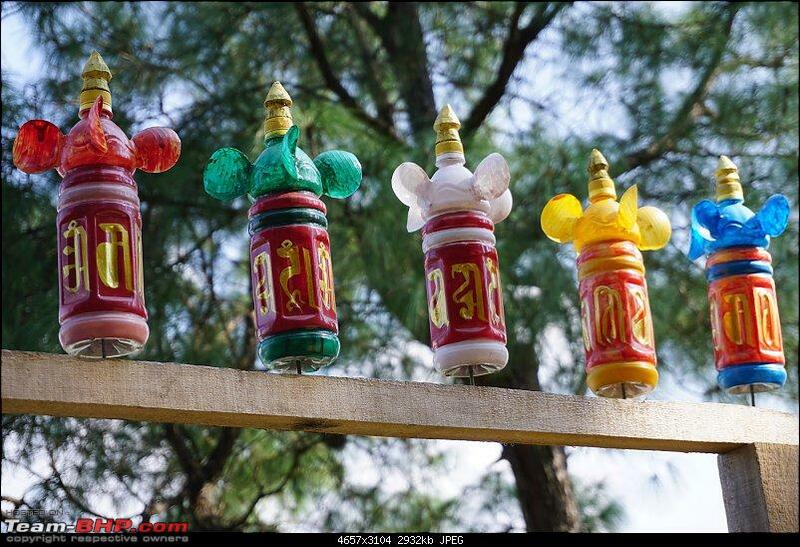 If unable to locate, ask any local in Bhutanese attire. Step 2: Stand in the queue for document verification, in the ground floor. One person per group is enough. He / She should have documents for all members in the group. Depending on the length of queue, number of people inside actual immigration floor (1st floor) and the mood of officer verifying, queue will move. Also, this queue will be full of travel agents with 5 to 30 applications. When your turn comes, officer will verify all documents and grant a token with serial number, which will be called later for entering 1st floor, where visa will be stamped on the passport or an entry permit will be issued. Once the number is called, go to first floor. Step 3: This is the last step (hopefully). Once the number you got from previous step is called, you need to enter to first floor (Good amount of strength is needed to enter first floor as you need to overpower your fellow countrymen (mostly) who are gathered around entrance) and stand in a queue, out of many queues, which end in front of an immigration officer behind glass panel. 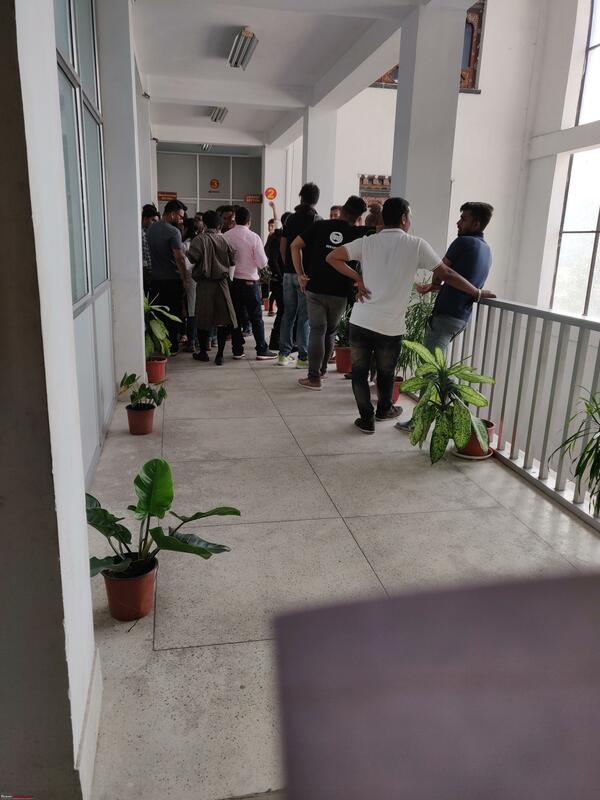 Don’t go by the length of queue, but gauge how fast the queue moves. (We stood in a shorter queue and came out last!). Immigration officer will verify all documents, take your photograph, take all fingerprints and grant you a visa / entry permit. Here an hour or two can be saved, if all members in the group have passport. Visas are stamped on the passport directly and immigration officer signs him/herself. In case of no passport, they will issue an entry permit on a sheet, which must be signed by a superior officer and this process will take an hour or two to complete. We got token number 168, just before office closed for lunch at 1 PM, for an hour. We had lunch at hotel Ashoka and joined group of people who were waiting for their turn at the entrance to first floor. Our number was called by 2.30 PM and we dragged ourselves to first floor and chose the shortest queue. And we came out by 3.45 PM. Please note, people who chose longer queues came out by 3 PM. 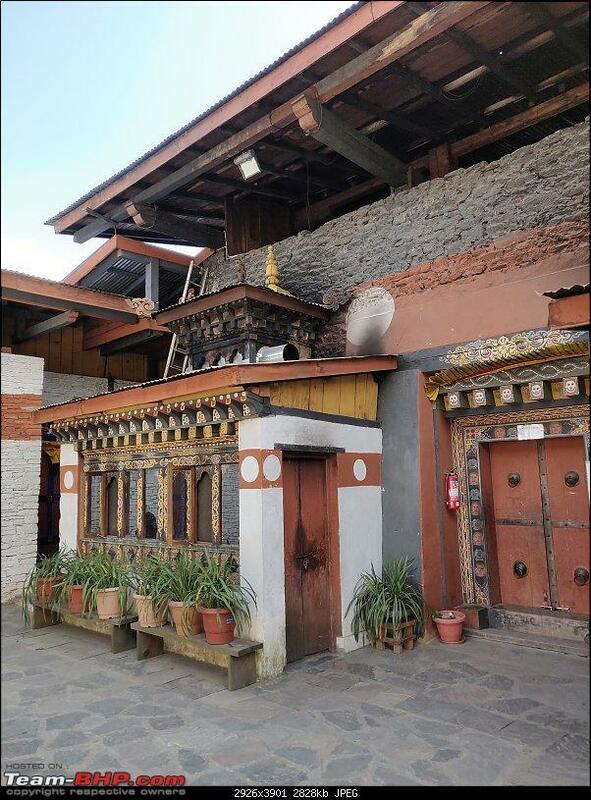 All three got our passports stamped with a 7 day visa permitting us to visit Thimpu and Paro districts. Next task was to get permit for the car. 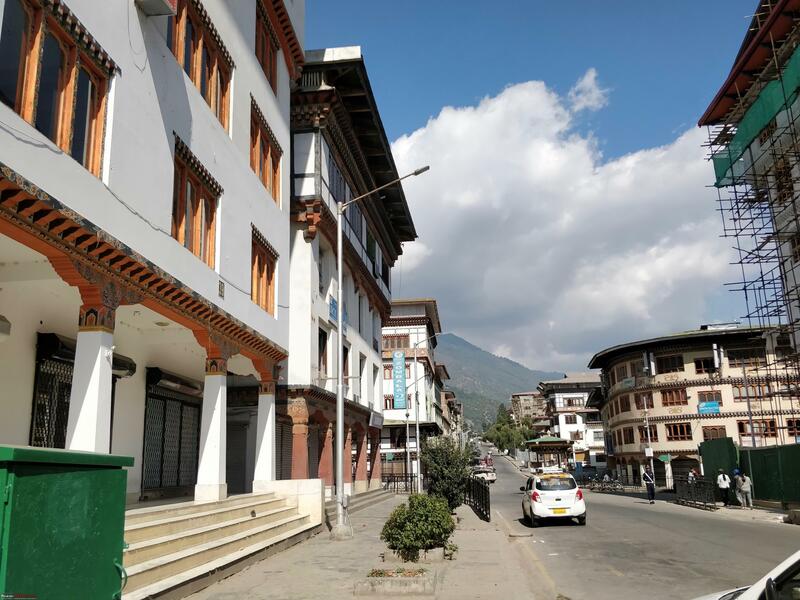 RSTA at Phuentsholing closes for business by 3.30 PM. We still wanted to test our luck and rushed there. Spoke to the officer, who repeatedly said, with a smile, that nothing can be done that day and we must come next day. 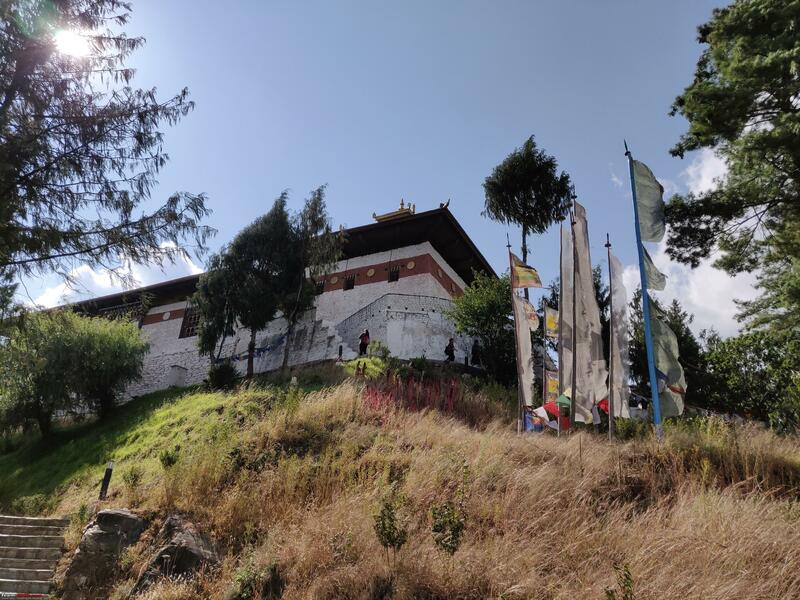 In the process of convincing us, he even said that RSTA office at Thimphu will be open on 19th, though it is a national holiday in Bhutan, which either was a lie, or he was not informed. Another point he emphasized was how important the ‘agents’ were. He strongly suggested us to go for services of some agent as it has the potential to save us lot of time and would save us from many hassles, which we might face during our remaining days there . 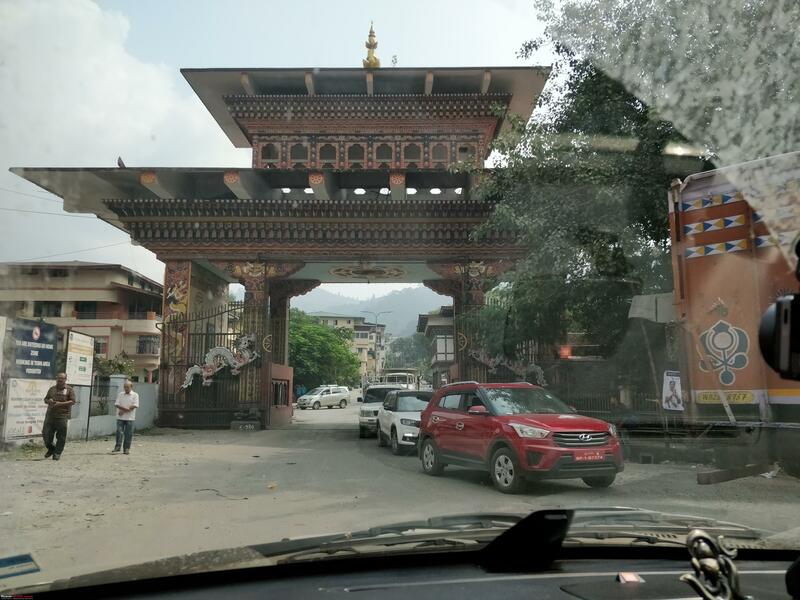 When we finally understood that getting vehicle permits on that day was impossible, we checked in to the hotel we had pre-booked and took scroll in Phuentsholing market. Which still is a positive change from our crowded cities. Had dinner at hotel Ashoka again and retired for the day. 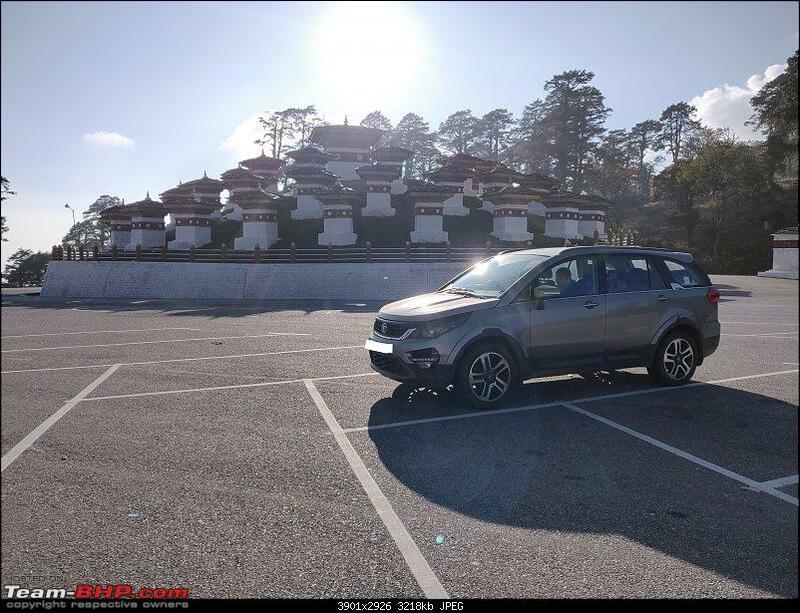 Hexa, parked near Hotel Park ! Last edited by prasanna_indaje : 19th March 2019 at 15:52. Day 6 (17th October): Still entangled in process. RSTA office opens at 10 AM. But overenthusiastic me work up at 7 AM, filled vehicle permit form that I bought previous day, took all document copies and walked towards RSTA office after having breakfast. At 8.30 AM, few of my newfound pals from previous day’s queue(s) were already present there waiting for the office to be open. At around 9, an agent walked in and asked us to number the application forms in the order we came in. A volunteer collected and numbered all forms and handed over to him. Upon collecting, the agent revealed good and bad news. Bad one was that, 17th too was a holiday due to elections next day, however, the good news was that there will be few staff working because a lot of vehicles (tourist and private) seeking entry on that day. Everything seemed normal till that point. 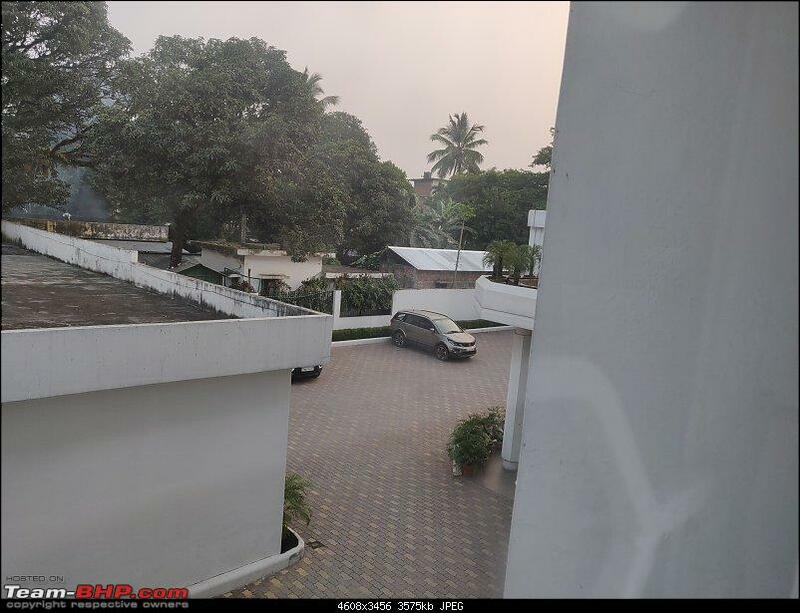 However, after few minutes he made a further shocking reveal that there will be an additional ‘service’ fee of Nu 500 per vehicle seeking entry on that day, in addition to Nu 100 per day charge imposed by RSTA. He completed his statement saying, there will be no receipt given for Nu 500. There were two options for us, either proceed with the plan after paying ‘additional’ fee or wait for 4 more days in the border town and proceed without paying the ‘special’ fees. We (all of us present there on that day) chose the first option and handed over the ‘actual’ and ‘special’ fee along with copies of required documents to the agent (note: ‘handed over to the agent’, we did not deposit the cash at the counter). Agent disappeared with the cash inside office and came back after 45 minutes, with a bunch of printed receipts and handed over to respective owner and asked us to wait for some more time. He continued collecting ‘fees’ from people who arrived after us. After frustrating wait for another hour, the same agent came out with few permits and distributed it people who submitted first. 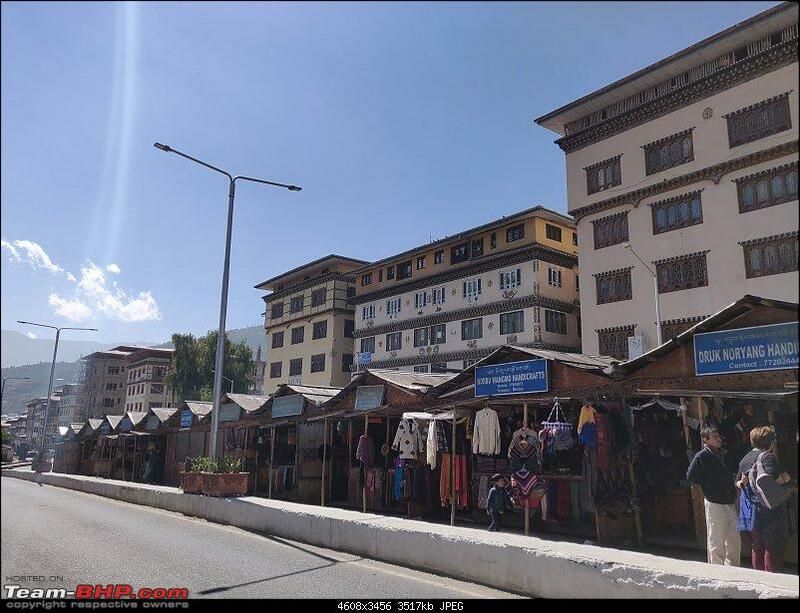 By the time I had vehicle permit in hand, it was 12 noon and I realized that chances of getting the permit from Thimphu on that day were slim, actually impossible. In the entire process, no one bothered to check original documents. Ran to hotel with trophy of the day, the permit, fluttering in hand and left the hotel by 12.30 PM. 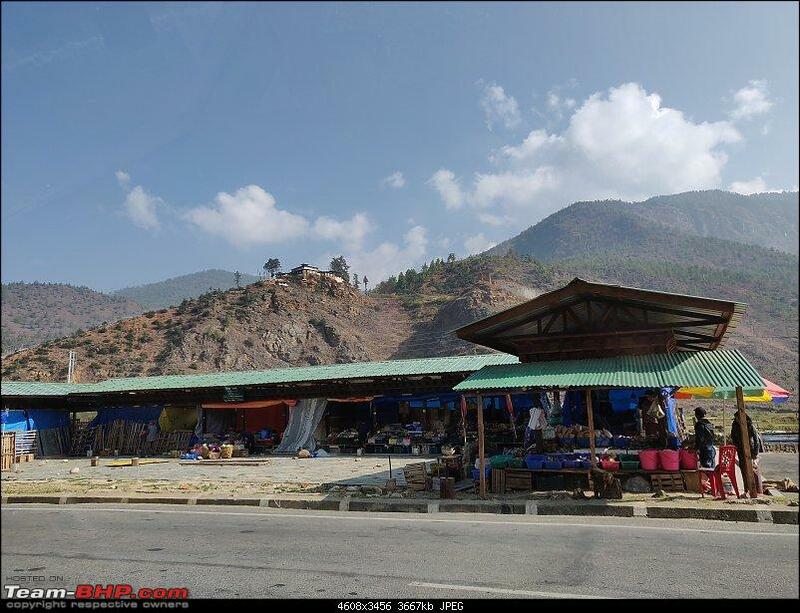 4-5 kilometers towards Thimphu, after filling fuel in a small Indian Oil bunk which does not accept credit cards, we reached first immigration check post. We stopped here to get our passports stamped and vehicle details entered. 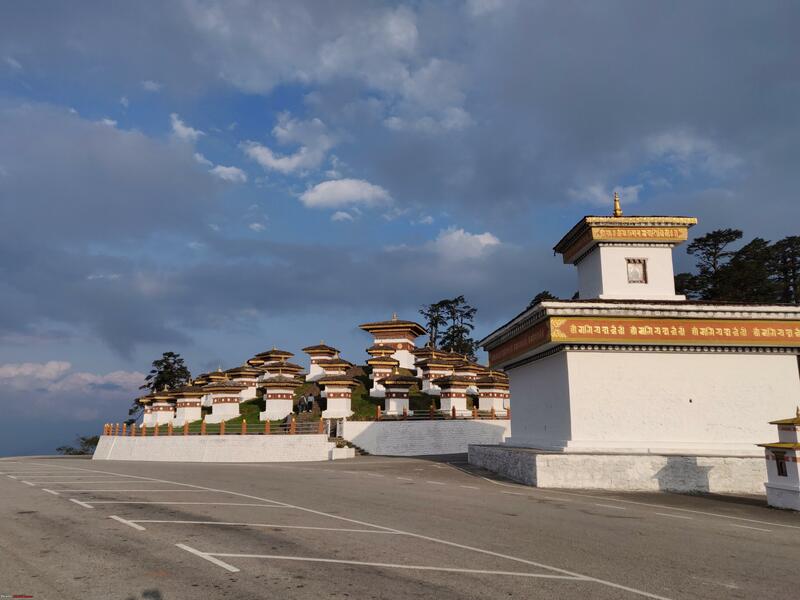 Once we cleared this check post, actual beauty of Bhutan opened up, because actually it is beautiful, and, we assumed we left all hypocrisy behind! 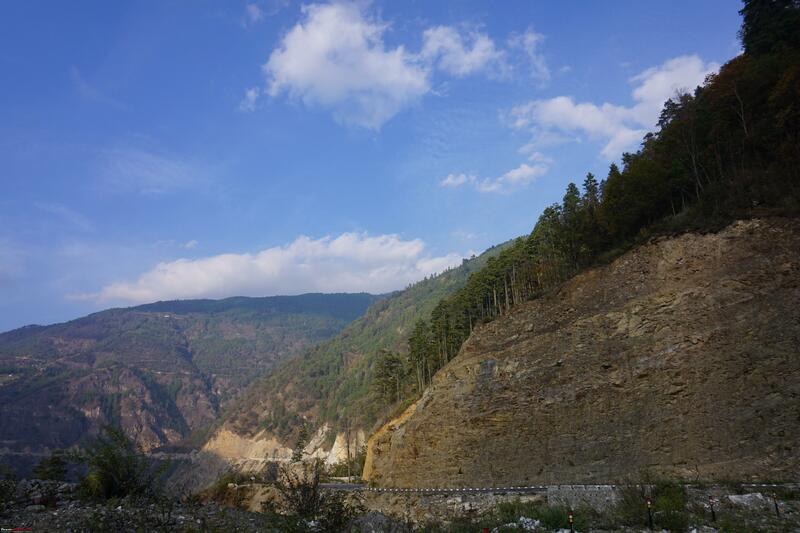 From this point onward, all roads that we drove in Bhutan had a cliff or a mountain on one or both sides of the road. 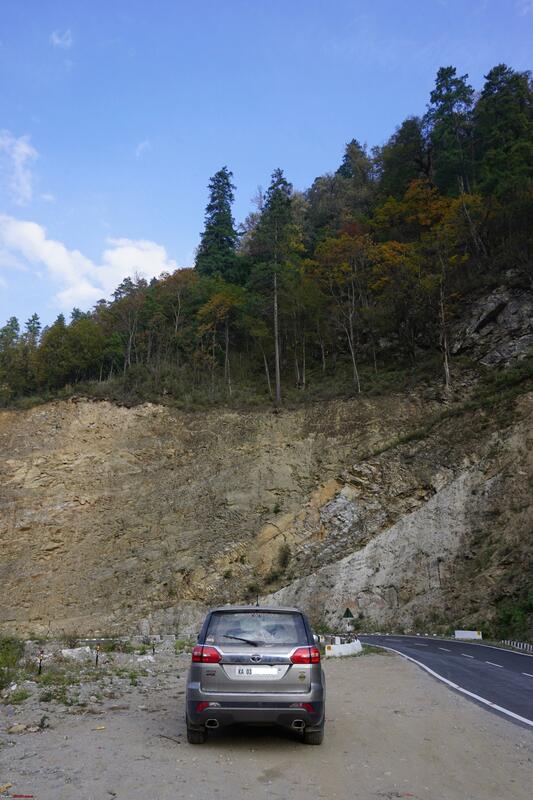 Long climb towards Thimphu started from this check post. 2 Lane roads were in decent condition. 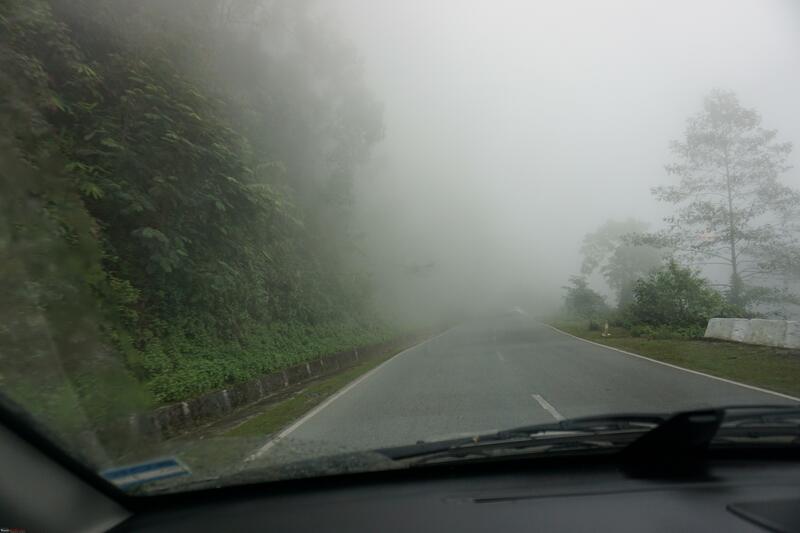 Weather conditions remained cloudy and foggy. 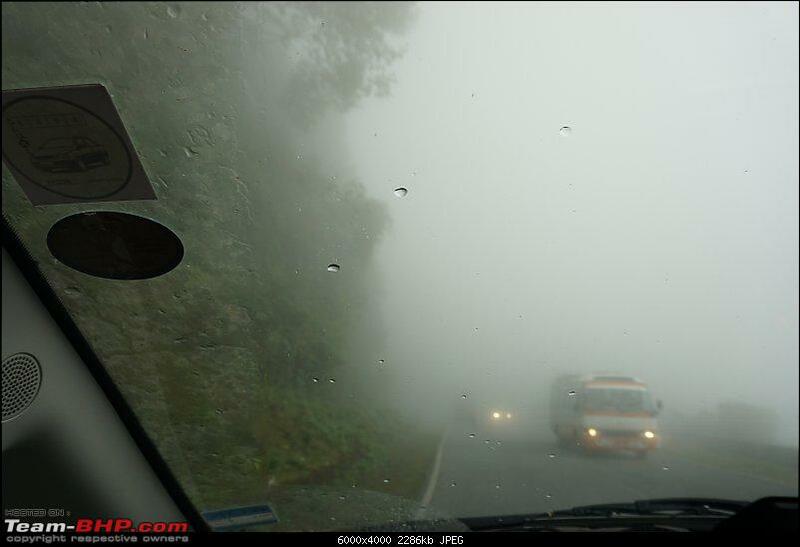 In some places fog was very intense with only 2-3 meters of visibility. 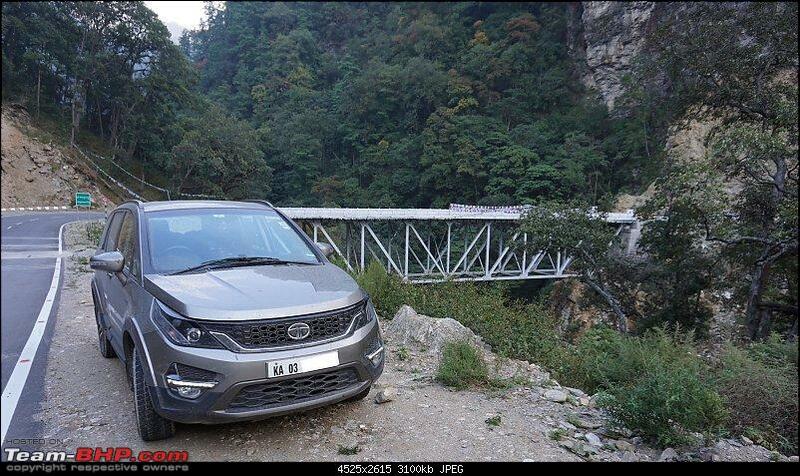 We tagged behind a local jeep for about 60 kilometers till DANTAK canteen, where we stopped for a quick break. 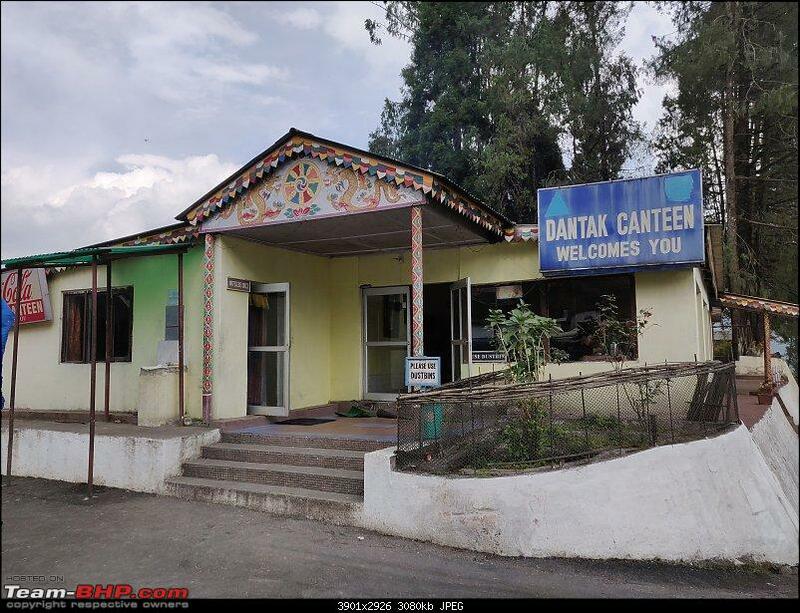 This canteen run by BRO and is located on a good viewpoint and has decent food and restrooms. We downed a couple of samosas with hot chai. Few kilometres after DANTAK canteen, we reached second immigration check post located at a beautiful spot adjacent to a bridge. If there was an award for the most beautiful check post, this one would bag that award. Parking on the bridge was not allowed and we waited for the policeman on the other side to signal and call us. We parked the car and I went to immigration counter with passports and to police counter with vehicle permit to make an entry. They will not stamp on passports here, but an entry will be made in their systems. 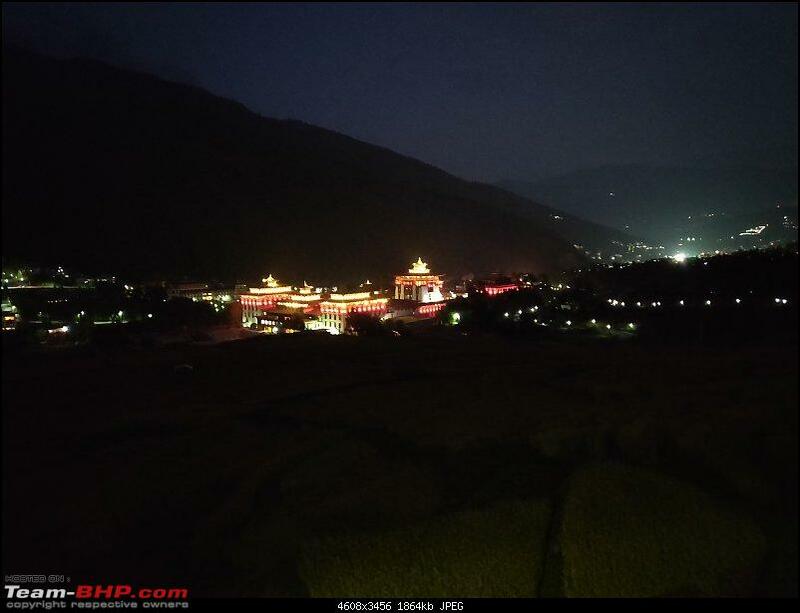 After stopping at few places for photography, we reached Thimphu by 5.30 PM and it was already dark by then. 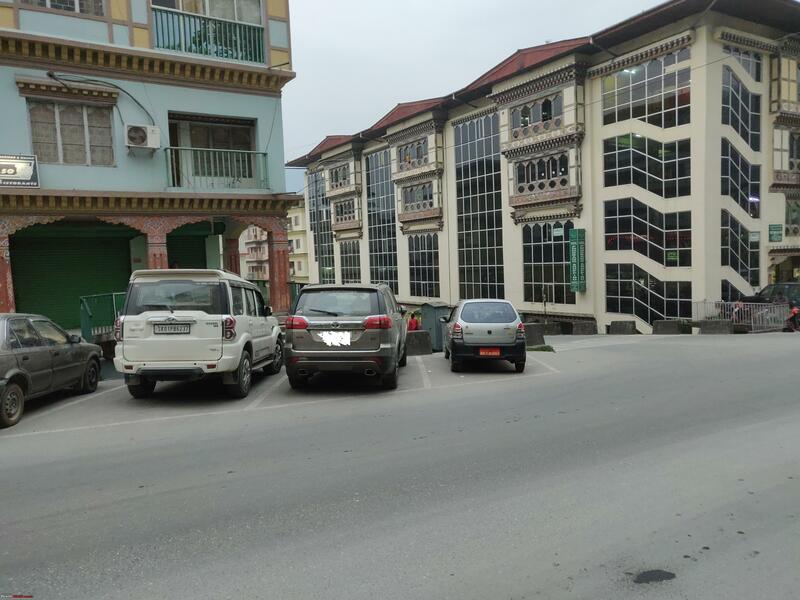 As a coincidence, we parked right in front of the immigration office, which would issue inner line permits to places beyond Thimphu and Paro dzongkhags (districts). There was a huge crowd in front of this office and someone was distributing permits by calling the names. Knowing there are no chances of getting permits on that day, I still went inside and checked with an officer inside who confirmed they are closed for next 4 days. Finally, In another country, driving ! We had some difficulty in understanding directions to hotel that we had booked. Lady at reception asked to hand over the phone to any local person and I did the same without any hesitation. The good soul spoke to her in Bhutanese and gave me directions in clear English. Following directions, we reached our hotel in 5 minutes. Hotel Golden Root, a new property, gave us a spacious room in third floor, with clean bed, wooden flooring, a heater, open parking place in front and a non-functional lift. After freshening up, quickly searched for a vegetarian restaurant and found many within a kilometer. Not sure of parking availability we decided to walk. Due to elections next day, most of the restaurants were closed and out of two we found open, one flatly refused to serve food because they were waiting for a party of 25 people. Accepted the refusal and walked to only remaining option, Hotel Ghasel. This restaurant was crowded, and we had to wait for our turn. After waiting for almost an hour, we got a table and had South Indian thali for dinner. While walking back to our hotel at around 10 PM, we noticed that street dogs are in abundance in Thimphu and they can be equally aggressive as they are in Bangalore. Retired for the day at 10.30 PM, with a sense of achievement for being able to drive to capital of another country. Last edited by prasanna_indaje : 19th March 2019 at 17:05. 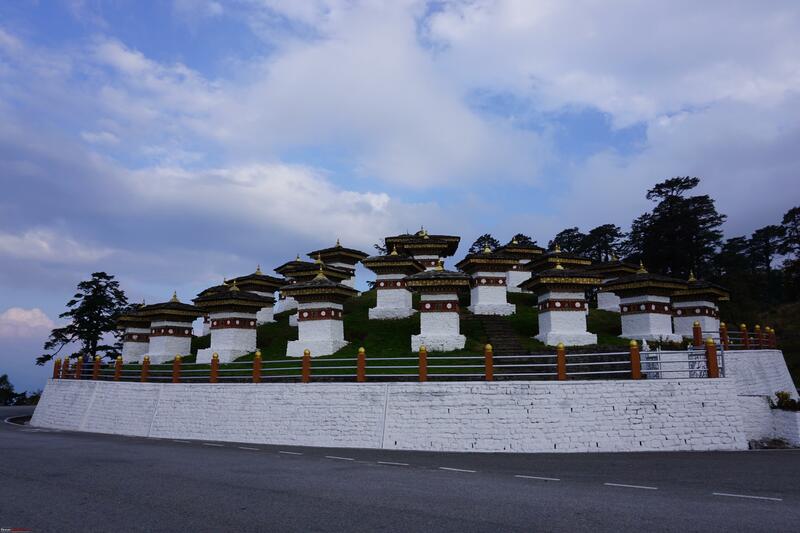 Day 7 and 8 (October 18th and 19th) : Tourists in Bhutan ! We started the day by 7 AM and drove to the same restaurant (Ghasel) for breakfast. Because we called and placed our order before starting from hotel, our order was ready as soon as we arrived. 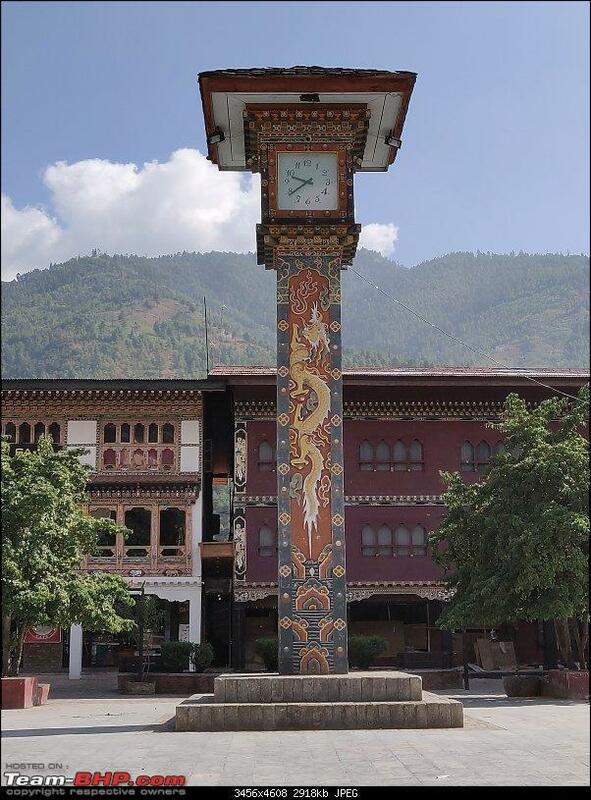 After breakfast we spent an hour roaming around in the empty streets of Thimphu and spent another hour in the clock tower square, which again was looking beautiful in the morning sun. Most of the shops were closed because of holiday due to Election. 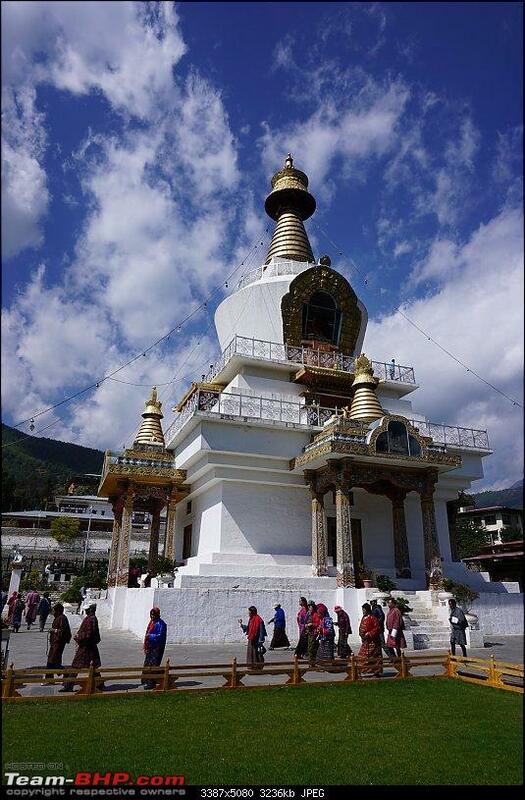 We proceeded to Thimphu Chorten after spending time at the clock tower square. 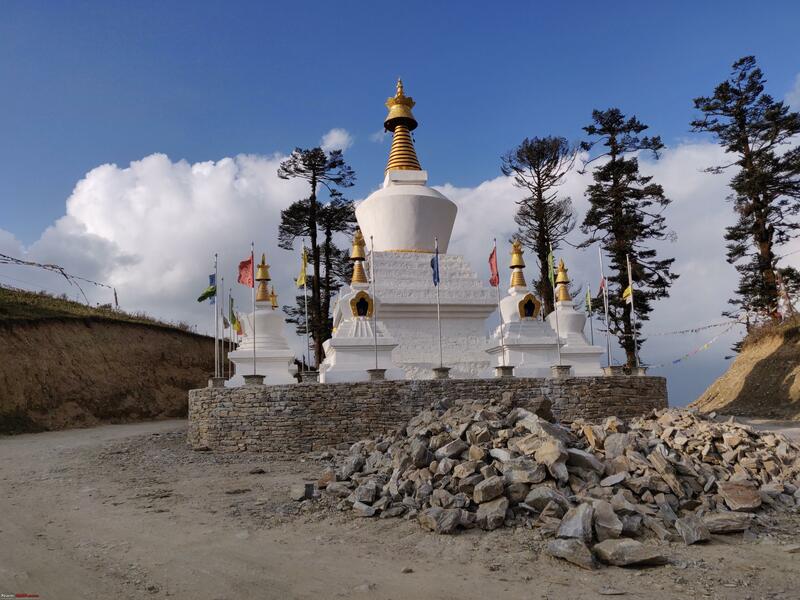 This is also called as Memorial Chorten. After paying the entry fee of Nu 300 per person [ Students get 50% discount upon showing school ID card, or even a photo of the ID card on mobile]. This Chorten is beautifully located within Thimphu city and was the first Buddhist temple we visited in this trip. 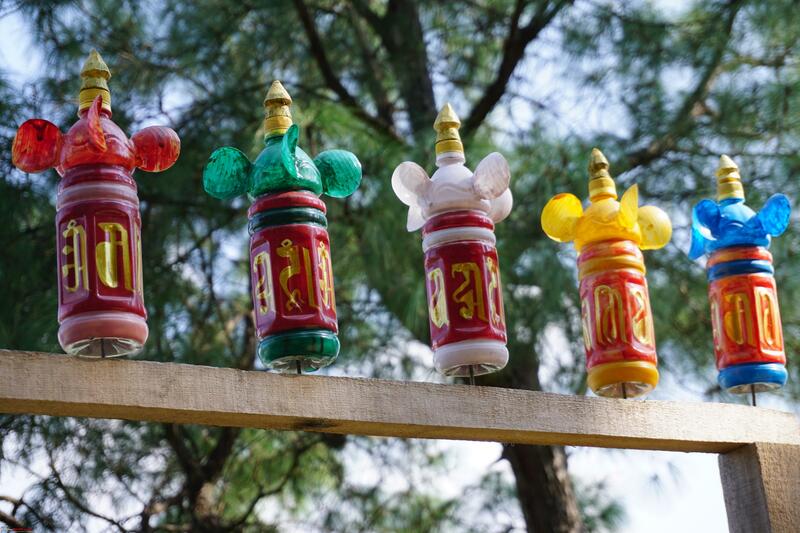 This is surrounded by huge prayer wheels and a nicely maintained lawn. 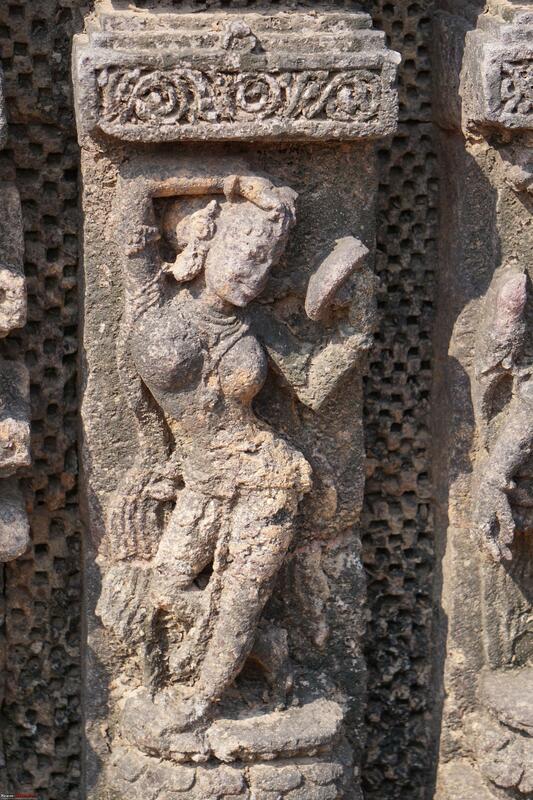 Also has an enclosure where traditional butter lamps are lit. We entered main Chorten, which is in the center of the lawn, after removing footwear (Headgear too need to be removed, if worn). A huge photo of King’s family welcomed us as we entered the structure. 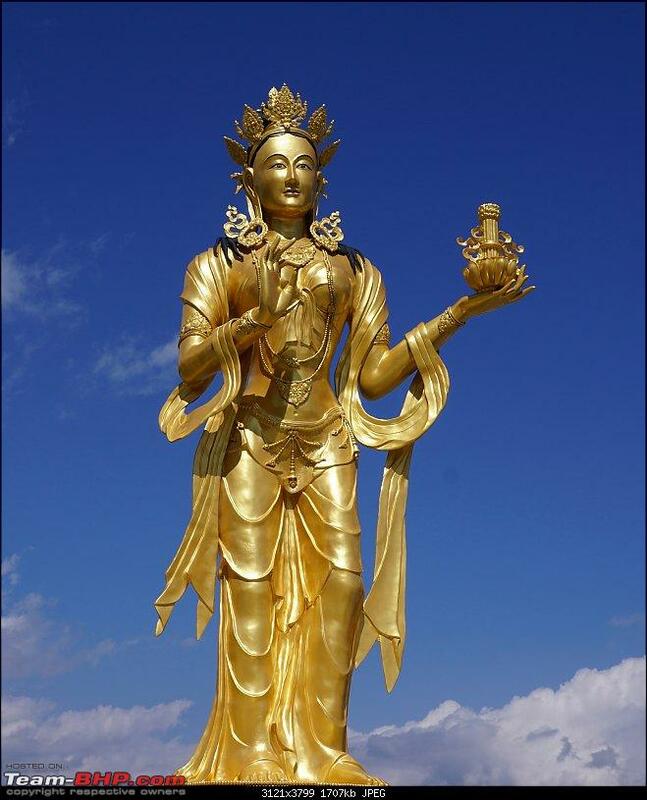 There are three floors and each floor has few beautiful Buddhist figures shining in golden color. 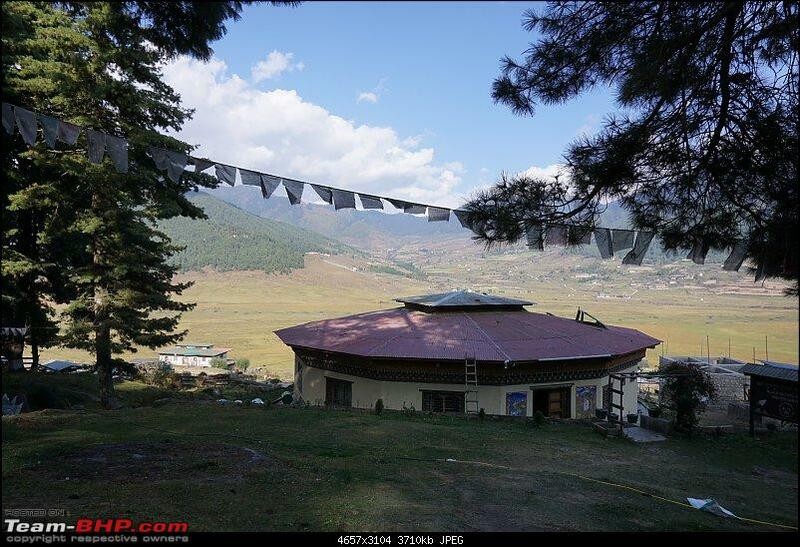 Second floor has surrounding balcony which opens to breath-taking view of Thimphu city. 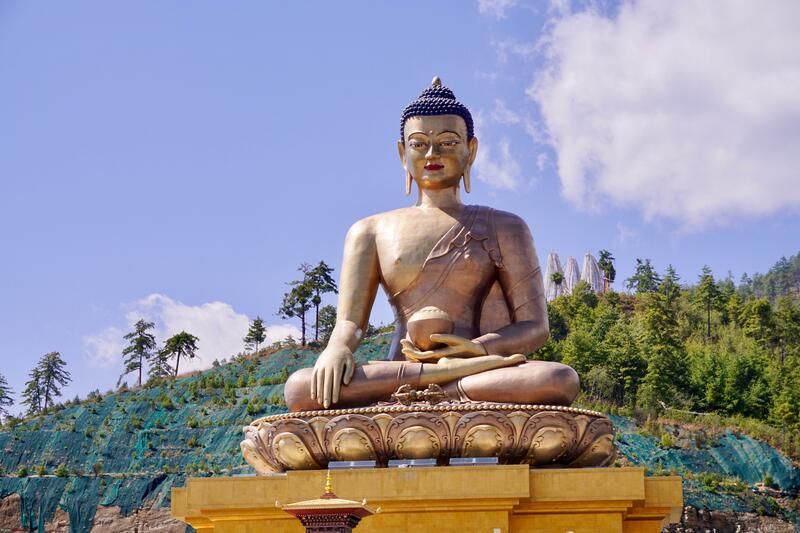 Next stop was Buddha Dordenma, which is huge statue of Lord Buddha located atop a hill facing Thimphu city, located about 7 kilometers from Clock tower square. Winding roads took us to the destination, which had ample unorganized parking space. 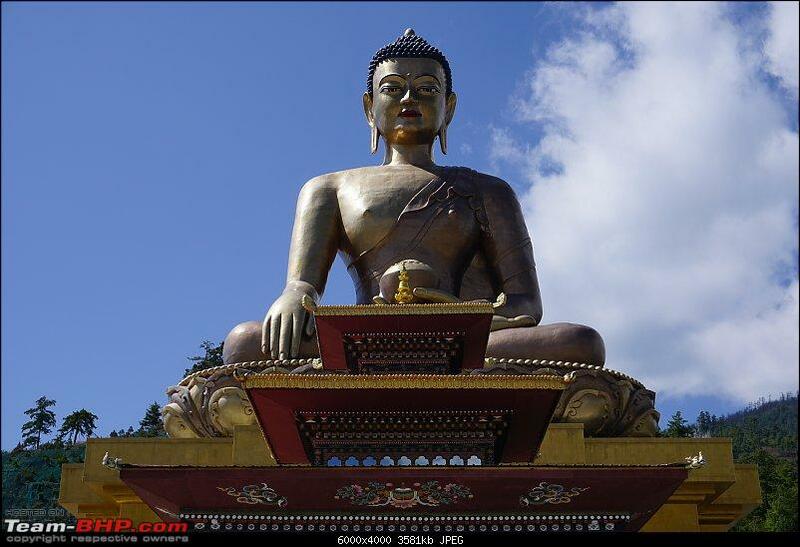 After climbing about 700 steps, huge flat ground with a majestic statue of sitting Buddha welcomed us. 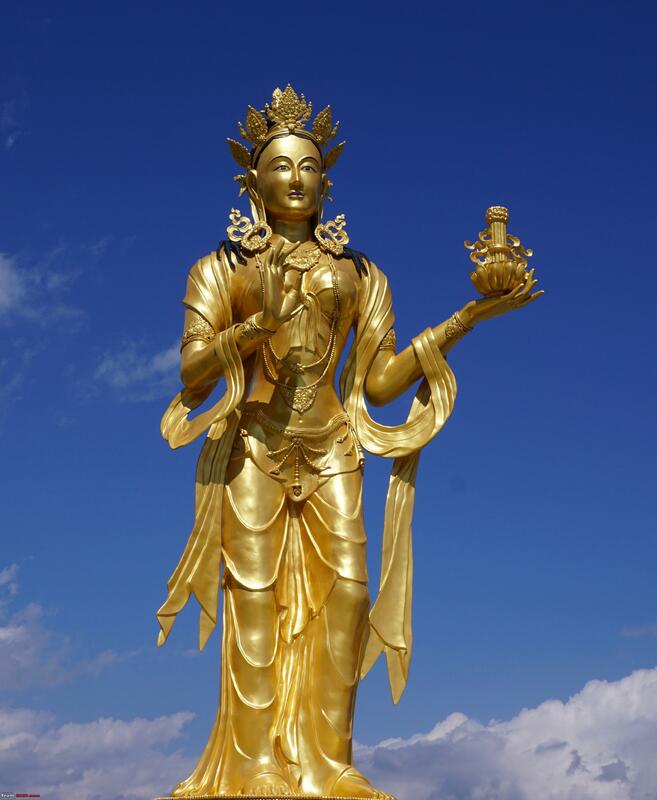 Buddha statue is placed on a large platform and is surrounded by smaller statues of goddess Tara in different forms. Environment here was refreshing, which made us to spend more than an hour here. From here we visited Takin reserve, which was closed due to elections. Drove few kilometers in those empty narrow roads and decided to return. On the way back, we visited Changangkha Lhakhang, another Buddhist temple, which beautifully sits atop a small ridge close to Thimphu city. 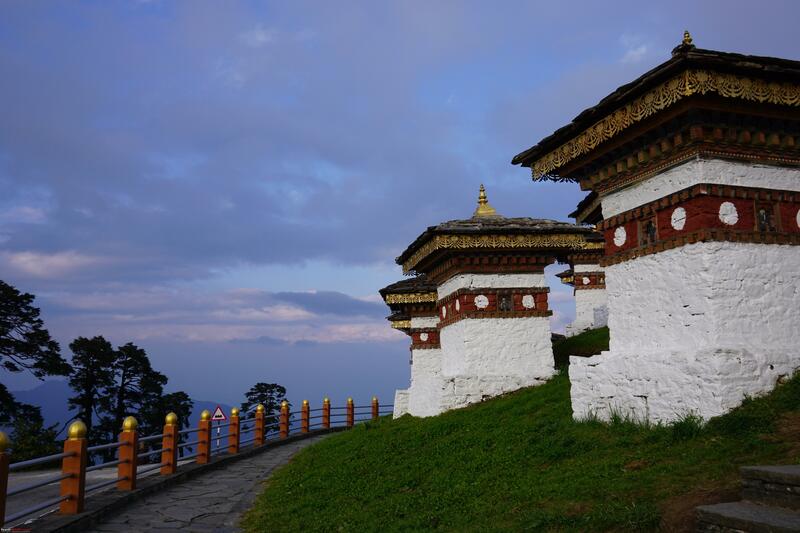 A 5 minutes climb to the top, reveals an old and beautiful temple and nice views around. 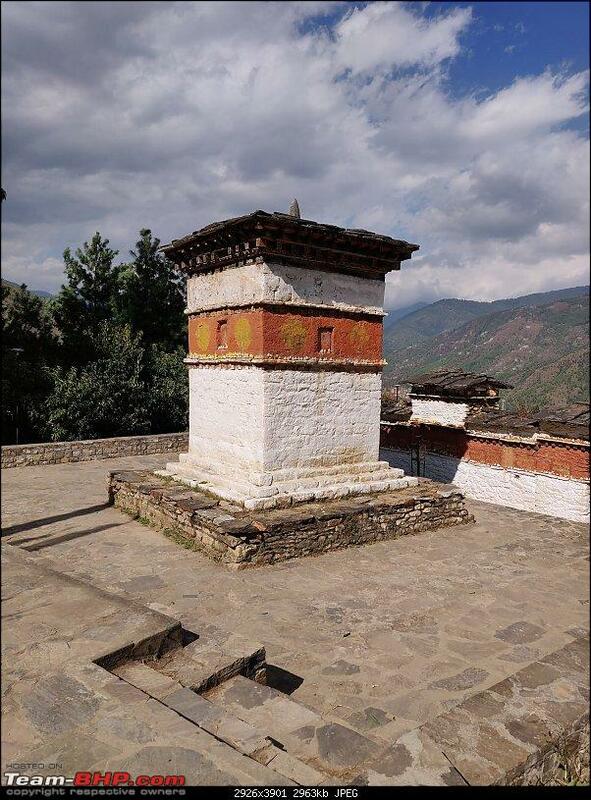 There are few stupas around and a couple of benches are kept few steps below Lhakhang. 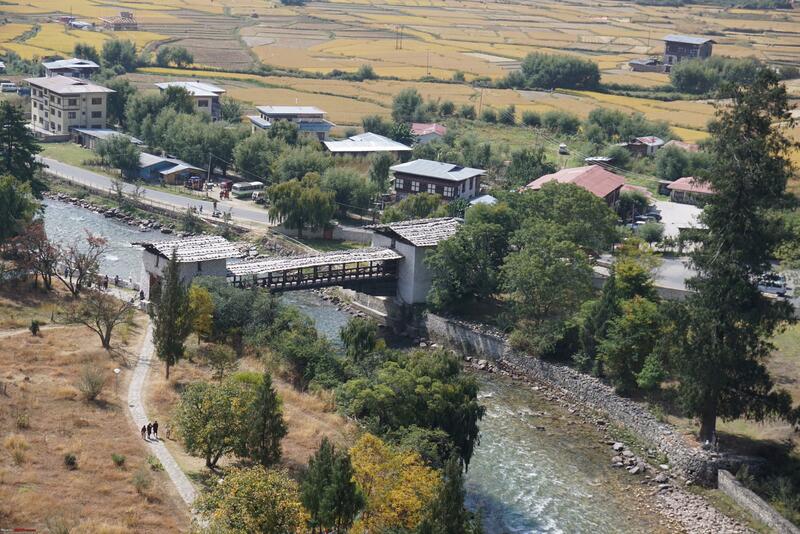 We took some rest here enjoying bird’s eye view of Thimphu city in front of us. We had a very late lunch in the same restaurant, after which we went to the local handicraft market, which had only few shops open due to election holiday. Despite of only few shops being open, we spent an hour and half analyzing the products and checking the price (basically, window shopping). Went to hotel and took some rest. 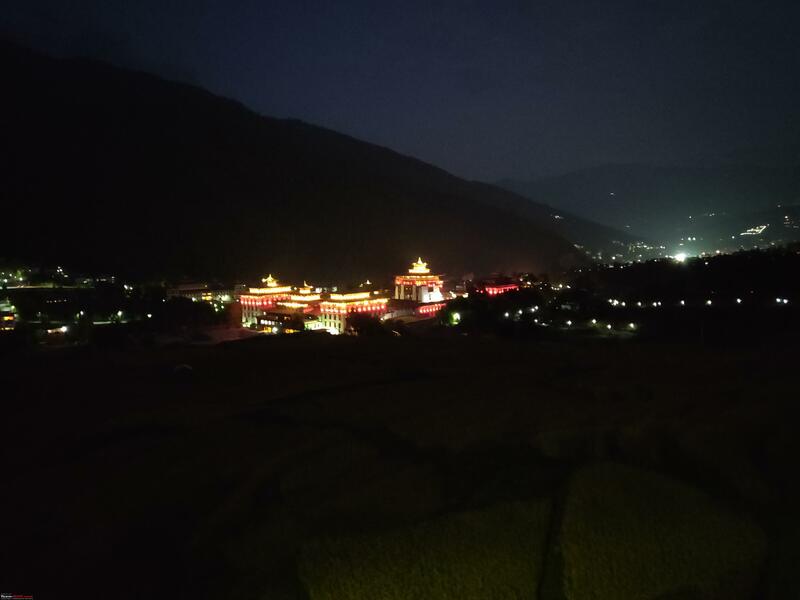 After an hour, we drove to the viewpoint from where we could see Thimphu Dzong beautifully lit in its signature red lighting scheme. Came back from viewpoint, had dinner and we called it a day! 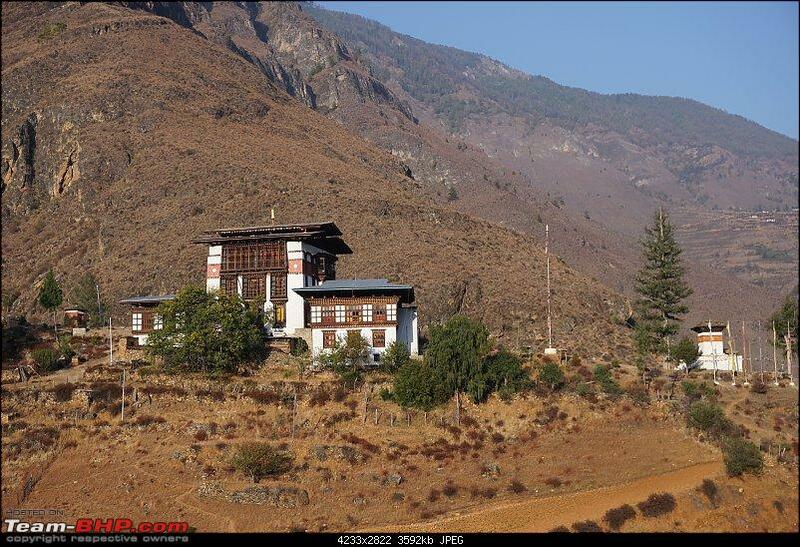 Next day, 19th October, all hotels in Paro were booked. 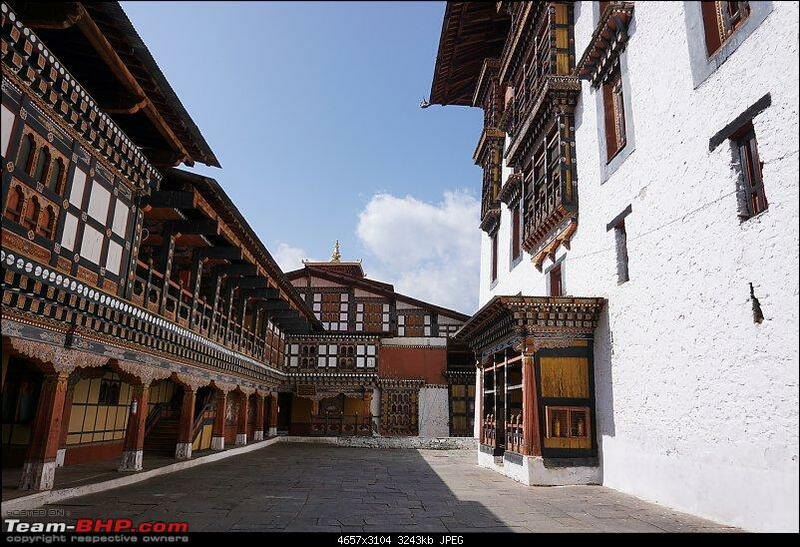 Hence, we decided to stay in Thimphu and do a day trip to Paro. We started round 8.30 AM after breakfast and started our drive towards Paro. 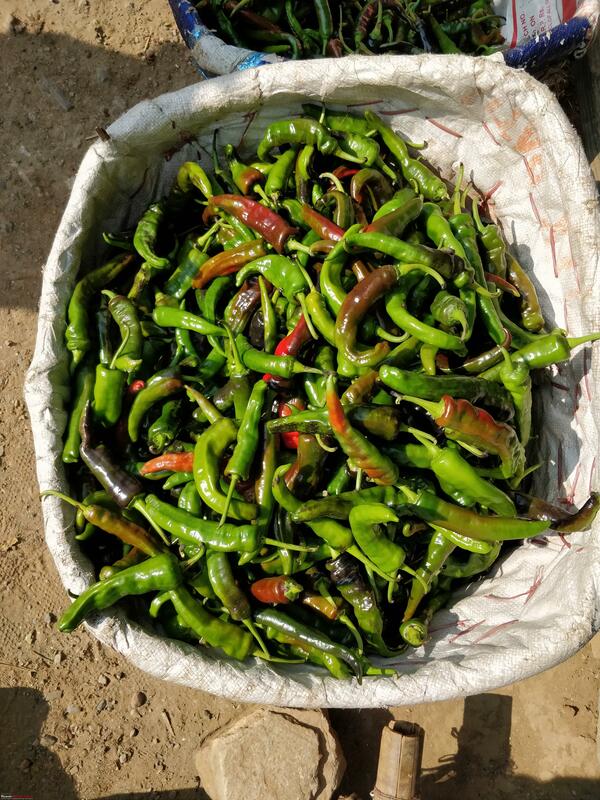 First stop was to buy some dry red chillies (a.k.a. emma) and powdered red chilli. Purchased few packets and proceeded to “Welcome to Thimphu city” arch for a photo op. 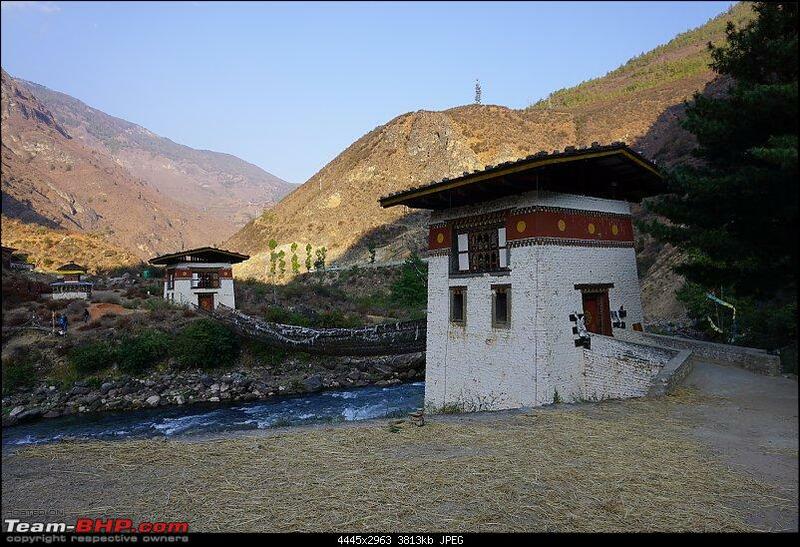 After few photos, we drove towards our day’s destination, Paro. 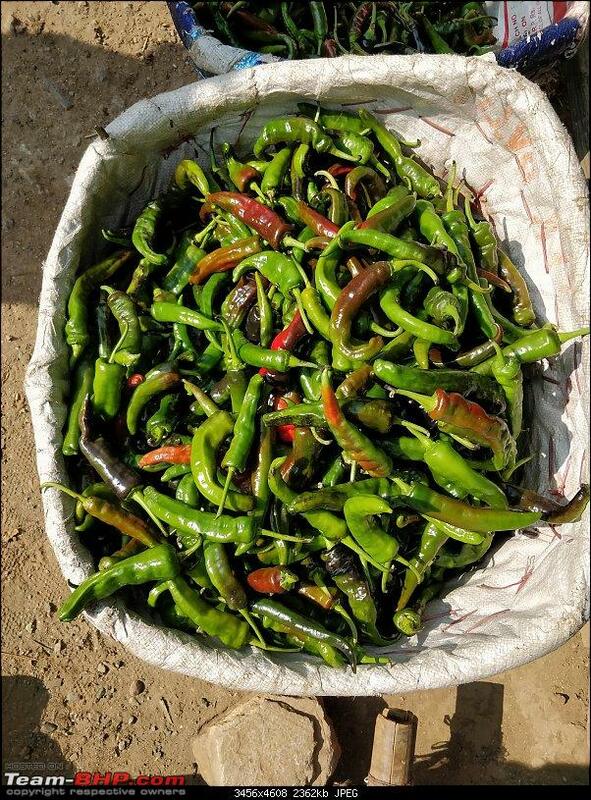 Chillies - Most seen vegetable in Bhutan ! 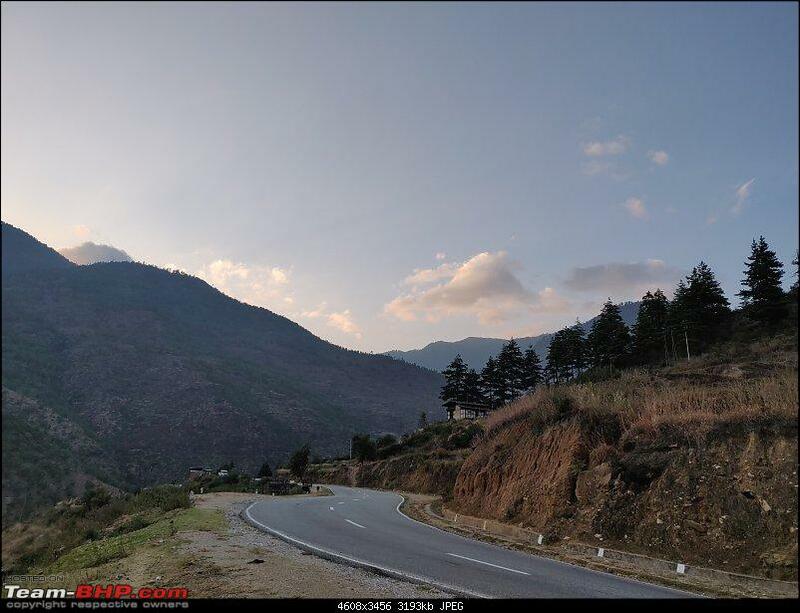 Road towards Paro is well paved and marked, but an undivided two-lane highway. 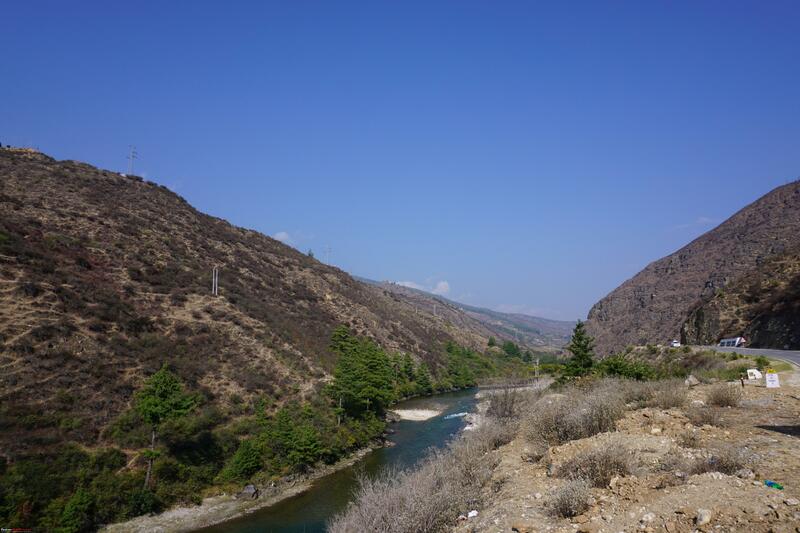 We took plenty of stops to admire surrounding nature, river below and amazing landscapes. 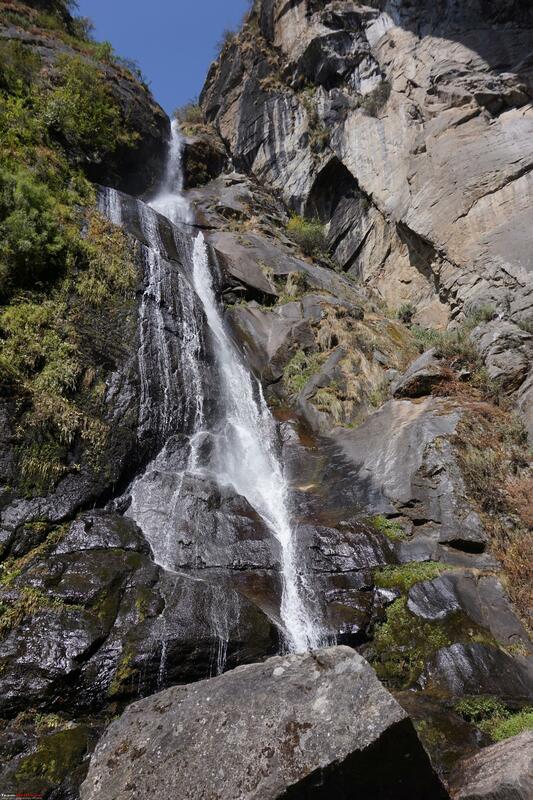 Also, we took some photographs which by the way, does not do any justice to the beauty on offer. Also, stopped in front or a beautiful local market which was located by riverside. Did not buy anything but enjoyed the atmosphere. 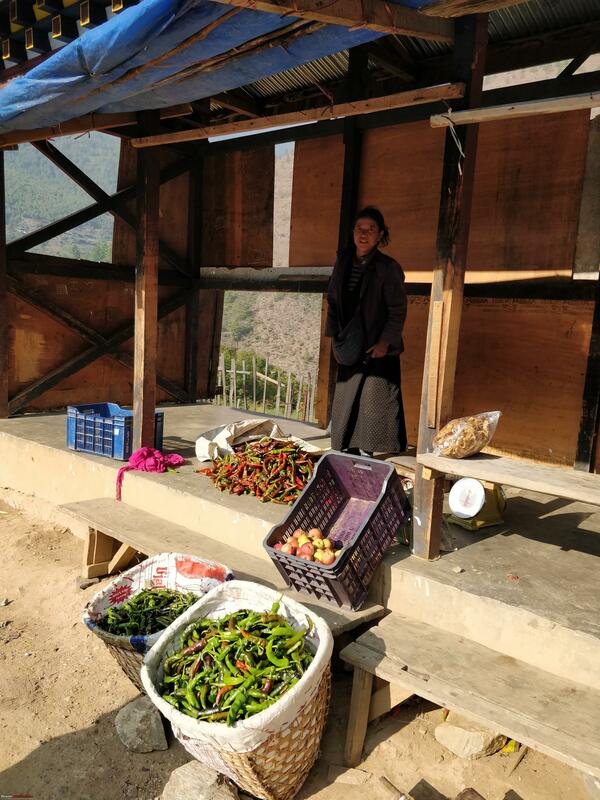 Market was just opening for the day and few locals were unloading vegetables from their Pickups and some were arranging things in their store. 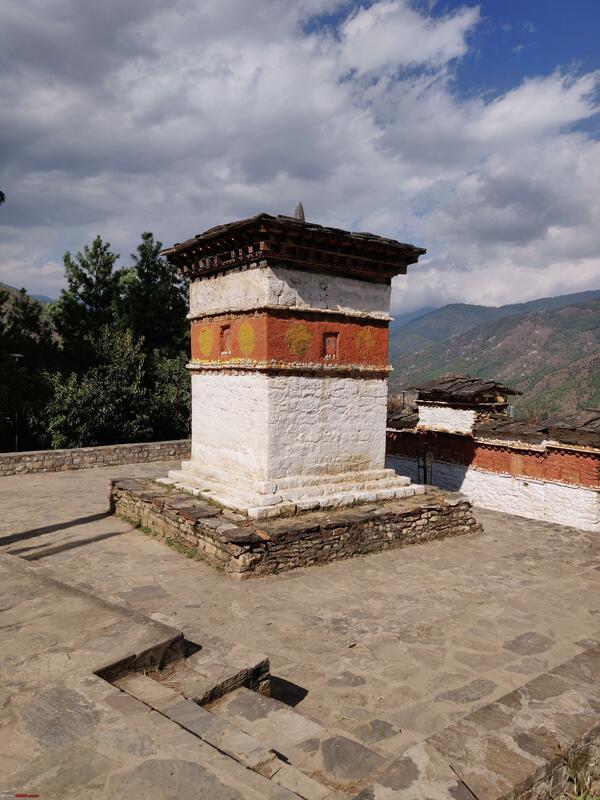 Next stop was Rinpung Dzong, which again is placed atop a hillock just before Paro town. 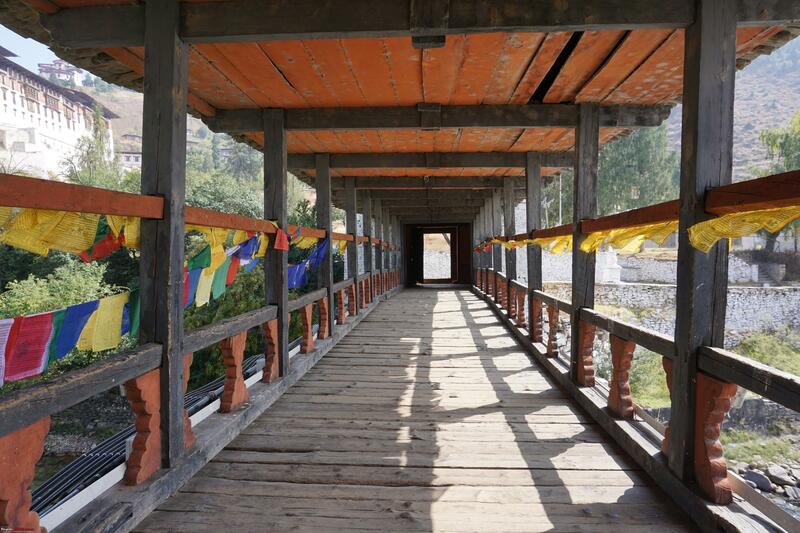 We walked across a beautifully built cantilever bridge to reach Dzong. 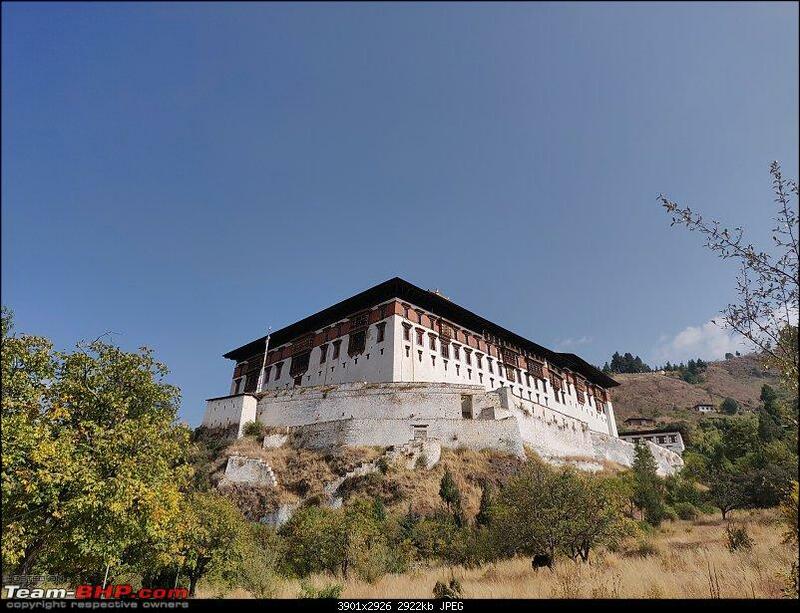 It took us 10 minutes to reach the Dzong. We bought tickets at Nu 300 per person, with 50% discount for our daughter. 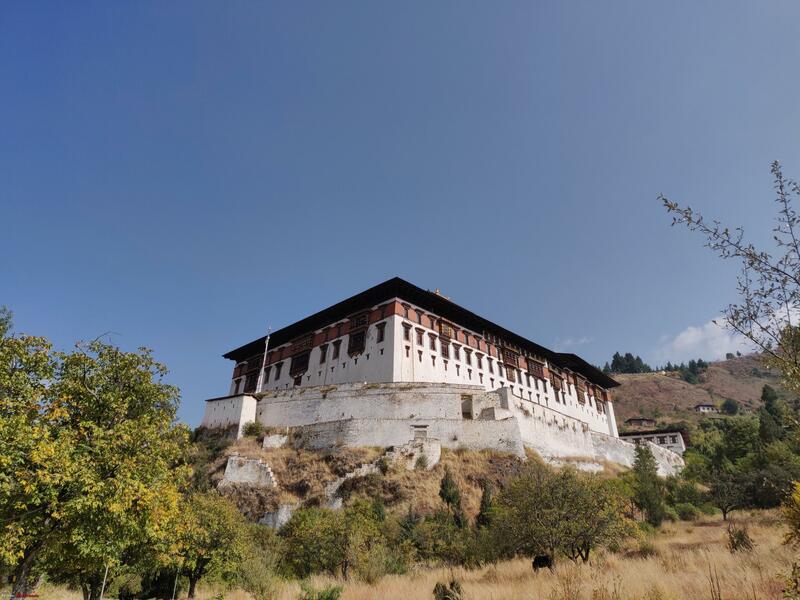 A guide took us inside the Dzong and explained the history and architecture. Also took us inside the sanctum, where central figure of Buddha sports princely attire, which is rare. 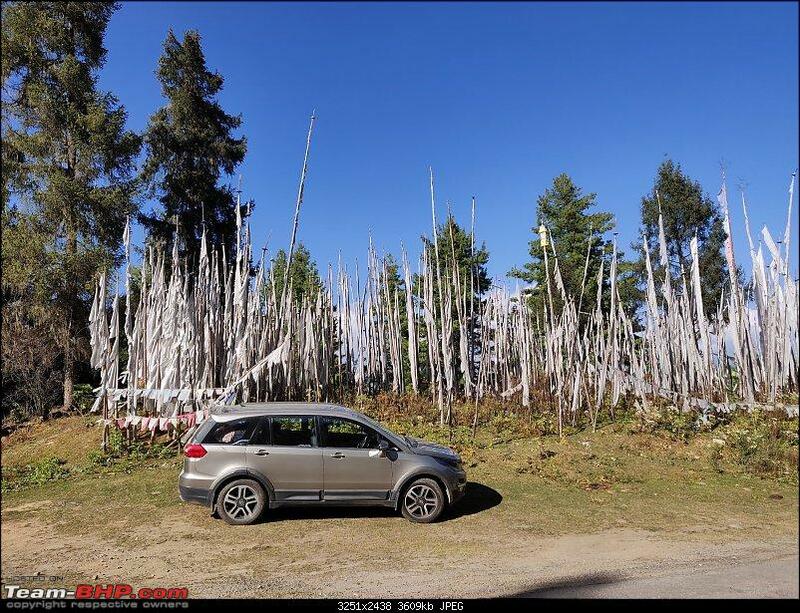 After thanking the guide and talking few photos, we walked back to the car and drove to Paro town. 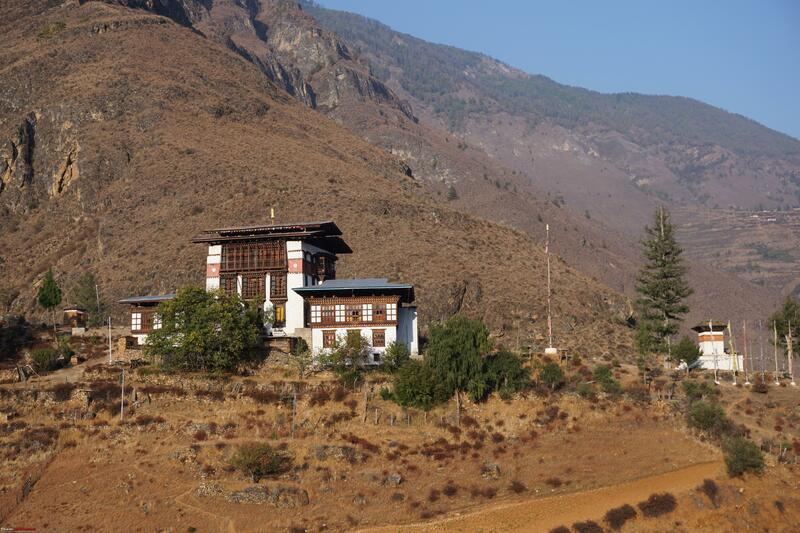 Paro is much more serene and less crowded than Thimphu. We found a vegetarian restaurant, Seasons hotel, with help from a friendly policewoman and had nice brunch there. 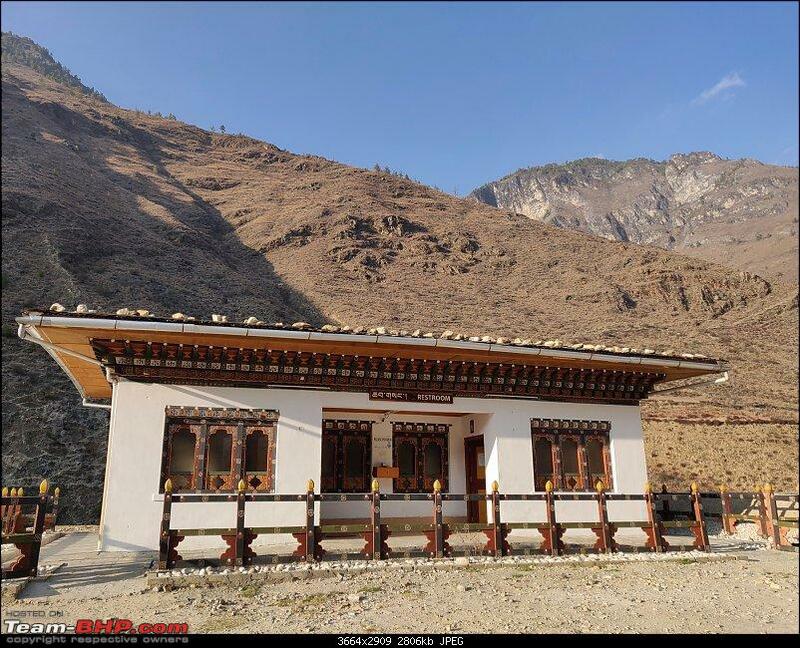 Best emma and keva datshi we tasted in Bhutan were from this restaurant. We drove to the national museum after lunch to find it closed. To add to our agony, the museum entrance also had a note which mentioned they will be closed for the entire long weekend for maintenance. Unfortunately, we missed an opportunity to visit this museum. 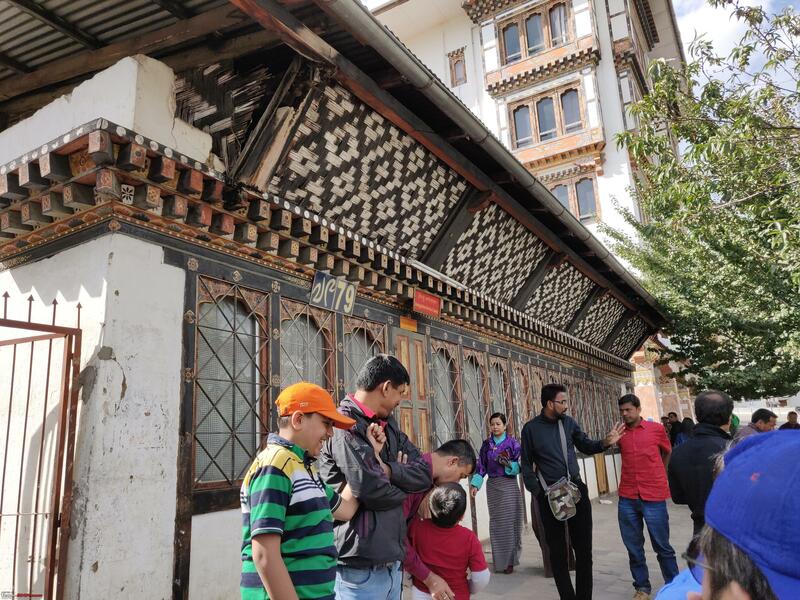 After unfruitful effort to visit national museum, we drove back to Paro town and spent time roaming around and window shopping. 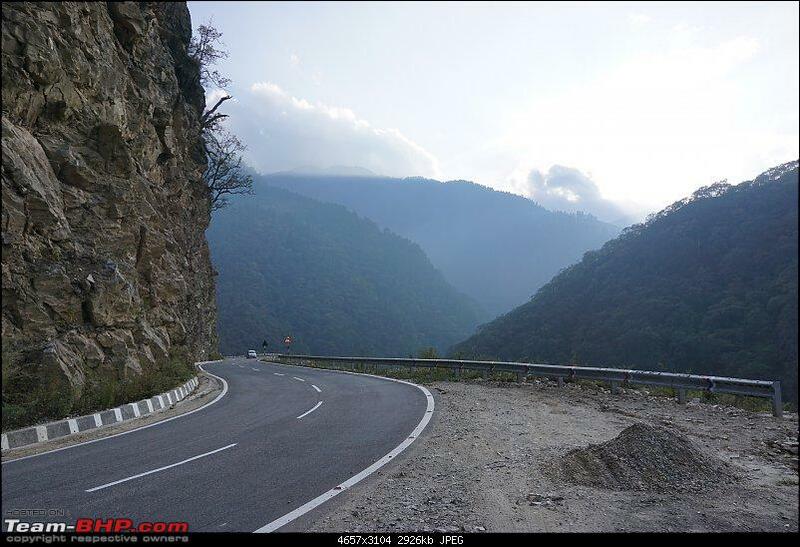 Started our return drive to Thimphu by 3 PM. 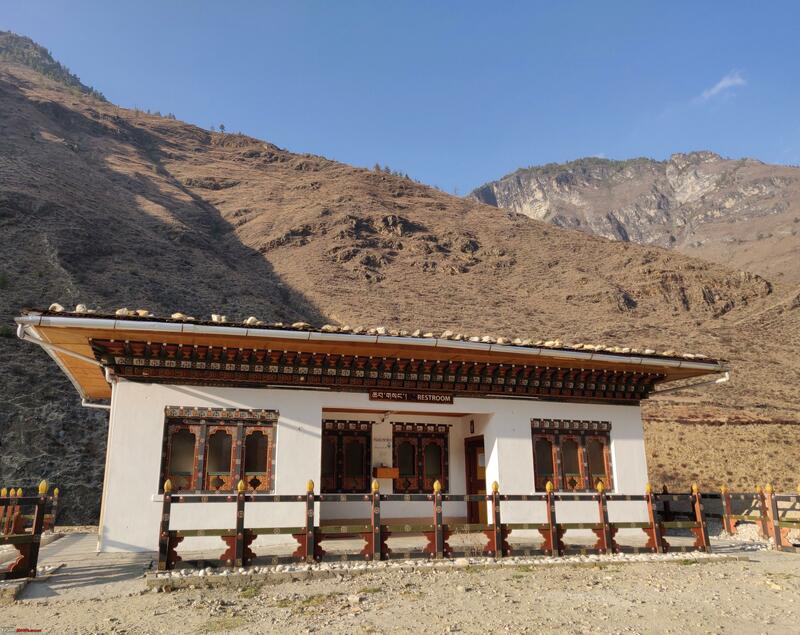 While returning, we stopped at Tachog Lakhang, another Buddhist temple which can be reached after a good 15-minute hike from Thimphu – Paro highway. 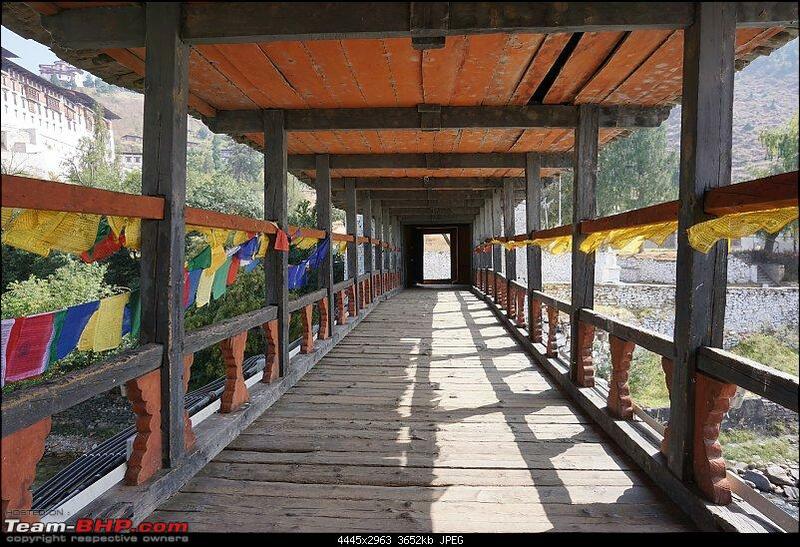 Crossed a beautiful cable bridge, hiked the hill on top of which Lakhang is located, admired the beauty from outside, and walked back. It was 5 PM and almost dark by the time we reached the car. 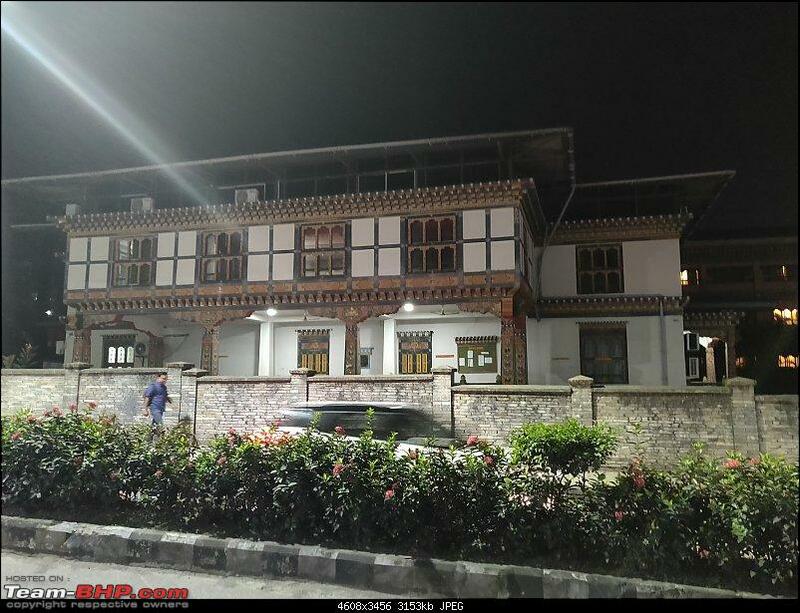 Drove straight to Thimphu and took rest after some roaming around and dinner. Golden Root was the hotel and Ghasel was the restaurant. Last edited by prasanna_indaje : 19th March 2019 at 19:46. 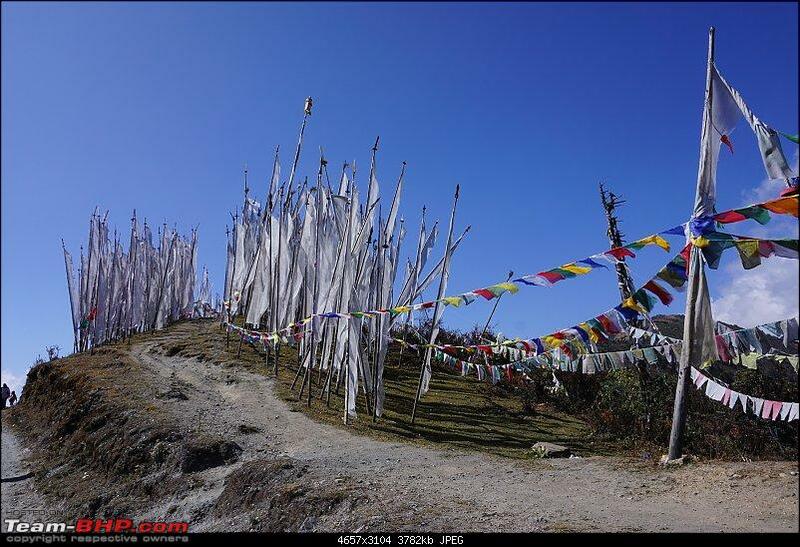 Day 9 (20th October): Hikers in Bhutan ! 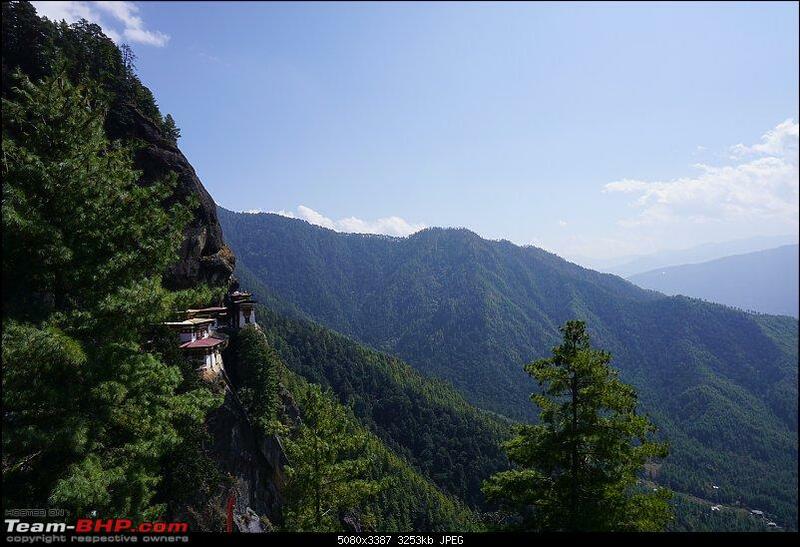 Started the day at 5 AM from Thimphu and reached the base of Tigers Nest by 8 AM. Starting point of the trek has unorganized parking place and we were able to find our slot. Quickly ate breakfast of ready to eat stuff and proceeded to ticket counter. [Tickets need to be purchased for everyone in your group from the base point, these tickets need to be produced before entering the temple atop. It is Nu 300 per person (50% off for students, who produce ID card / copy). Even if you miss to purchase from the starting point, there is an option to buy tickets once you reach the top]. We decided to hire ponies for two ladies. Negotiated with a lady for ponies and hired two for Nu 1200. I rented out a wooden walking stick for Nu 50. After arranging these logistics, we started our climb. My wife and daughter took ponies and I decided to walk. We were together only for few hundred meters. There are two possible routes, one, the path used by ponies to climb and other, a shortcut, which cuts the pony path at some places and climbs straight. Ladies on the pony took first option and I, the second. They reached the cafeteria by 9.30 AM and I reached, panting heavily, at 10 AM even after multiple stops. 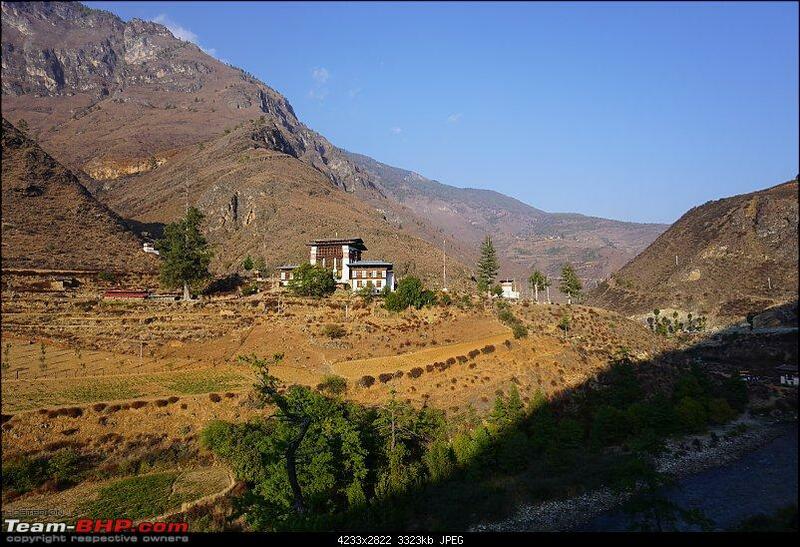 Took some rest in the cafeteria, had some Tea (at 140 Nu a cup) and started second phase of the climb, together. No ponies after this point. 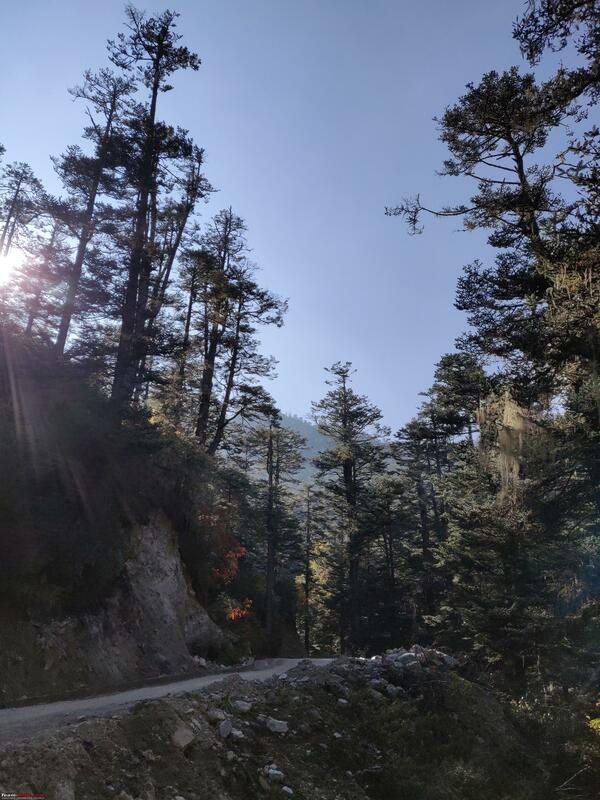 Being a peak holiday season, the track was full of tourists (Indian and foreign) and at narrow places we had to yield to or were being yielded by oncoming trekkers. Also, the track was full of airborne fine dust due to heavy footfall. 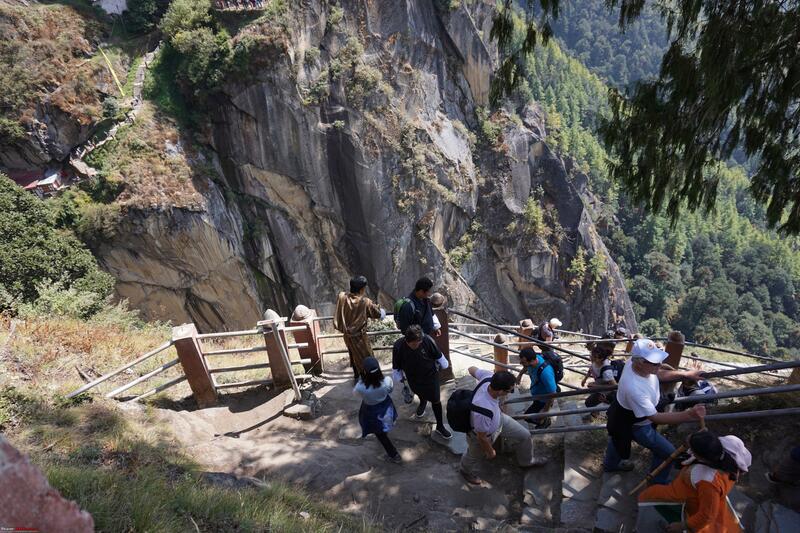 After an hour and half long combination of walking in trekking, we reached the starting point of steps to the Tigers Nest. 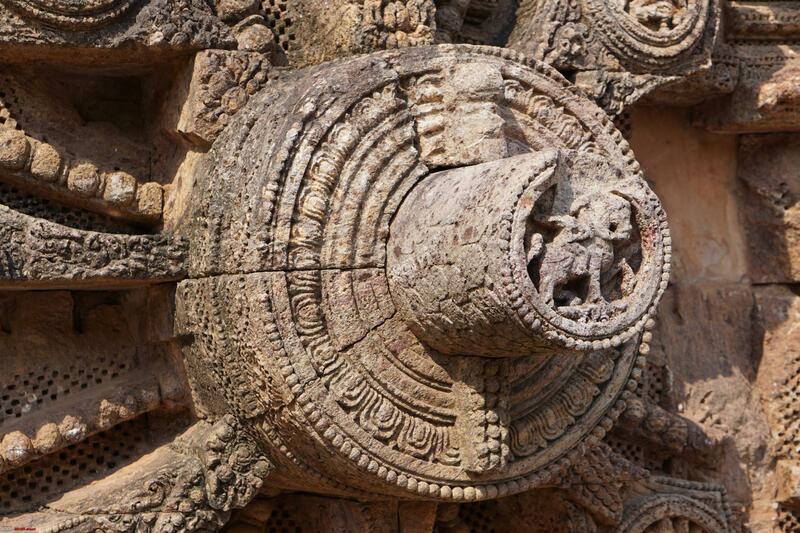 There are approximately 800 steps of various size and form. Half of them are descending and half ascending. Some of the steps were narrow and we continued to follow yield or get yielded rule. 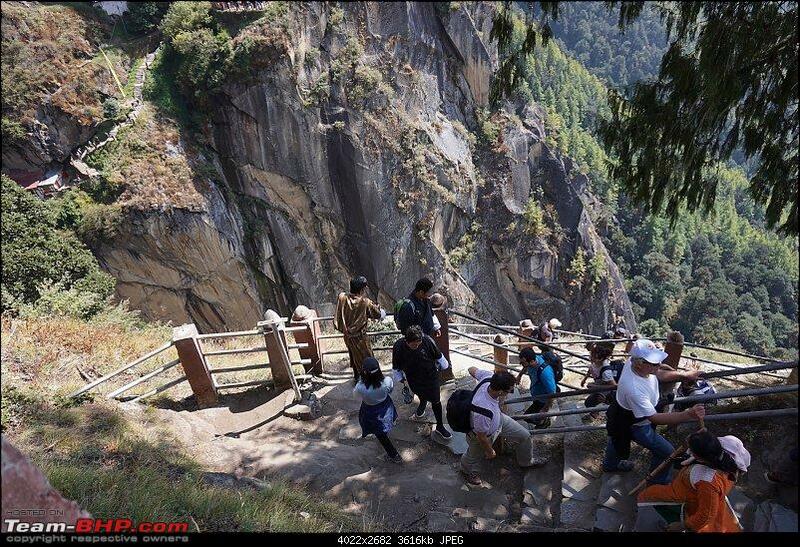 We reached the entrance on Tigers Nest by 1 PM. We had to deposit our bags, phones, camera and walking stick at the lockers provided near entrance. This is a free facility and visitors can keep keys with them. 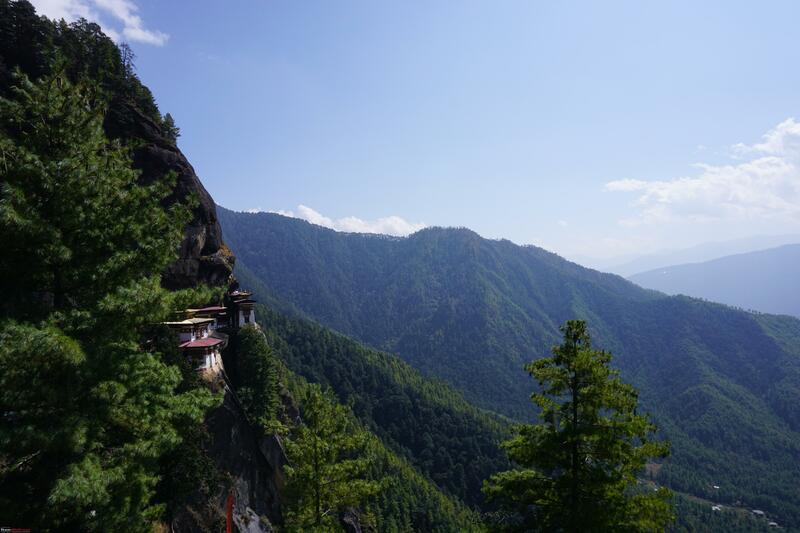 After depositing luggage and getting tickets checked, we entered Tigers Nest, a Lakhang, built on the edge of a mountain using natural contours. 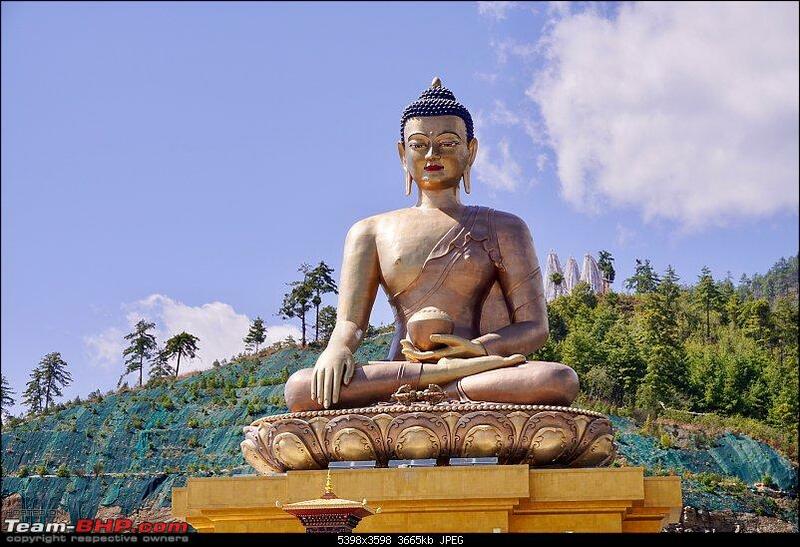 This temple has many dedicated sub-sanctums for holy monks and Lord Buddha. 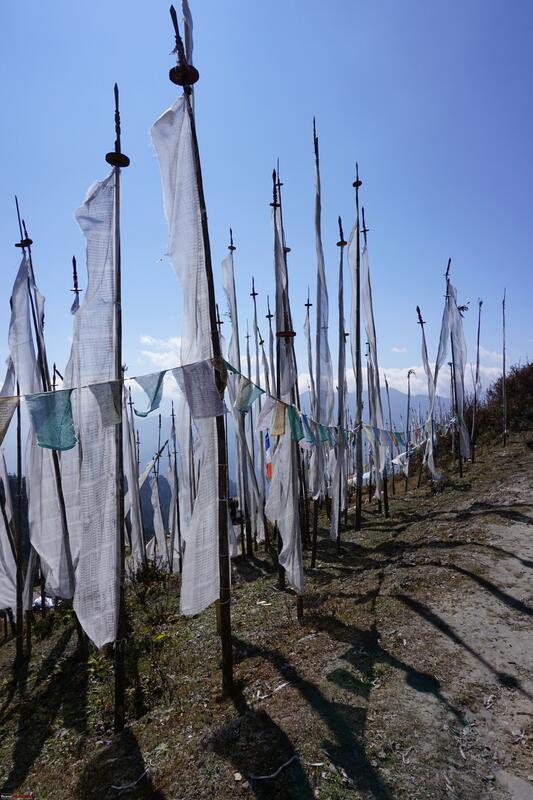 After visiting all temples, we started our trek back. We reached the base by 5 PM and spend 30 minutes at a small market with shops selling souvenirs. We drove to our accommodation, Kichu Resorts, after buying some key chains. 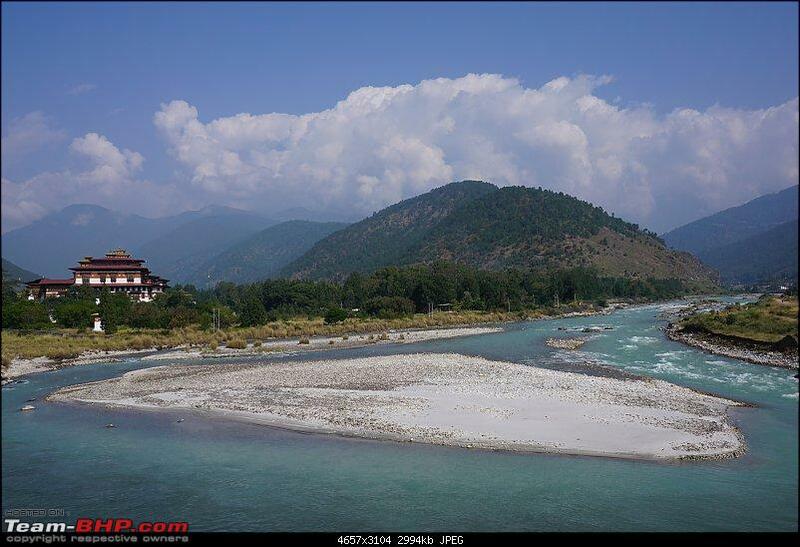 Kichu resorts is built on the banks of a beautiful river. This resort allowed us to park our car right in front of the cottage. After a day full of physical activity, we rewarded ourselves with a nice stay. After dumping luggage in the room, we proceed to our favorite hotel Seasons to have early dinner, post which we came back to the resort and took well-earned rest. Last edited by prasanna_indaje : 18th March 2019 at 20:51. Started the day little later than usual, took a scroll around the resort, spent some time by riverside and proceeded to our favorite restaurant for breakfast. 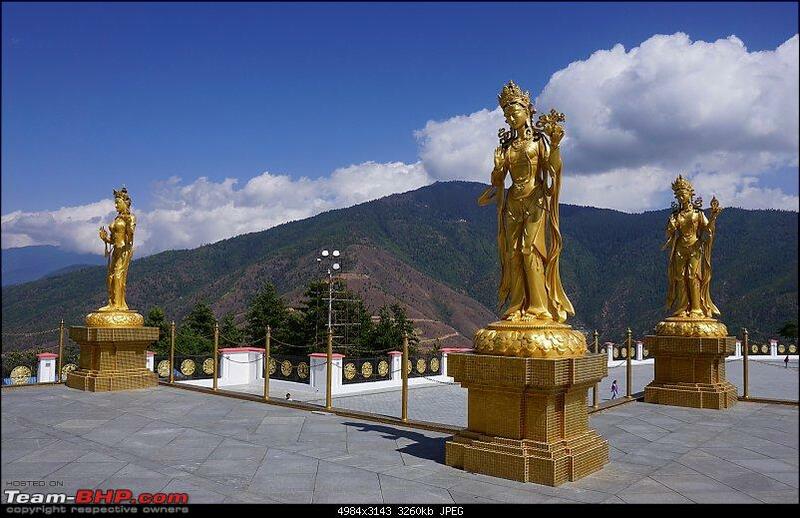 This was a rest day and only item in the agenda was return to Thimphu for extending the Visa and obtaining inner line permits next day. 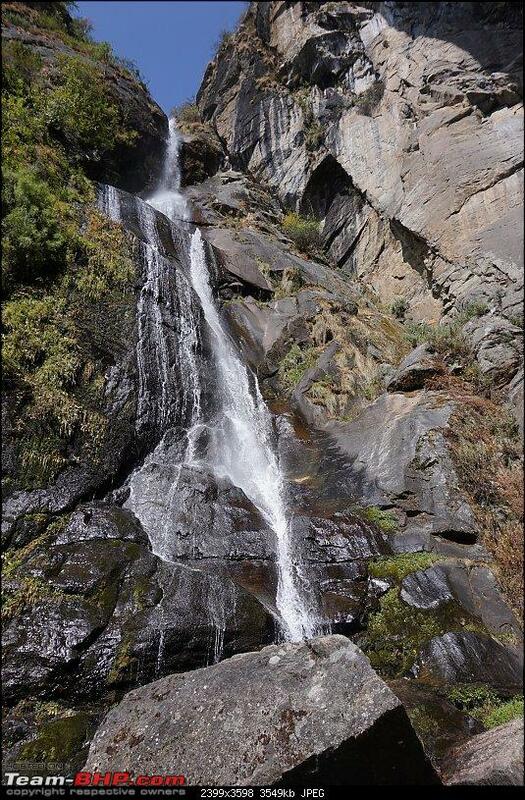 Spoke to a local when we were preparing to leave, and he suggested a visit to Chele La. We took the suggestion and drove to Chele La after breakfast. 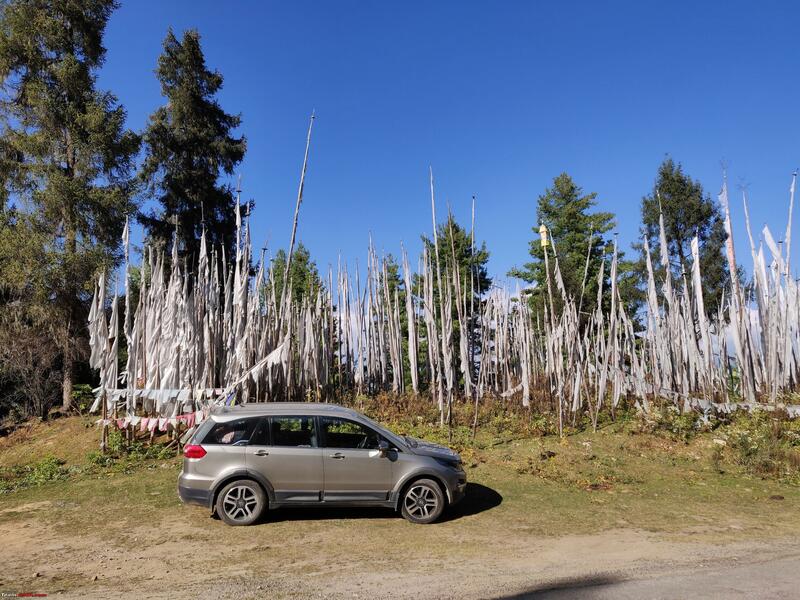 This 40km journey included awe-inspiring view of Paro valley and loads of hairpin bends on a narrow road through dense forest with trees bearing colors of Autumn. 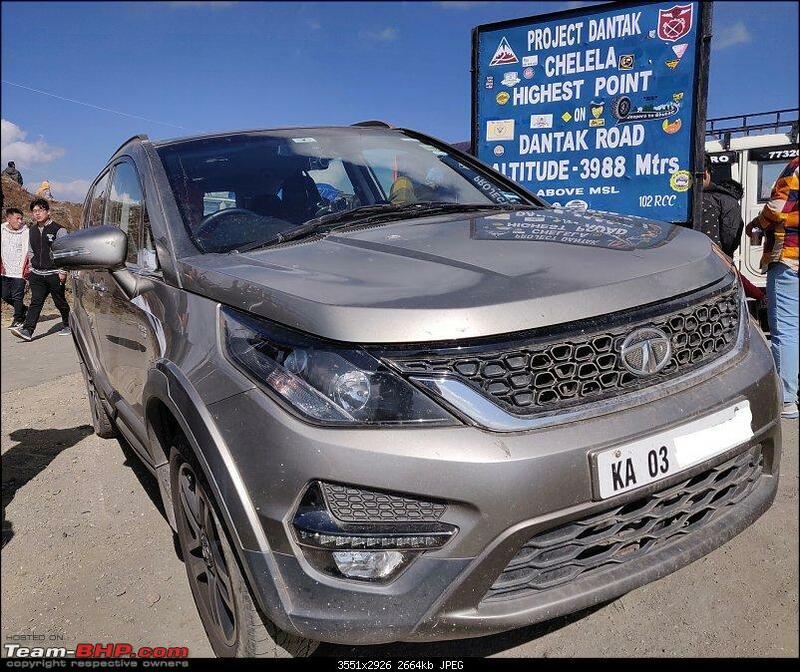 We reached Chele La at 12 noon and found a parking spot with some difficulty. 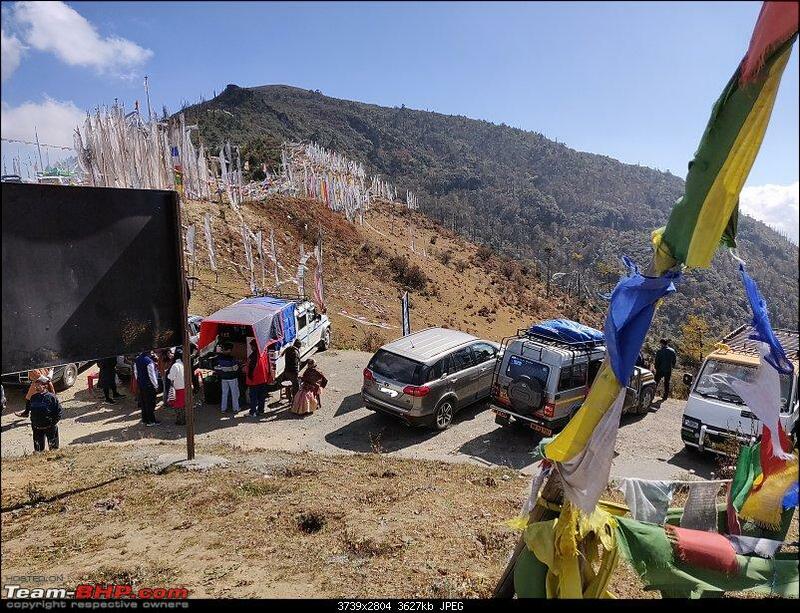 Vehicles were lined up on either side of road on either side of the pass for at least half kilometer. For our luck, the parking spot we got was right under “highest pass” signage, which provided some photo-opp. 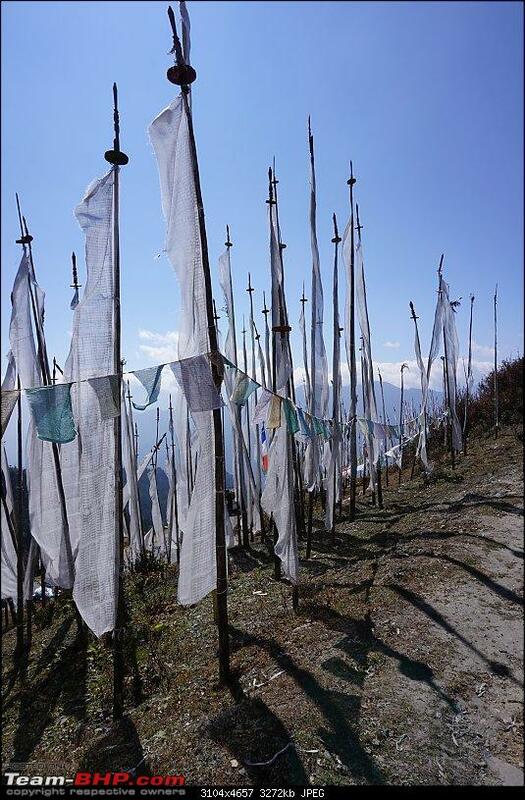 Once parked, we hiked small distance amidst prayer flags to the top and spent some time enjoying views and cool breeze. While returning to the car, slightly hungry, we found a food truck (Tata ACE, in fact) which sold and served only vegetarian food. On the menu were veg momos, pakodas, maggi and coffee, along with many packed food items. Even cakes had a green dot. With the feeling of being able to find an oasis in a desert, we ordered a plate of all items he had (and few more momos) for lunch. We started our descent after lunch at 2 PM. 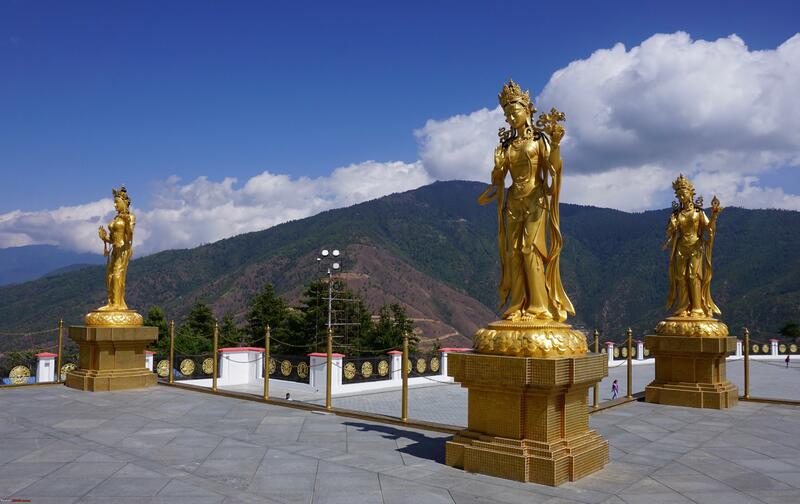 We stopped at the Paro airport view point for watching a take-off and proceeded to Thimphu. En-route was a most artistic public restroom I had ever seen. 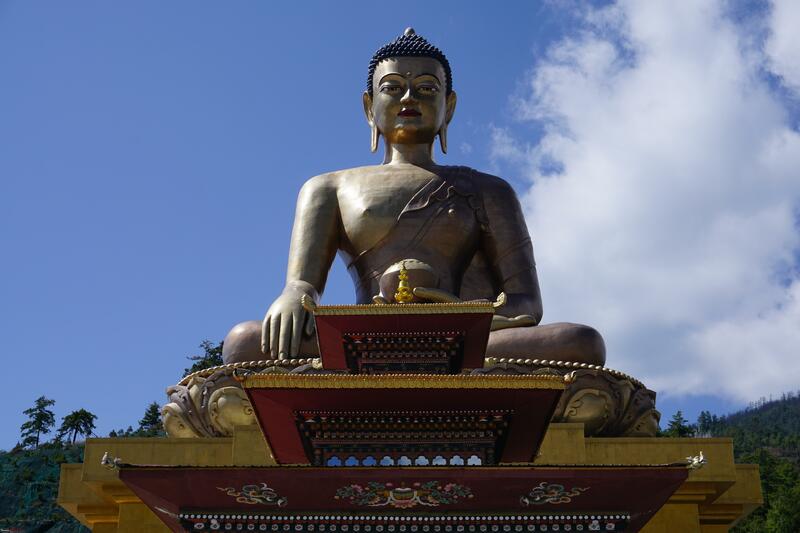 We reached Thimphu around 6.30 PM. Checked into the same “Golden Root” hotel and cooked khichdi for dinner. Slept after some discouraging discussion about possible crowd tomorrow at Thimphu immigration counter due to long weekend. Also, we met a family from Bangalore checked into the same hotel, who were shocked when they heard that a family of three drove down from Bangalore! Last edited by prasanna_indaje : 19th March 2019 at 09:36. Expected this to be a gloomy day and the first half of the day was gloomy indeed. Rushed to the immigration office at 8.30 AM to see a huge crowd in front of tiny office. 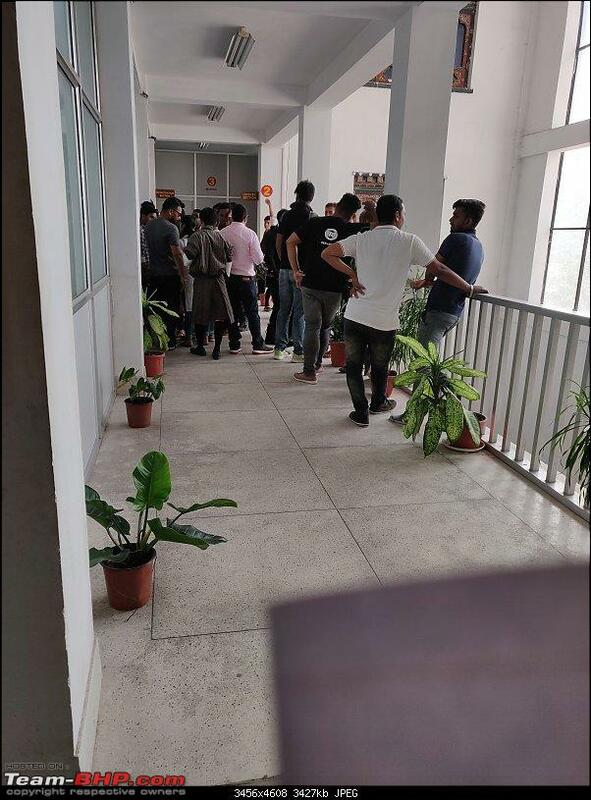 With my experience gained at Phuentsholing, I made some local friends and positioned myself in a queue to go inside the office. 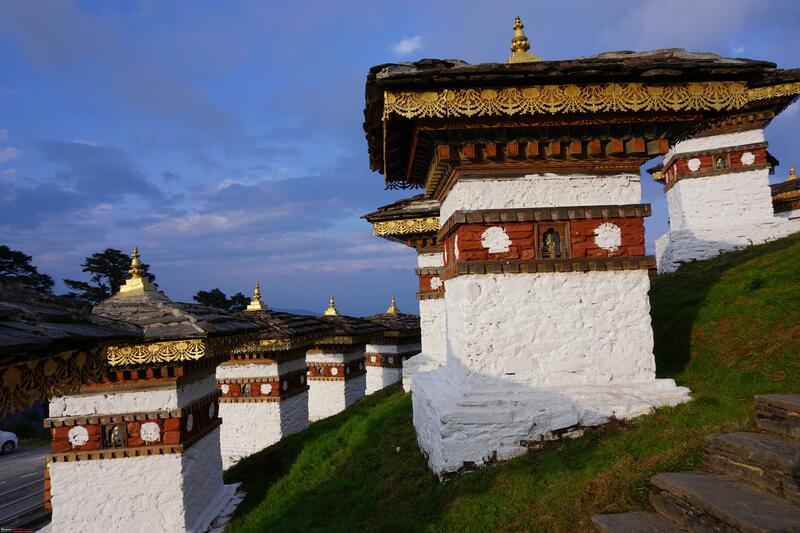 This was our 6th day in Bhutan and we had two tasks to be completed before lunch break. First one was to extend our Visa for few more days (form originally permitted 7 days) and second one was to get inner line permits. After spending 30 minutes in the standstill queue, I realized that the visa needs to be extended first and then ILP needs to be applied. First filled an application for visa extension and submitted it to respective officer, who had stopped smiling already because of number of people around. He took all our passports with the application for extension and asked us to come back after an hour. After submitting the passports, I went back to the queue for ILP and stood there waiting for my turn, which was at least 2 hours away. Approximately after an hour and a half, got back the passports with stamp indicating extension was approved for 4 days. Asked my wife and daughter to be on the queue and I ran like a cheetah (well, an overweight one) to a nearest photocopy shop, only to find it closed. Ran again to another shop, which had a long queue of people waiting to copy their immigration documents. I did not give up and ran further to another shop and got required copies done. Reached immigration counter just in time and submitted application for ILP, with copies of extended visa. Gentleman who collected the form asked us to come back after lunch break to collect the permits. 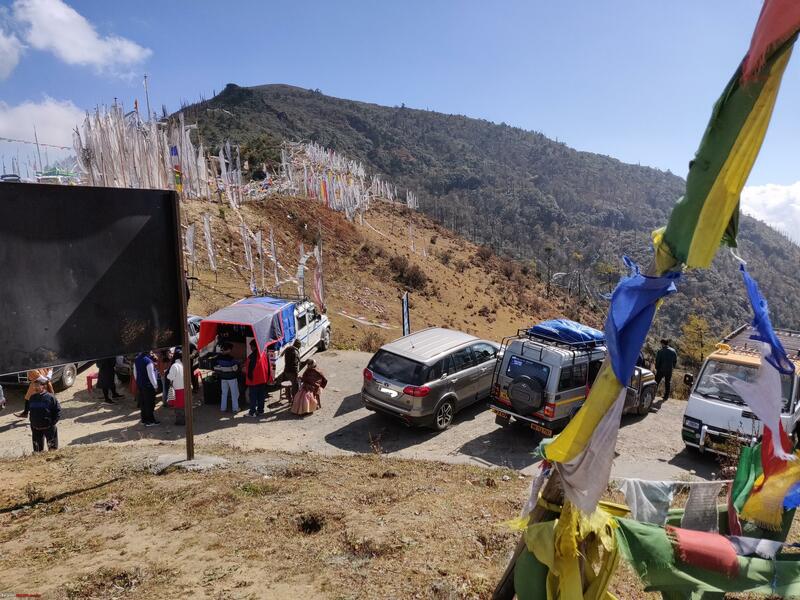 It was 12.30 PM and I drove to the RSTA counter for trying my luck to extend vehicle permit and extend the permit for Punakha, Phobjikha and Haa. Officer there was kind enough to extend the permit for 4 days after paying 100 Nu per day and collecting the receipt. However, he asked to come back after getting ILP to add additional places in the permit. We dragged our sorry selves to the immigration counter, which had a whole lot of frustrated Indian families along with their local guides waiting for their permits. Exactly at 2 PM, office opened, and no one except officers were allowed inside for 30 minutes, after which they started calling people by name to collect their permits. Our turn came at 3 PM. We got our permits, made some copies and rushed to RSTA office again for ILP endorsement in the car permit. On handing over copies of ILP, officer at RSTA wrote additional places (as per ILP) on the original permit and signed with a stamp. Gloominess disappeared from this point in time and we were ready to roll. 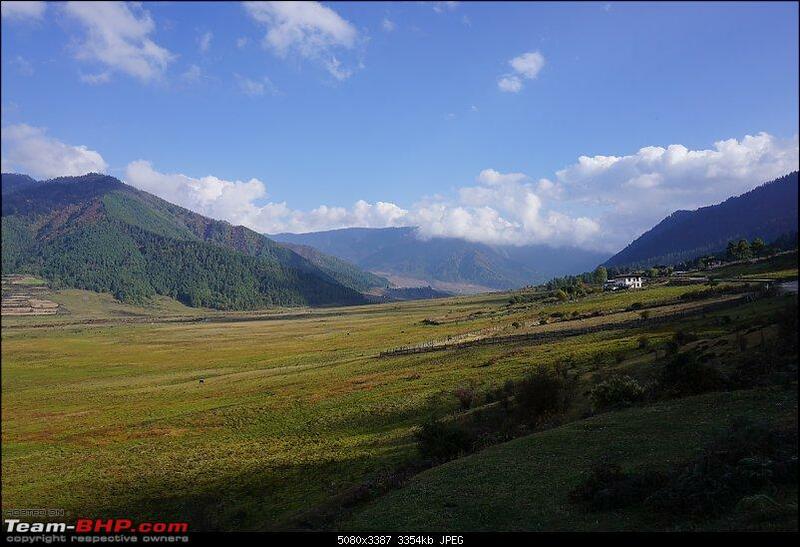 Soon we were driving towards Punakha. 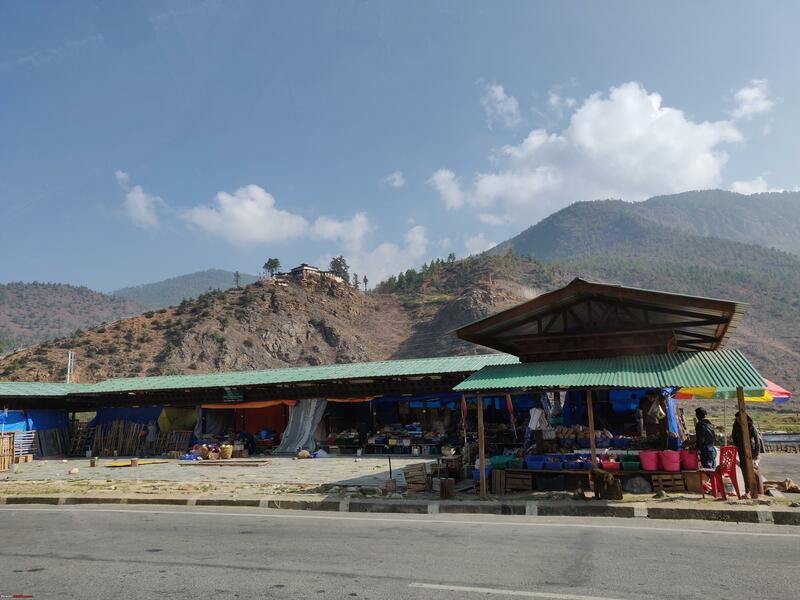 After few kilometers towards DochuLa (and towards Punakha), we stopped at a check post and got our inner line permit entered. Also, we bought two kilograms of golden apple from a makeshift shop nearby, which were crunchy and sweet. 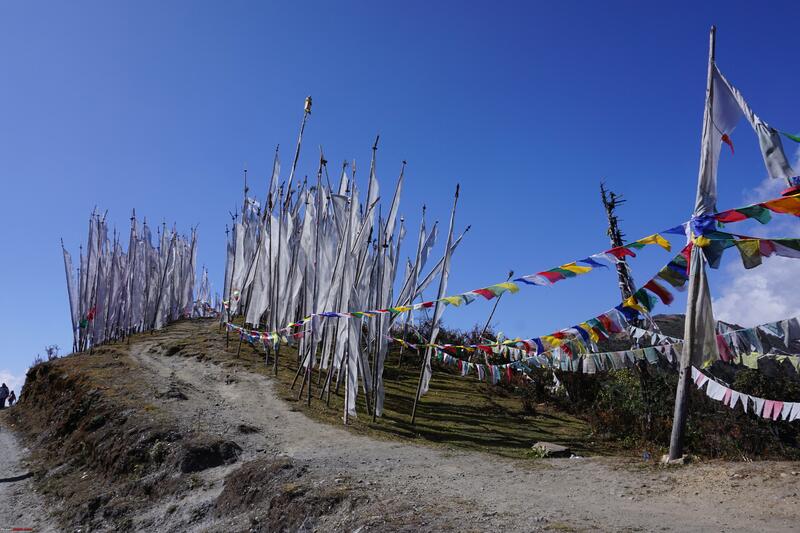 We reached DochuLa chorten by 4 PM and it was a mesmerizing view. 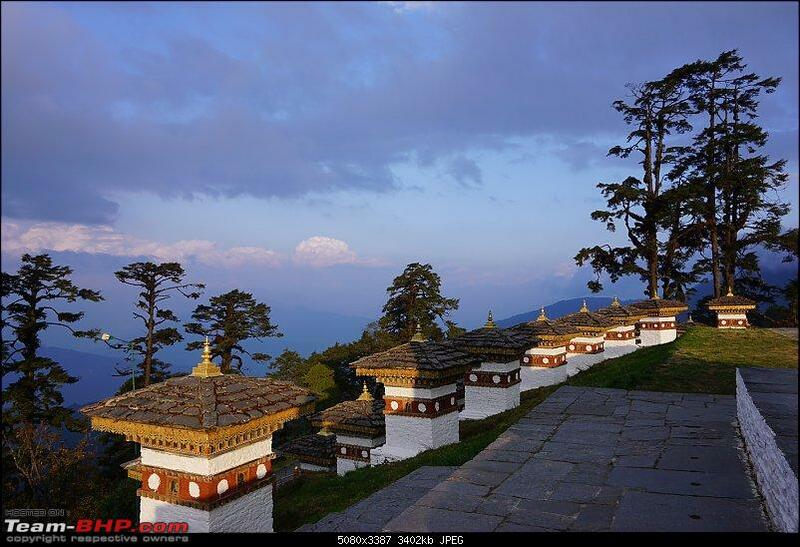 There were not many tourists around and whole complex was glowing in evening rays of sun. Spent about 45 minutes there admiring beauty of chorten and surroundings. 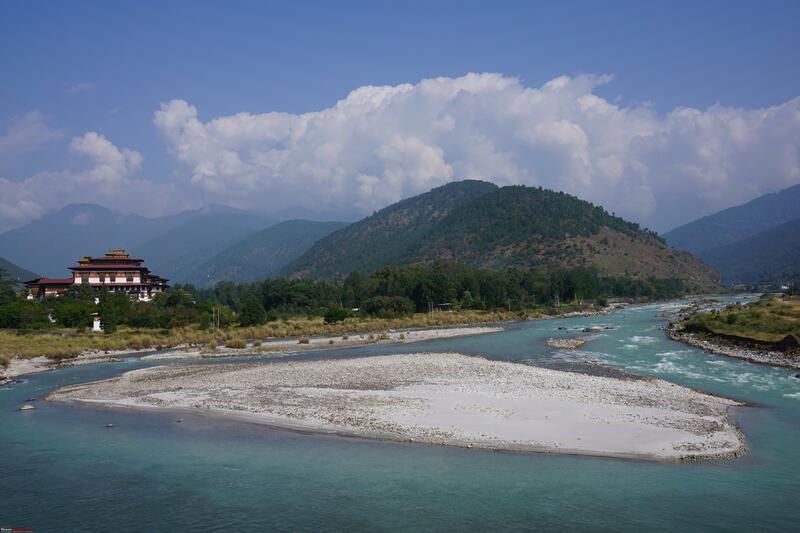 Soon we started our descent to Punakha. Roads were good and took us through thick forests and some small villages. 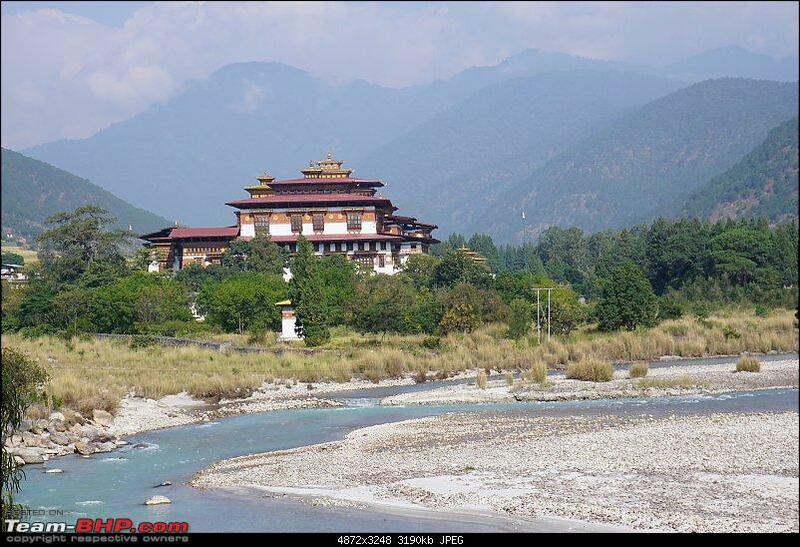 We stopped at few places and reached Punakha by 7 PM. Our stay for the day was booked at Damchen resorts. Took a scroll around the resort and retired for the day. 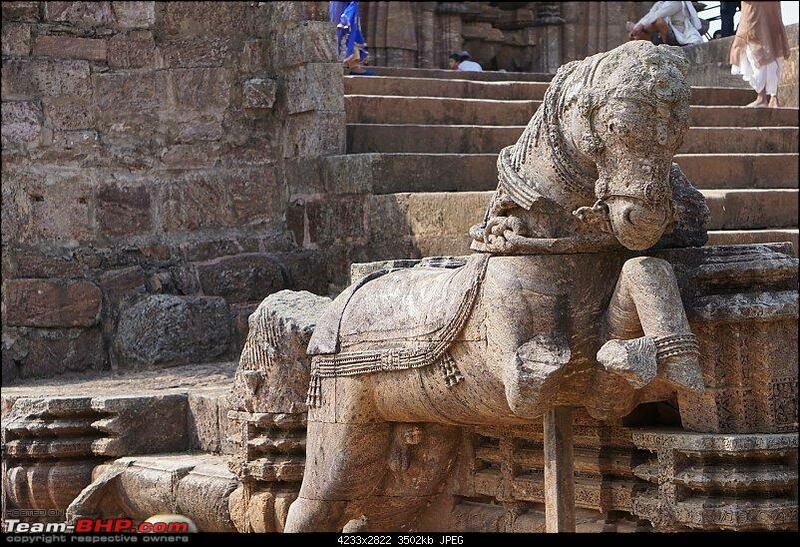 Last edited by prasanna_indaje : 19th March 2019 at 08:42. Unpacked some packets of Ready to cook poha and poured the contents to a stainless-steel container, boiled some water in the electric kettle and poured into the container, and that was our breakfast! 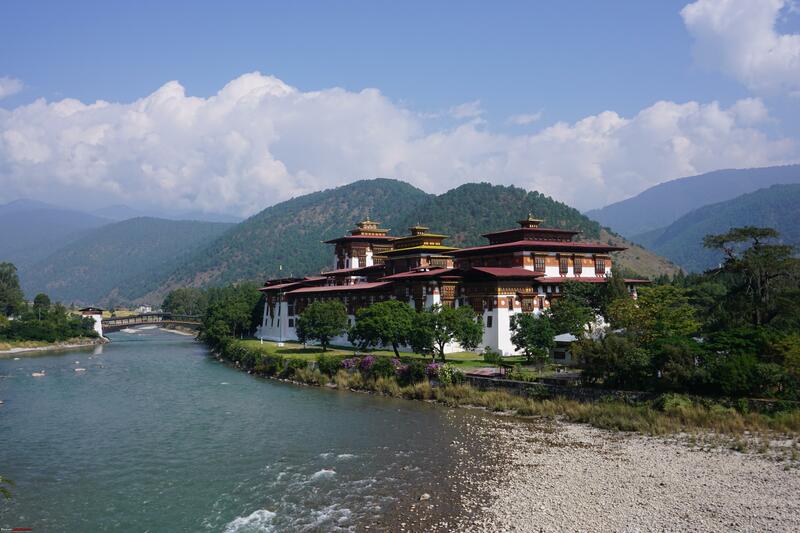 We checked out of the hotel after preparing this quick and now boring breakfast and drove to Punakha Dzong. 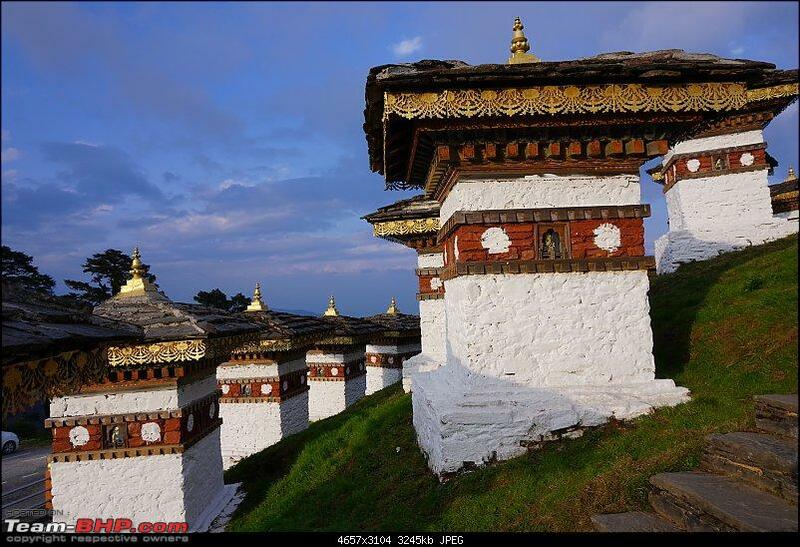 Stopped at a viewpoint before Dzong for some photographs and then proceeded to the Dzong. 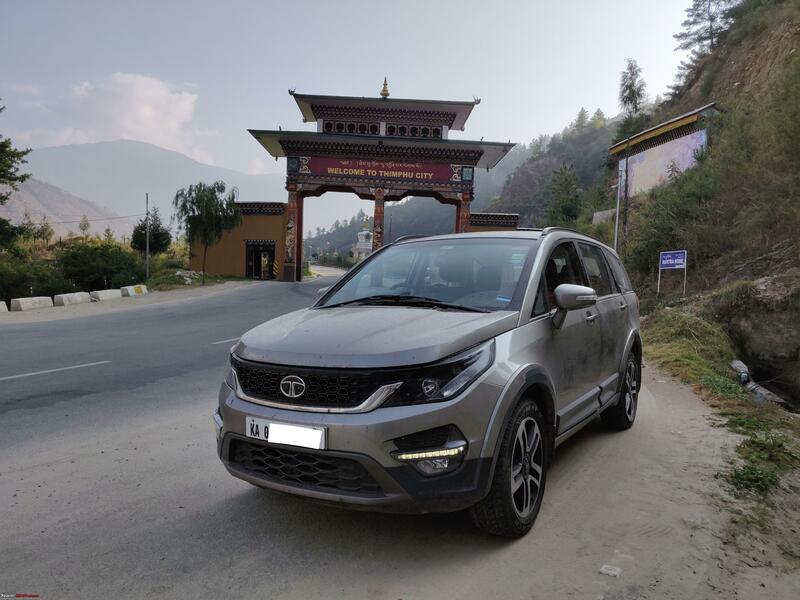 Parked at designated and organised parking lot, purchased tickets (300 Nu per person) and entered the Dzong after crossing a beautiful wooden cantilever bridge. 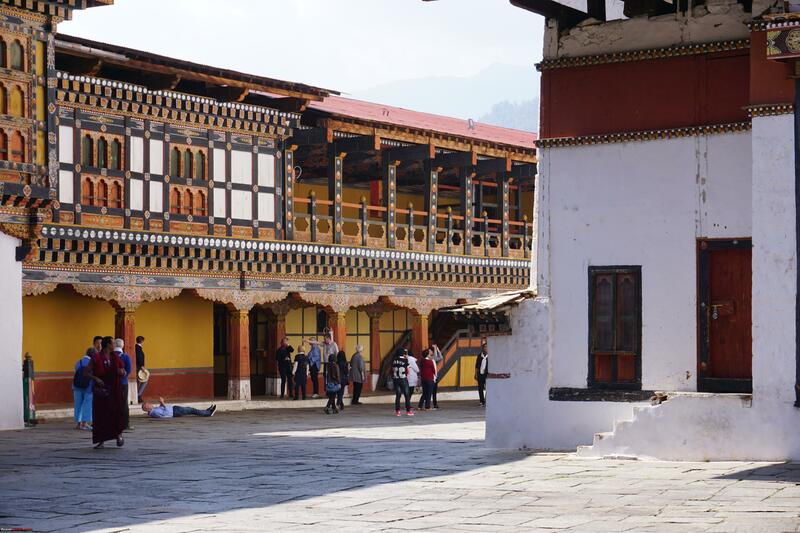 All bags were thoroughly checked before entering the Dzong. 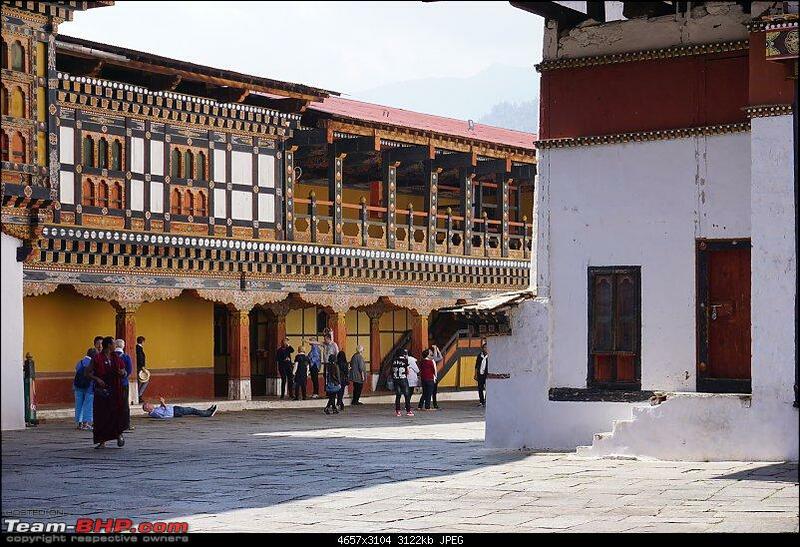 A guide accompanied us for the Dzong visit. 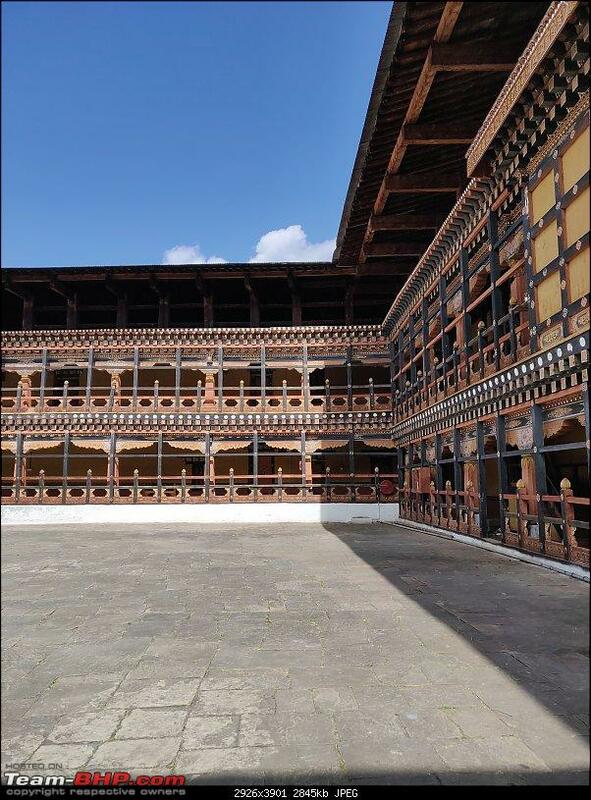 He explained each section of the Dzong, temples inside and customs. 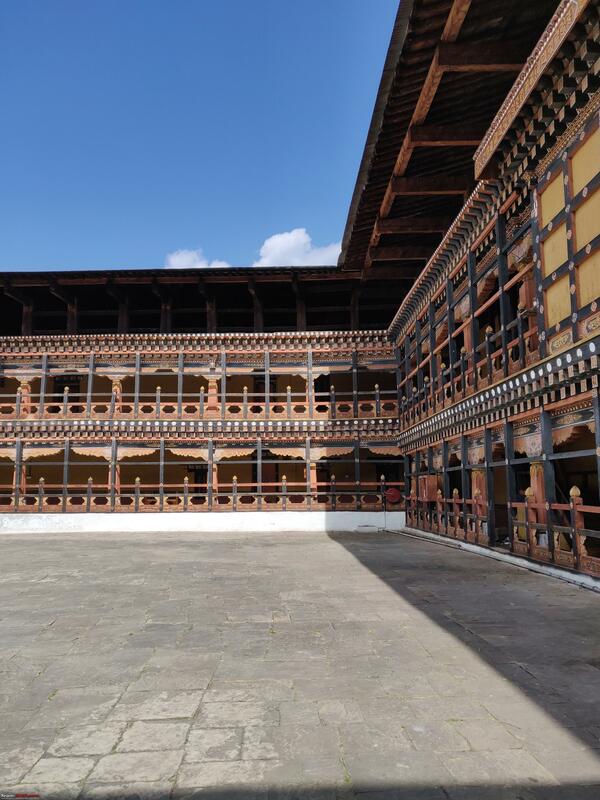 Dzong also houses the royal wedding hall and the place where coronation takes place. 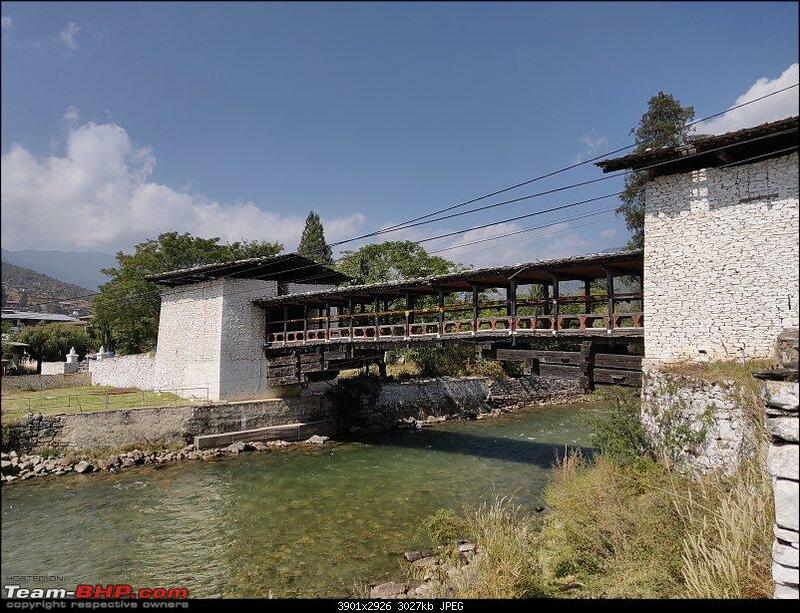 Most part of this structure are built in traditional Bhutanese architecture using wood. This took approximately an hour. 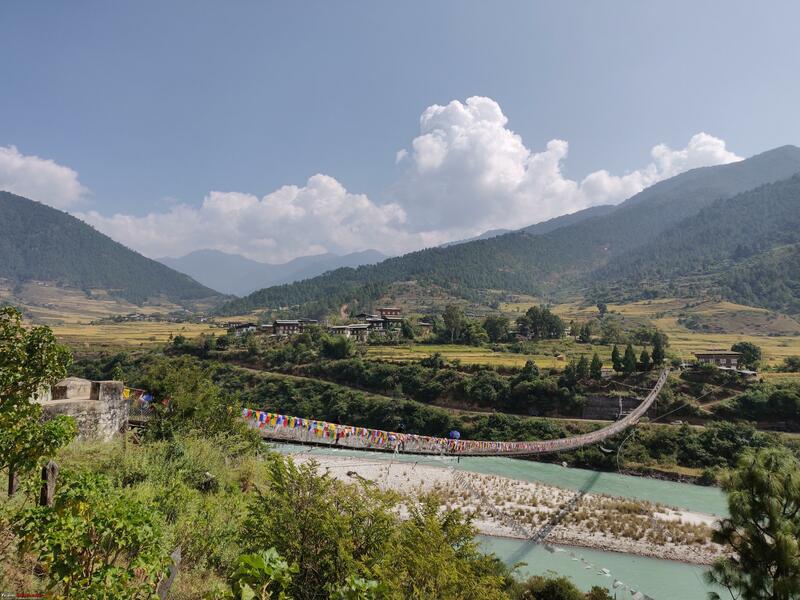 We decided to visit Punakha suspension bridge, which required some amount of walking after parking the car. 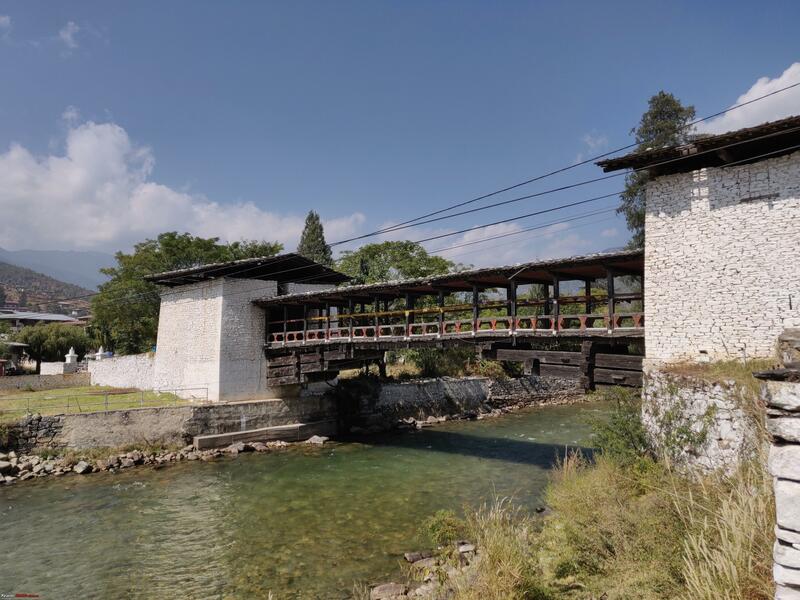 While my wife and daughter chose to stay in the car, I walked to the suspension bridge, took some photographs, walked halfway to other side and returned with panoramic view of surrounding views imprinted in my mind. 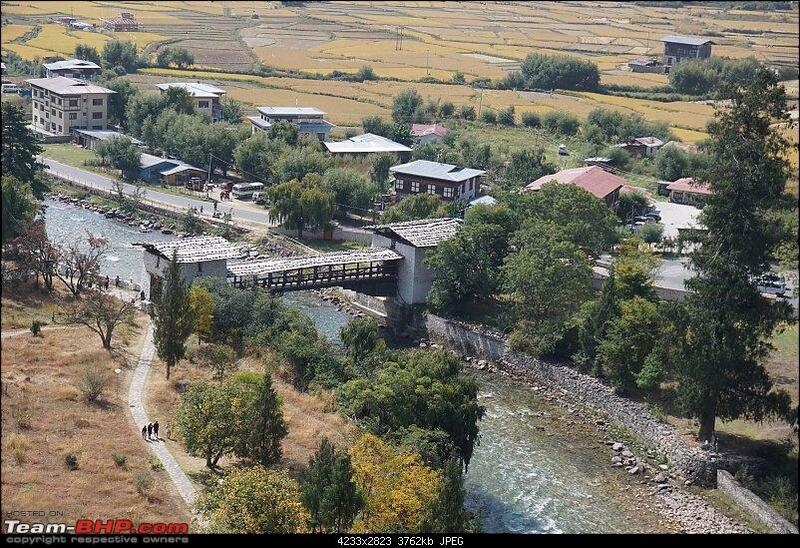 After visiting the bridge, we made an impromptu plan to drive towards Phobjikha and return the same day. 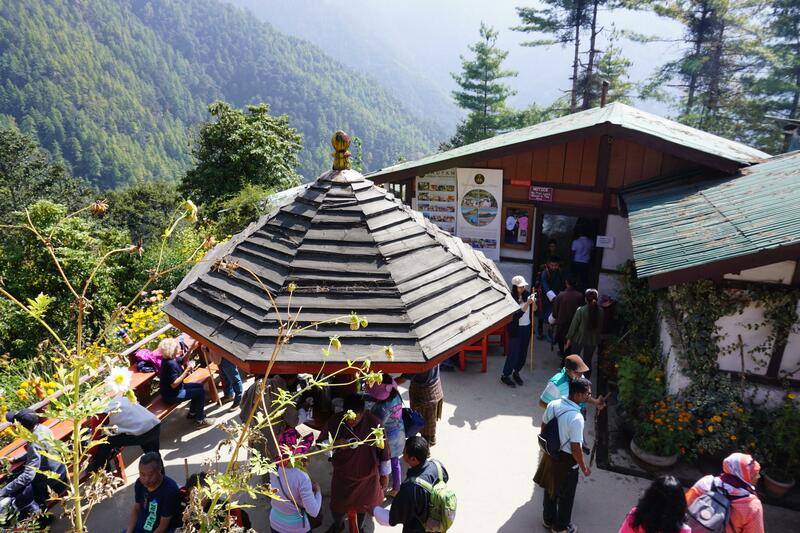 It was unanimously decided that, if we are unable to reach Phobjikha by 2.30 PM, we will return from whichever point we were at 2.30 PM. However, a cunning me, inside me, had a different idea. 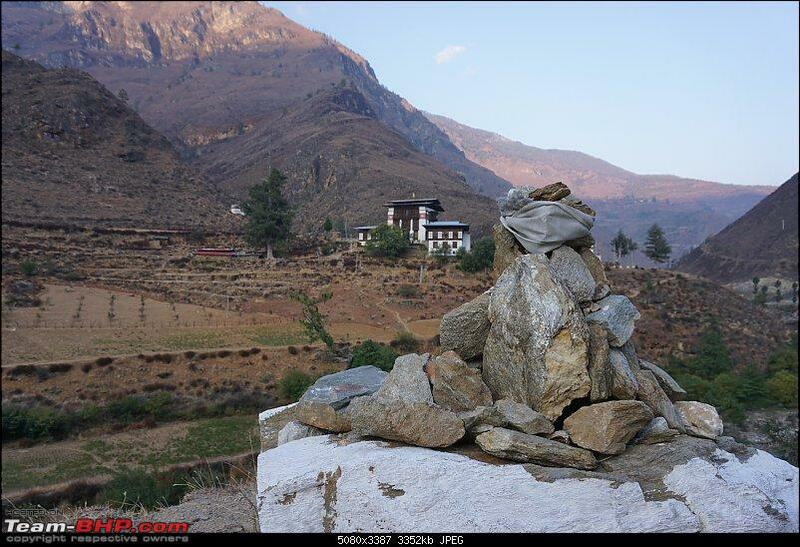 I decided to visit Phobjikha and return, no matter how long it takes. 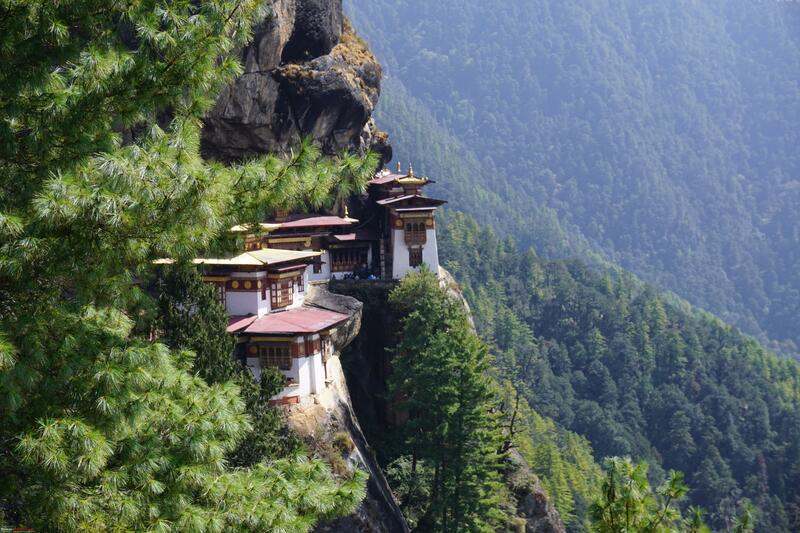 (This was our last stay in Bhutan as per plan). Google maps was indicating 3 hours for the distance of ~90 kilometers. 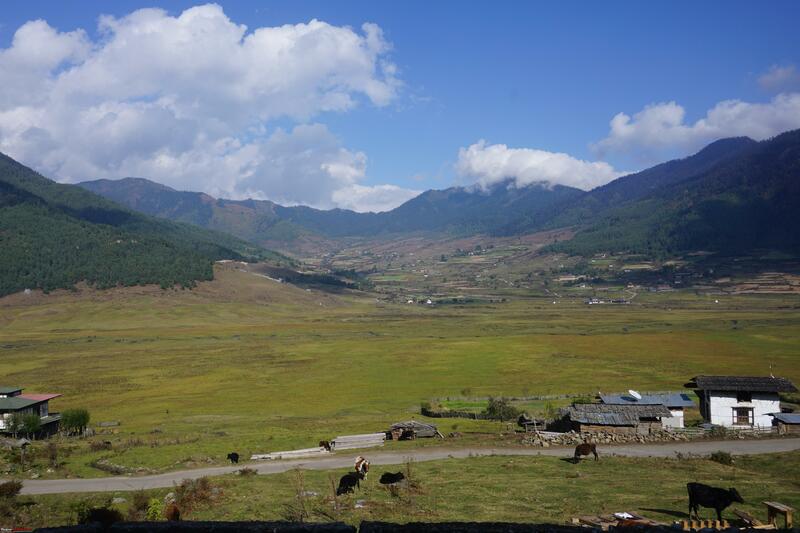 Soon we crossed Punakha town and started driving on broken single road towards Wangdue. 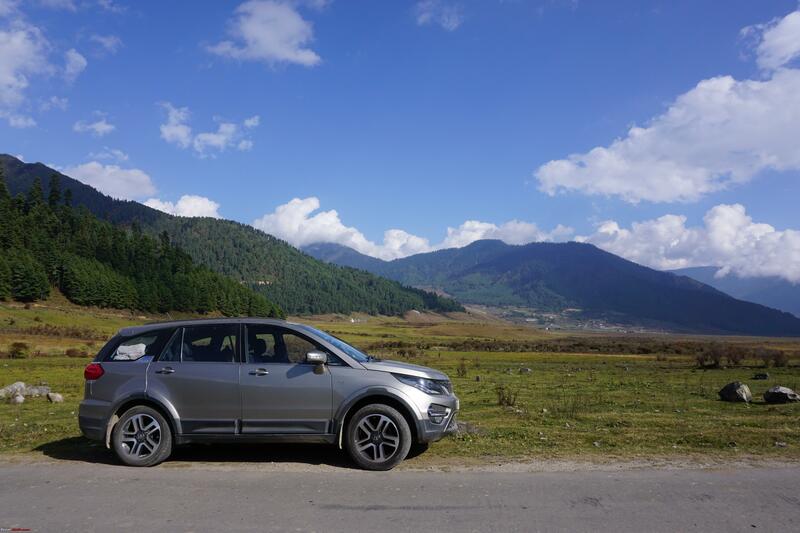 Once we reached Wangdue, roads improved, and we were driving on good roads with bridges which had flags of India and Bhutan in their name plate. 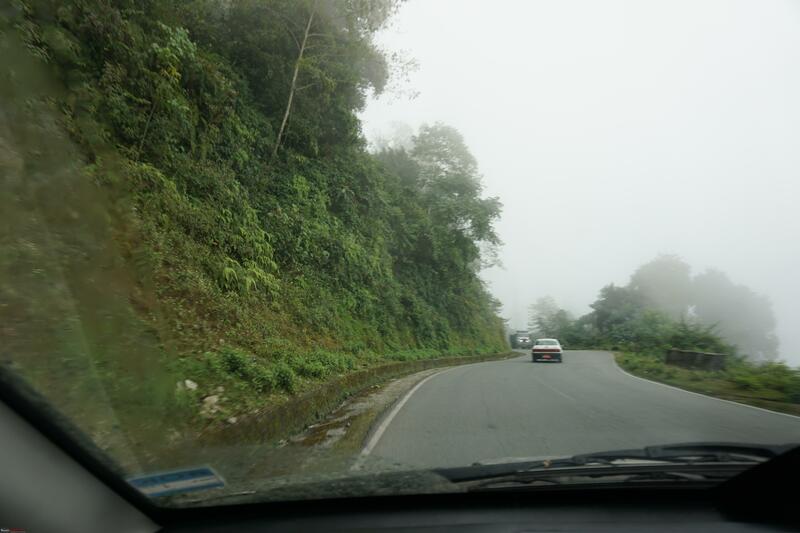 We drove on these winding roads which took us through valleys, colorful forests, small villages, step paddy fields and numerous waterfalls. 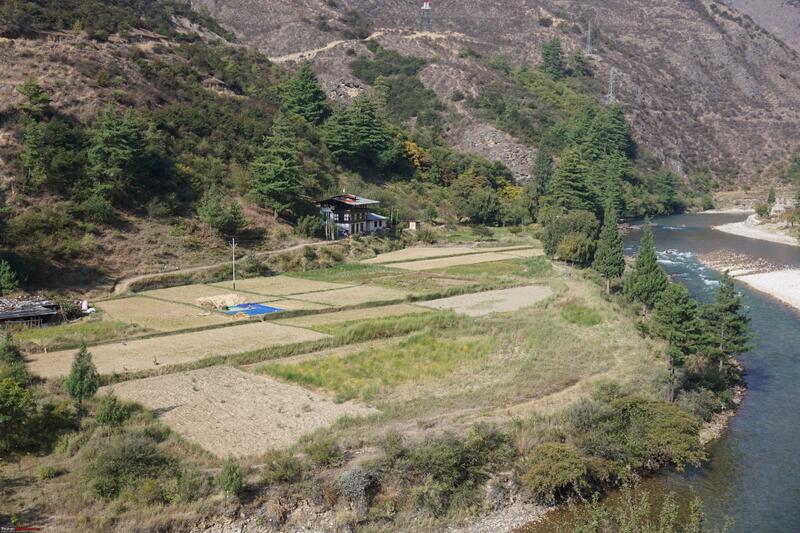 After few kilometers, we observed that the name plate on the bridges we crossed sported Chinese and Bhutanese flags. Roads and surrounding continued to be good, and we drove on to our destination without much worry about the flags born by name plates. 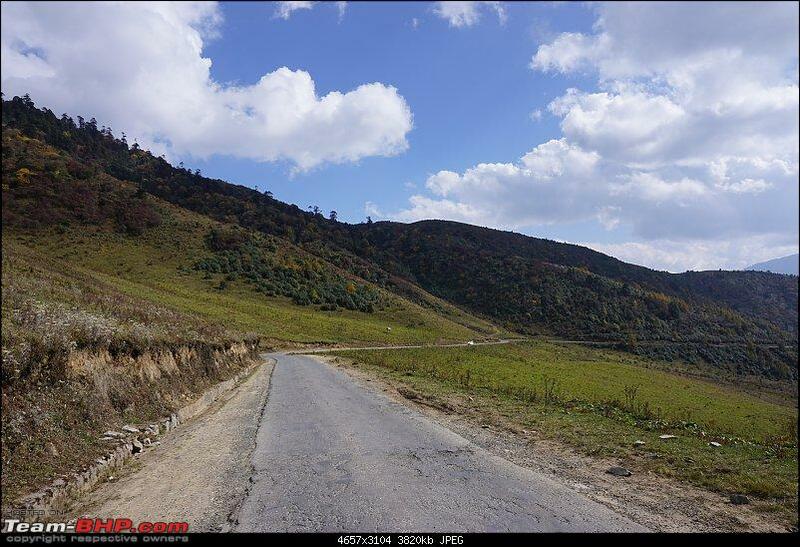 Few kilometers of the road in-between was under construction, but Hexa had no issue dealing with those roads. 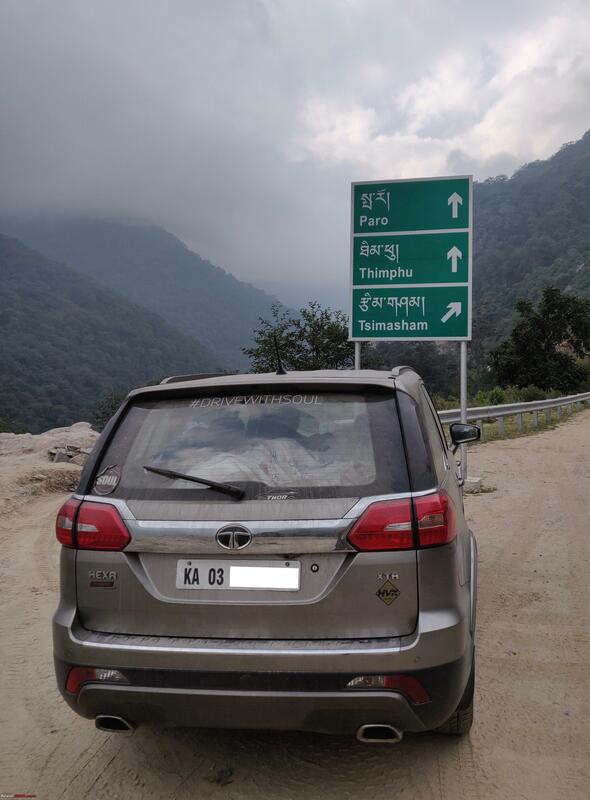 As signboard indicating direction towards Phobjikha wanted us to deviate from good road and take a narrow road after a steep u turn. Navimaps too agreed with the signboard and we took the u-turn and started climbing the ascent. 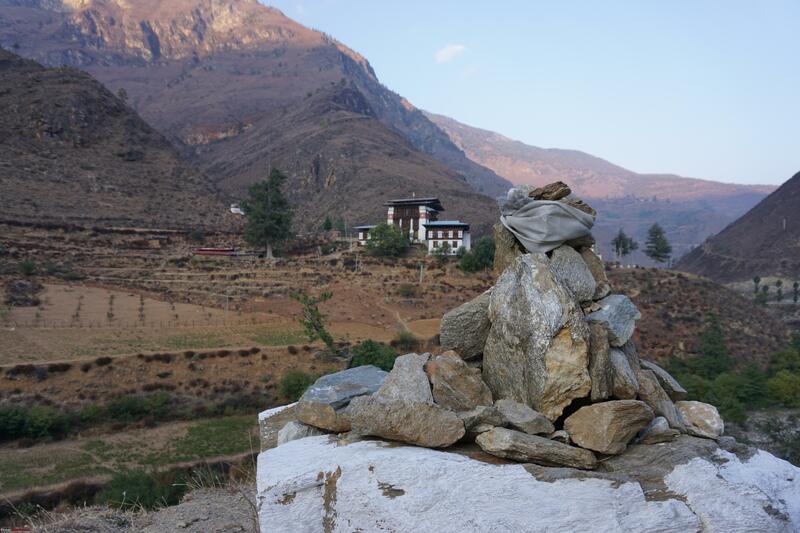 Once we completed the climb, we were greeted by a lone Stupa which opened us to vast and beautiful Phobjikha valley. It was already 3 PM and no one remembered the discussion about returning at 2.30 PM. After driving few kilometers towards black necked crane information center, we realized that we were in the middle of vast green wetland, which houses the cranes when they come here from wherever they belong to. 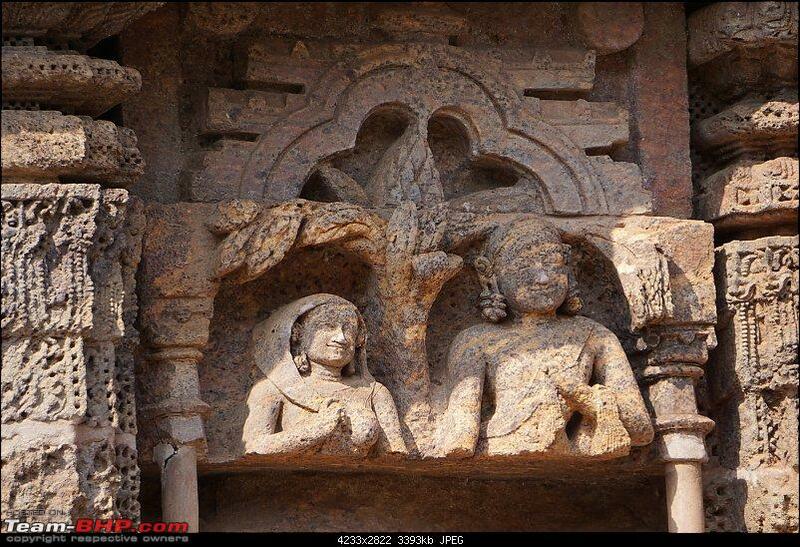 Stopped, clicked, admired at many places and finally reached the information center by 3.45 PM. Took tickets and visited the information center, which has a large observation room with huge glass walls, few sofas and few telescopes which can be used by interested visitors to observe cranes (when they are present, during the season). 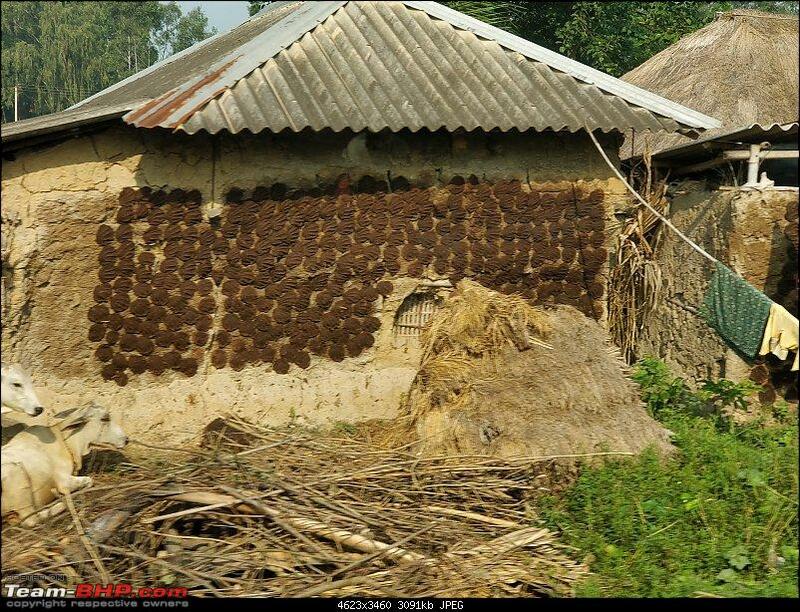 We could not make good use of these facilities as migration season had just started and the birds were yet to arrive. This information center also has a library and a small TV room, which is used to show a documentary film about the center. 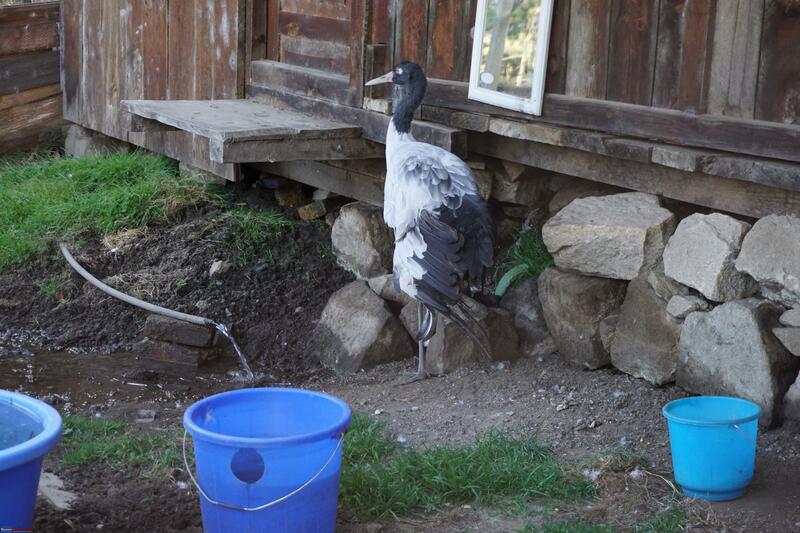 After viewing the grasslands and documentary, we saw ‘Karma’, an injured crane. 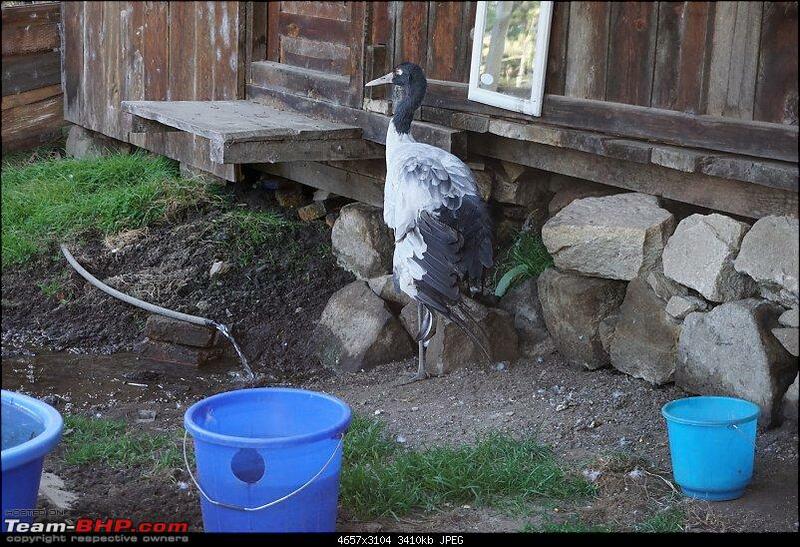 This crane is kept in a large enclosure outside the centre. Came out of the information center and drove for a few kilometers in those wetlands to enjoy the view. 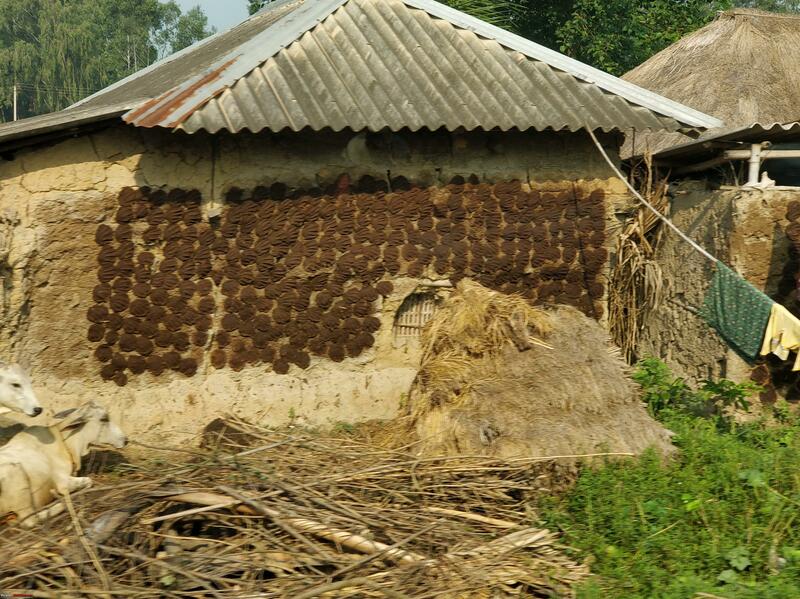 It was harvesting season for potato and related activities were going on in the fields, with full swing. 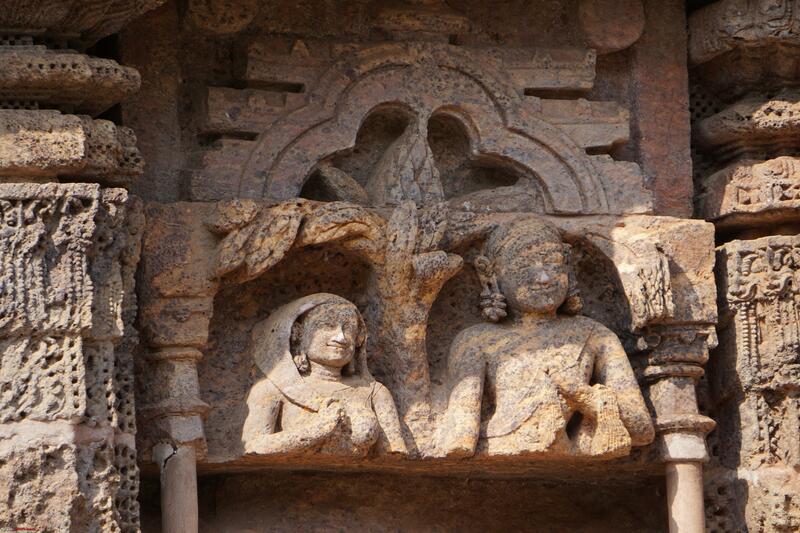 Also observed that this place has many home-stays and some of them looked really enticing. 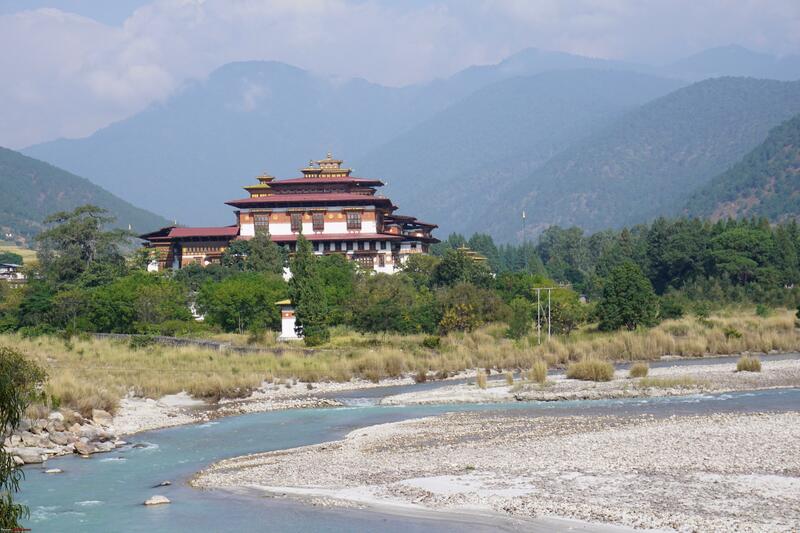 Due to lack of time we could not research much and headed back to Punakha. Our accommodation for day was booked at Hotel Y. T Lobesa, which was decent in terms of facilities. Cooked a quick version of khichdi and retired for the day. 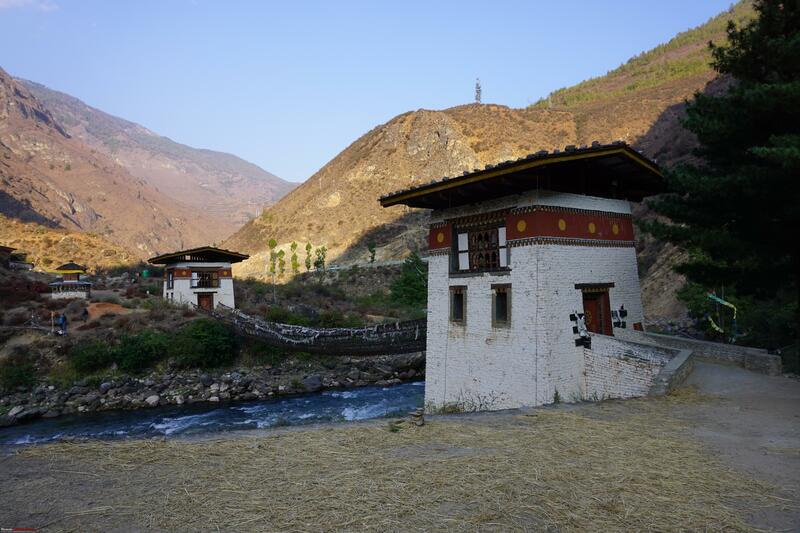 Some sort of nostalgia was bothering all three of us as it was our last night’s stay in Bhutan, for this trip. Last edited by prasanna_indaje : 19th March 2019 at 09:33. Day 13 (24th October) : Homecoming starts ! John Denver started singing “Take me home on country roads” soon after we started our drive from Y T Hotel. 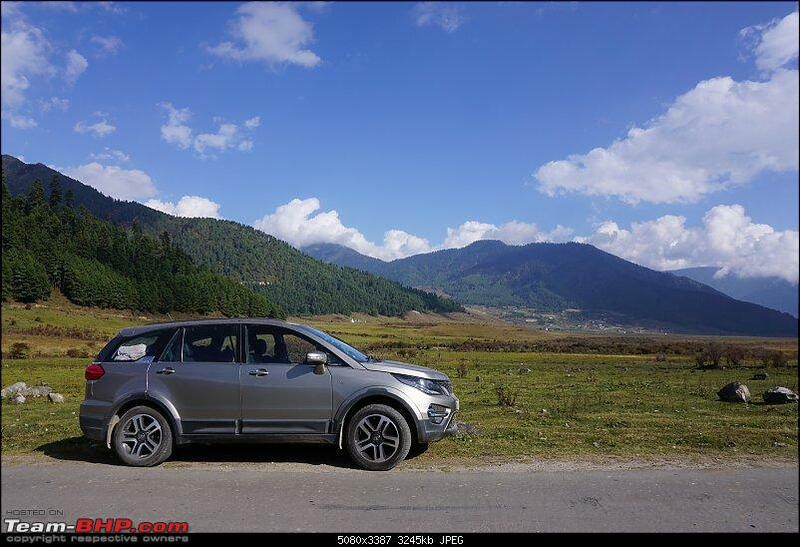 We started our drive at 5.30 AM and reached deserted DochuLa pass by 7 AM. Spent about half hour at the pass and started our drive back towards Thimphu. 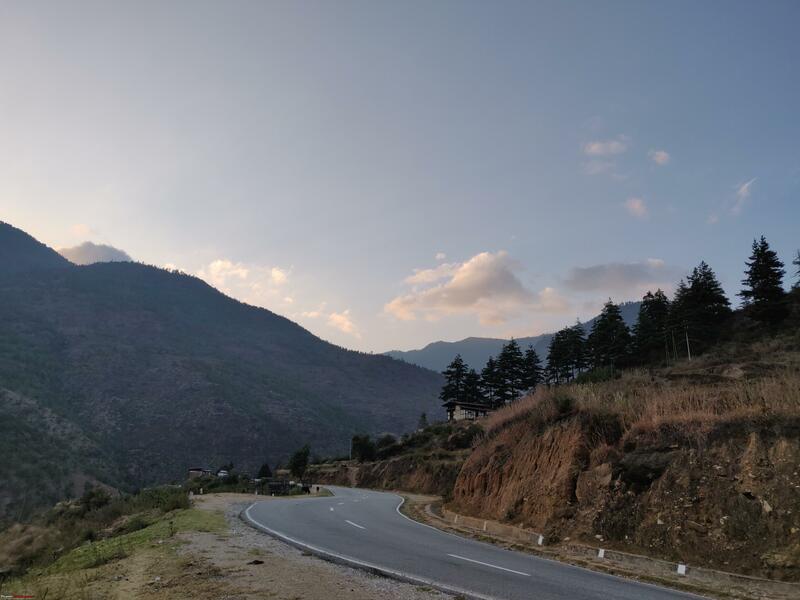 We reached Thimphu by 8.30 AM after returning ILP soon after the pass and drove straight to Ghasel restaurant for breakfast. After breakfast, spent an hour in the handicraft market giving finishing touch to our shopping list. 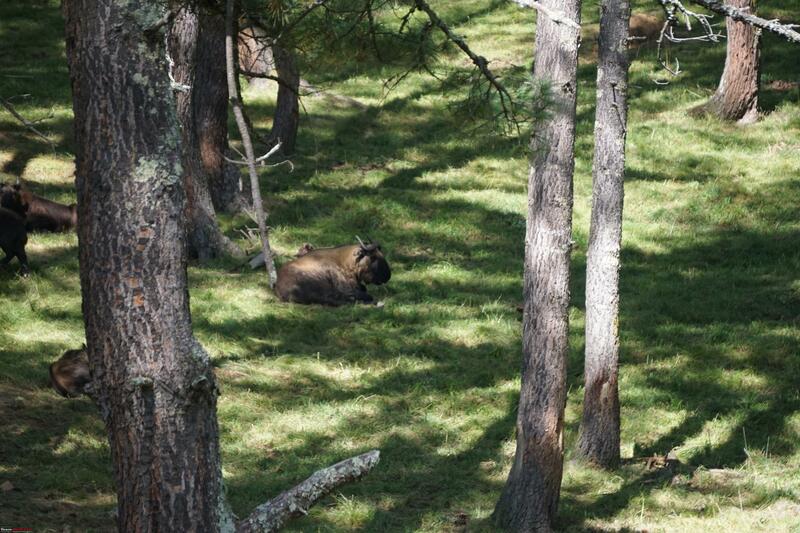 Once done, we drove to Takin Zoo to see national animal of Bhutan. 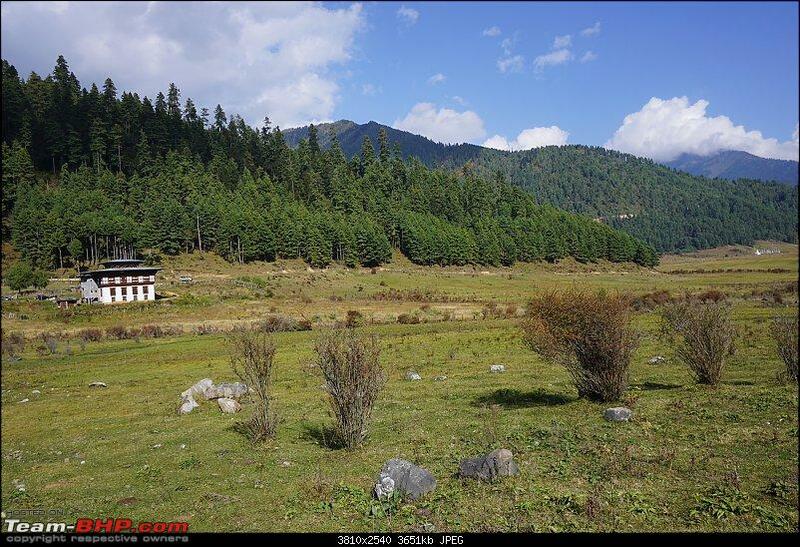 Zoo is located few kilometers away from Thimphu city and needs an hour to cover all enclosures. In addition to Takin, there are few varieties of deer in different enclosures. 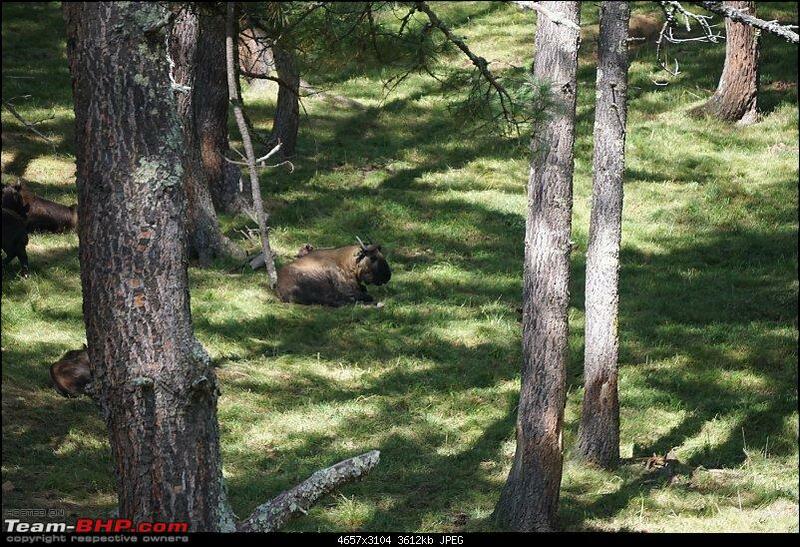 We could see some Takins which were taking rest at some distance. 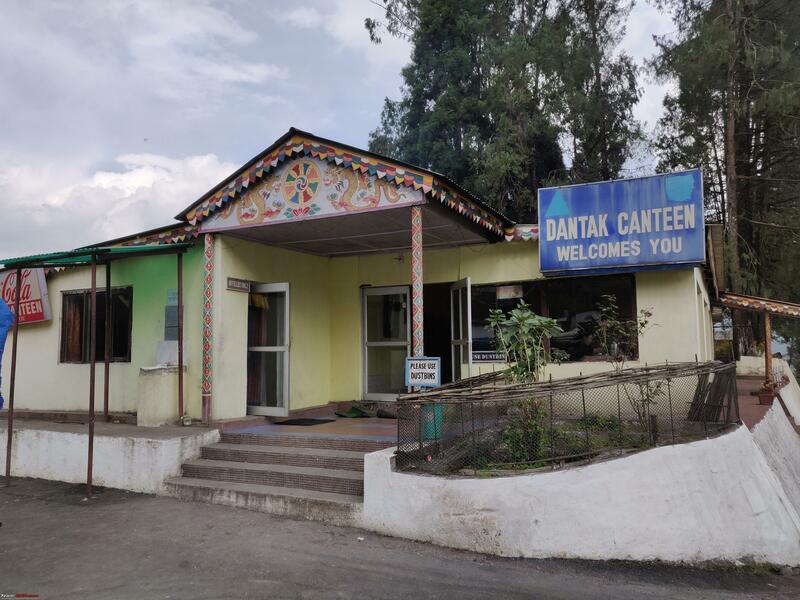 We stopped at DANTAK canteen for lunch after completing formalities in the first check post and reached Phuentsholing check post by 3.30 PM. Here we returned our vehicle permit and passports were stamped with exit stamp. 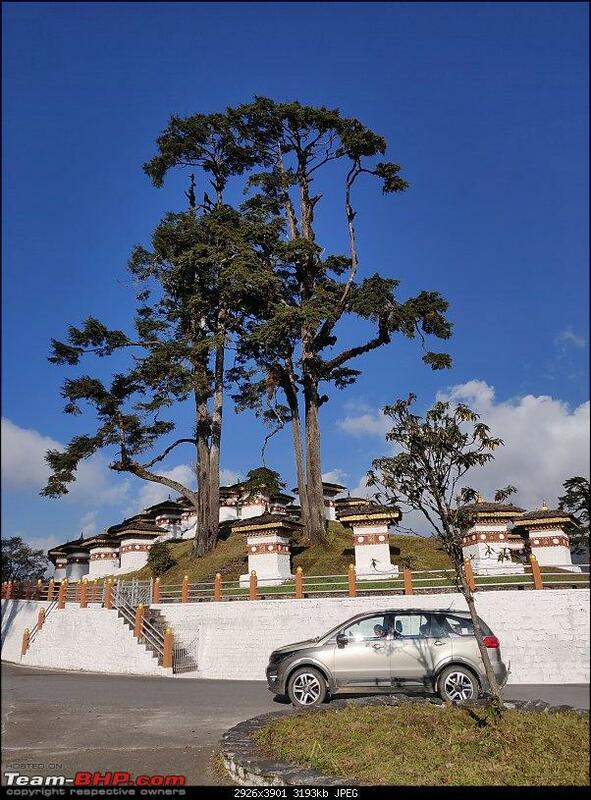 Once done, we entered Phuentsholing city, took a small break, exited Bhutan and entered our country. As we entered, we were greeted by environment that we are usually used to. I could honk as much as I wanted, could overtake when I wanted (not when vehicle ahead permits), park as I needed and mainly, no more driving under 50kmph. More importantly, it was a sense of returning home, after a long journey. 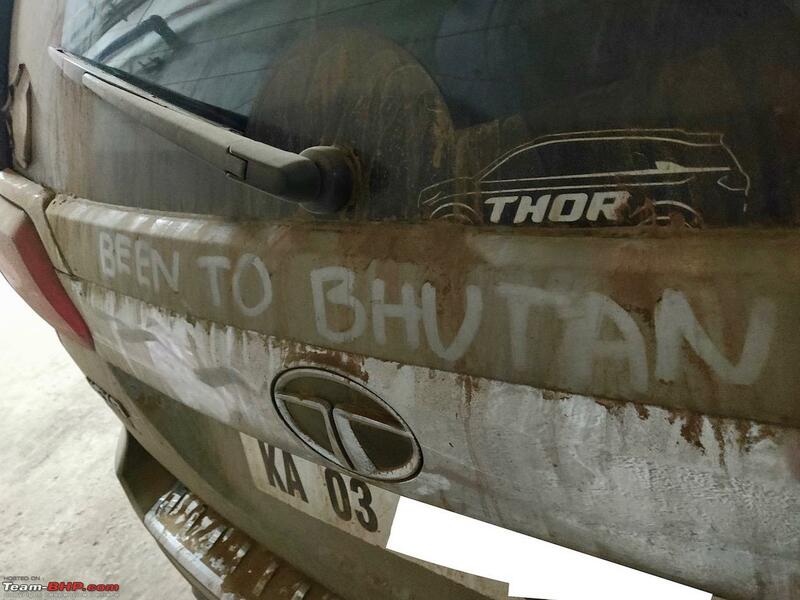 Surprisingly, even red plated Bhutan vehicles seemed to celebrate their newfound freedom buy honking as much as they wanted, once they were on this side of the border. We still had kilometers to go before end of day. 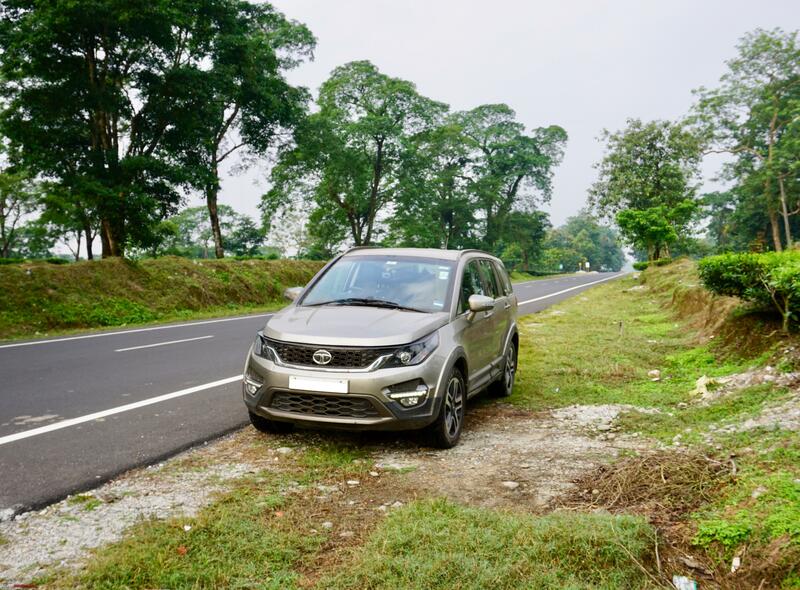 Drove through congested Jaigaon, a reserve forest, few villages, coronation bridge and narrow ghat section to reach Siliguri by 8 PM. Accommodation of the day was at Hotel Cinderella. Had dinner in the restaurant and called it a day. 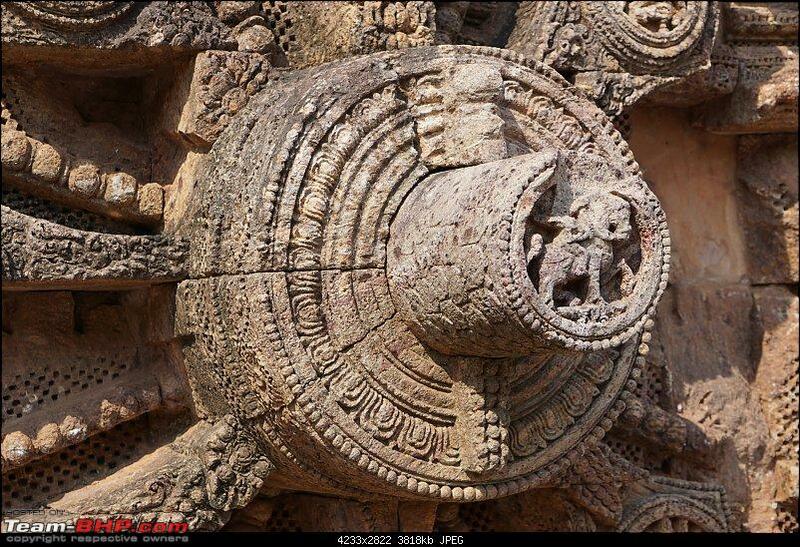 Last edited by prasanna_indaje : 20th March 2019 at 09:08. Day 14 (25th October): Once bitten always shy! When we told receptionist that we will be driving to Kolkata this morning, he reconfirmed what we told, to ensure we were in right state of mind. This behaviour did not surprise us at all as we had been through that journey once already and had clear understanding of what it meant. 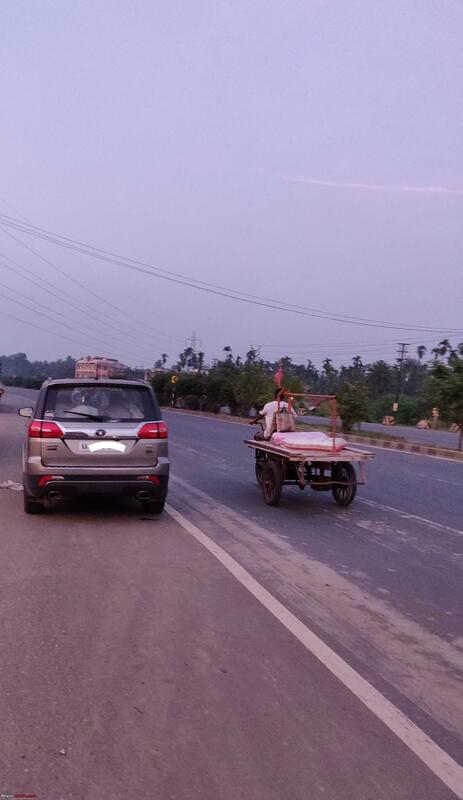 After dilly-dallying few minutes on whether to choose route via Bihar or WB, we decided to take WB route via Malda. Known devil is better than unknown devil. 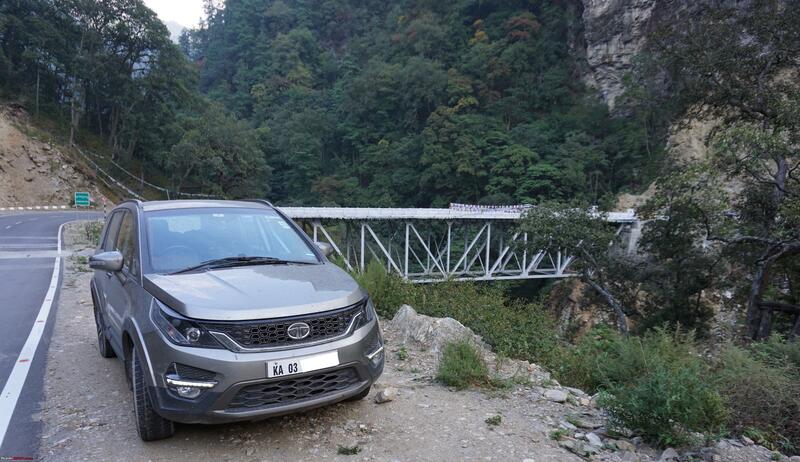 We started from Siliguri at 5.30 AM and took alternative route via Raskhova, which helped us to bypass bottlenecks around Dalkhola. 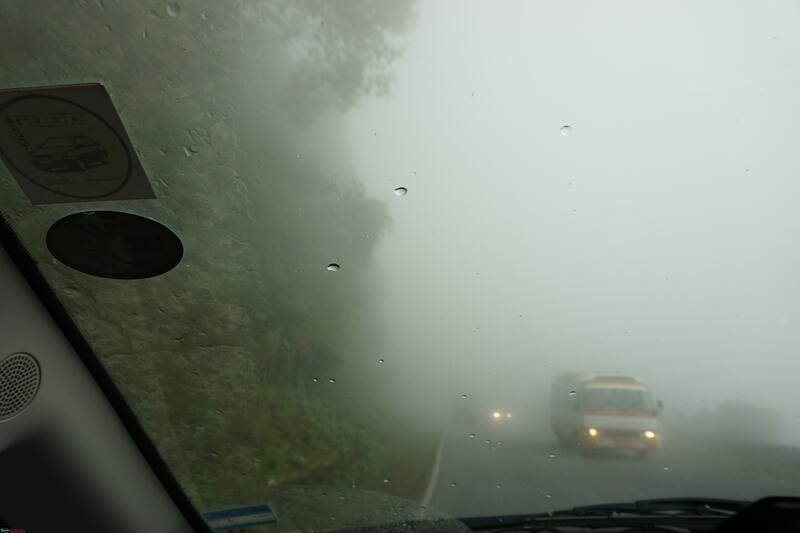 This road was narrow state highway with moderate traffic (including few trucks). 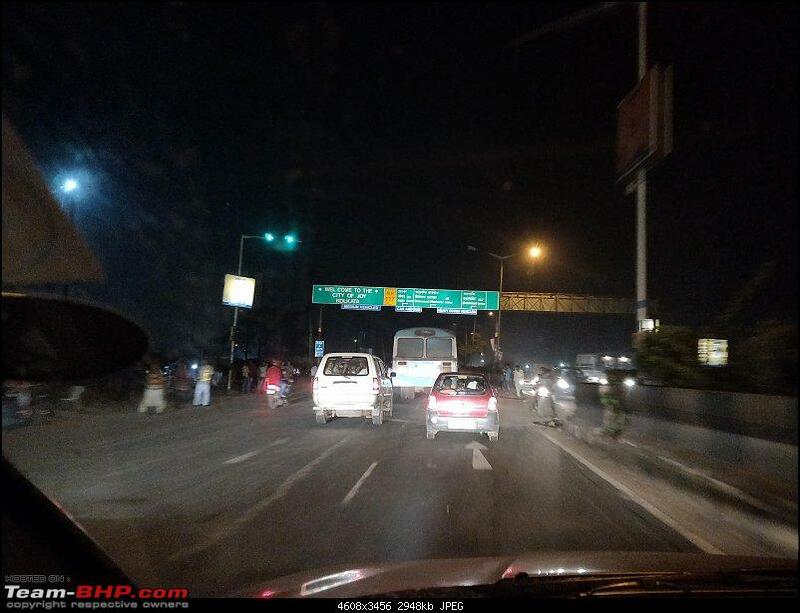 After joining the NH, we drove alternatively on right and wrong side of the road till Farakka Barrage, where we got struck for good 45 minutes due to ongoing repair work on the barrage. 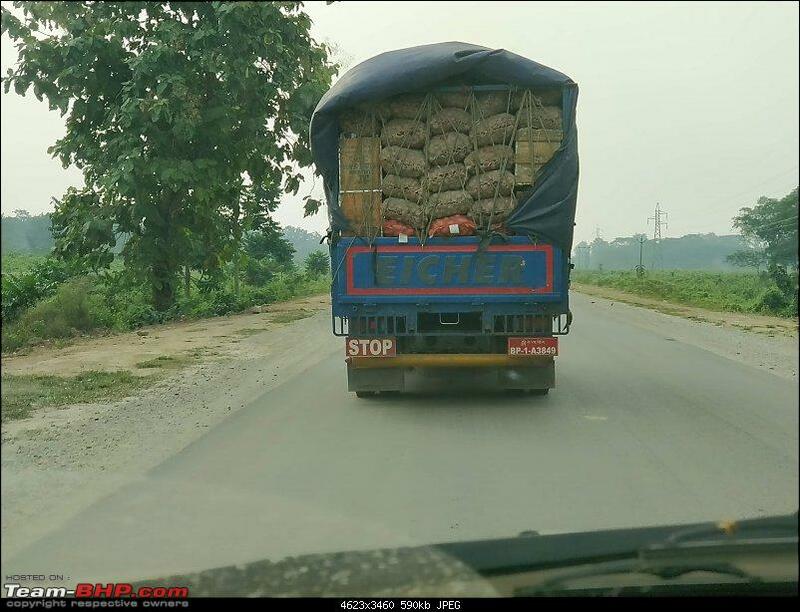 We drove on the extreme right till barrage and merged to line of trucks which were on the left side, patiently waiting for their turn to cross. For sure they waited more than few hours (may be days too, judging by the line of trucks waiting). Some great soul in the form of the driver of an AP registered truck, let us merge and we crossed the barrage along with slow moving (very slow moving, rather) traffic. As imagined, half of the road on the barrage was closed for repairs and the vehicles were being released once from either side alternatively. 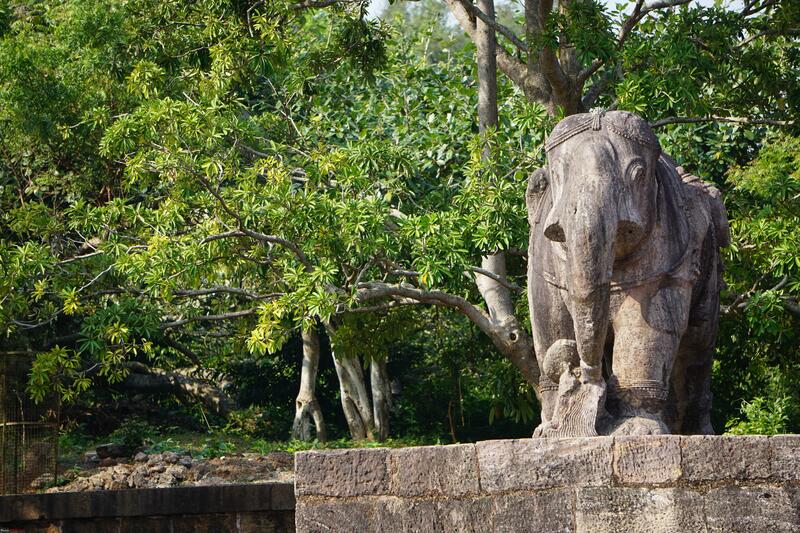 Malda and Kalichak were kind on us and Dalkhola was bypassed. 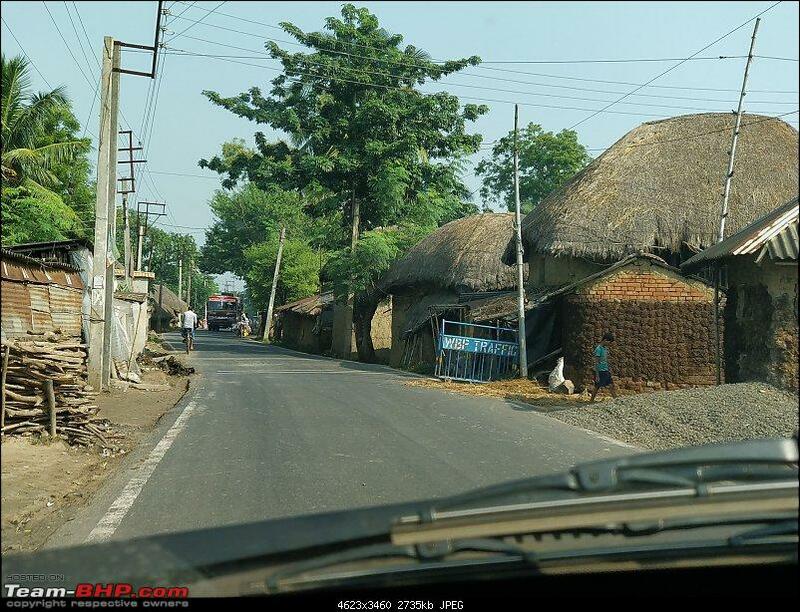 We crossed Bardhaman by 5.30 PM and reached our hotel (HHI) by 7 PM. For our luck, hotel upgraded our stay to a suite. Freshened up quickly and took an Uber to Anand Restaurant, an old timer south Indian restaurant where my wife’s uncle works. This was a surprise visit and it worked. Gulped down almost all dishes available there and packed some for the road next day. There was no financial transaction in this restaurant visit. Came back to the hotel, enjoyed nice facilities of the suite and called it a day. Last edited by prasanna_indaje : 19th March 2019 at 09:26. 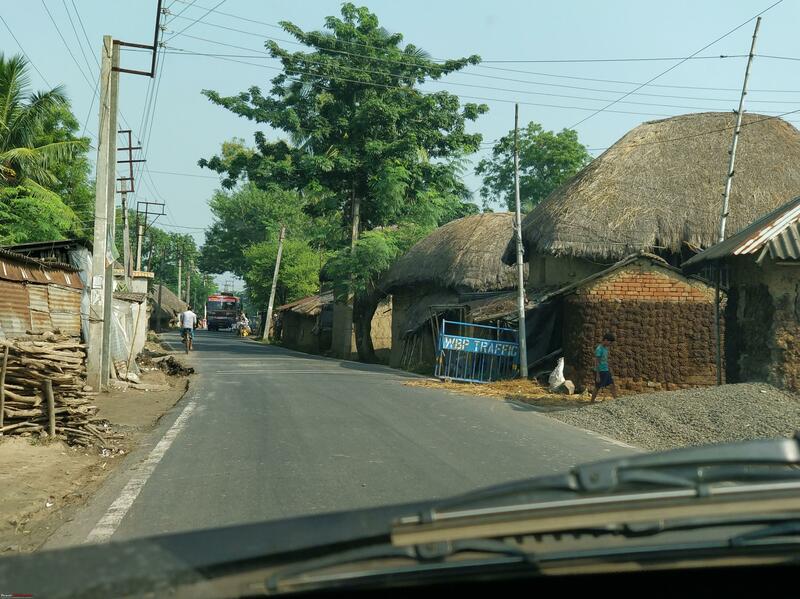 On day 15, started from Kolkata by 6.30 AM and we were on the outskirts of Kharagpur by 10 AM. Had our packed breakfast in the car and proceeded towards Bhubaneshwar. We stopped at a small local cloth shop to buy some Bengali cotton saris and this turned out to be a good deal. While wife was happy about quality and quantity, I was happy about price. 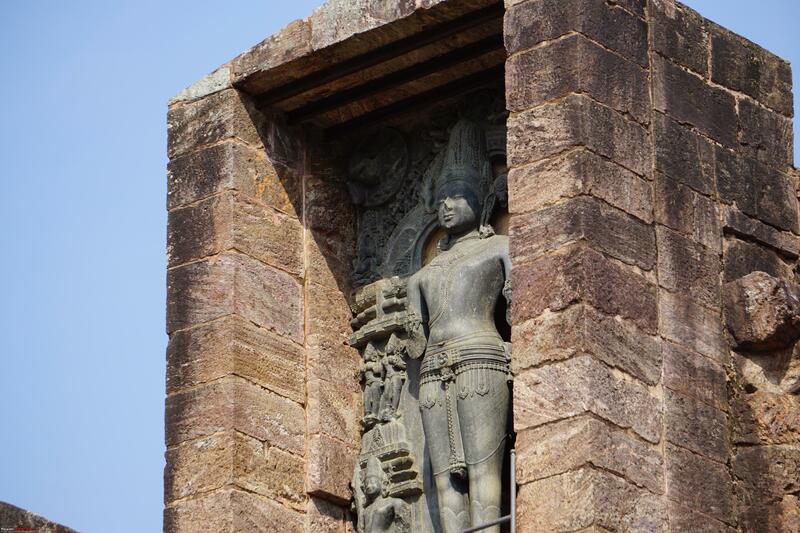 We crossed Bhubaneshwar by 3 PM and reached Puri by 6 PM. It was dark, and Google maps decided to take us through a stretch of under construction road for 6 kilometres to reach our resort. Having no option, we drove on suggested road and reached our resort by 7 PM. The road was completely deserted, and we saw only a couple of small shops on the side. 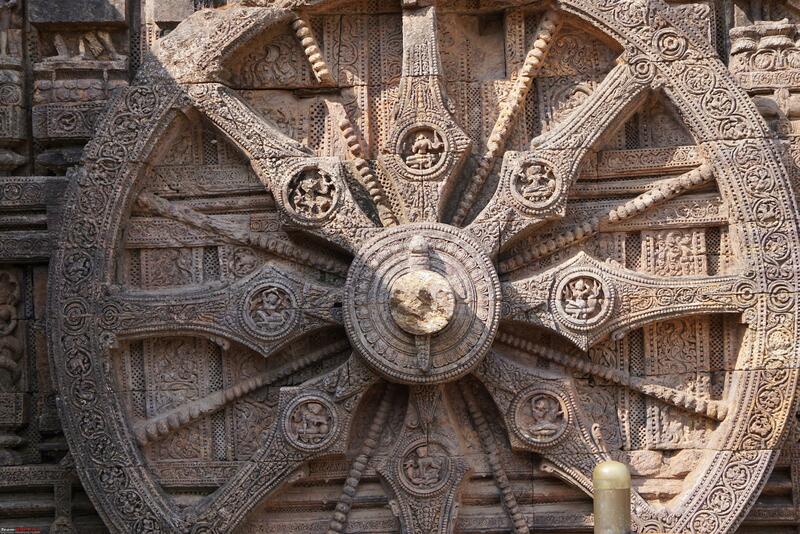 After checking into the resort and settling down we decided to go to Puri town. 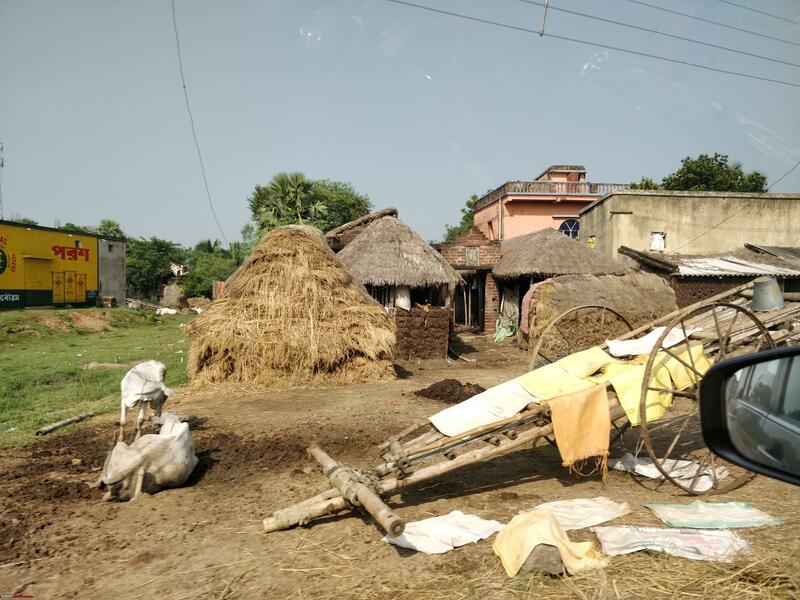 I was hesitant to take car out after seeing traffic and narrow lanes, which made us hire an auto rickshaw to the temple complex from the resort. Auto dropped us off near temple complex. 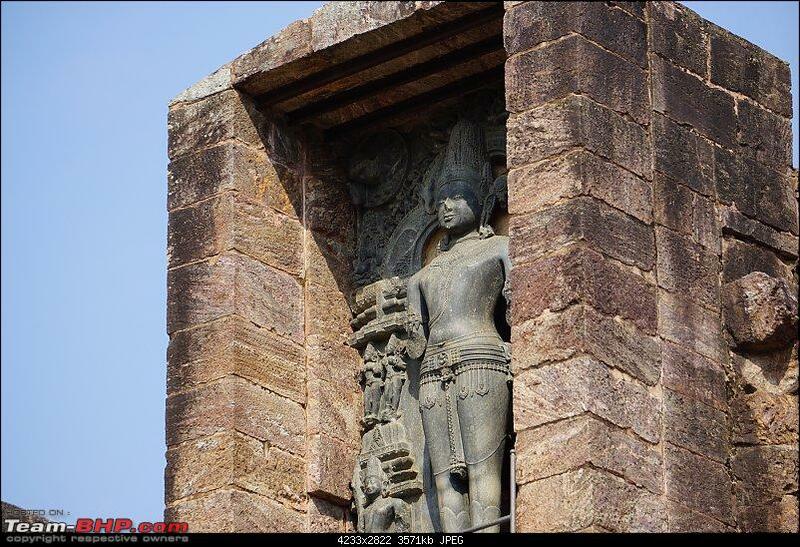 Temple tower was standing majestically amidst usual hustle bustle of the Indian temple town. So were many century old eateries around, which successfully stood against the waves of time. Had dinner in one of the eateries after walking in few narrow alleys. To summarize, it was a parallel universe on its own. Again, took another rickshaw back to the hotel and retired for the day. Got up at 7 AM on day 16 and took an auto rickshaw again to the temple. 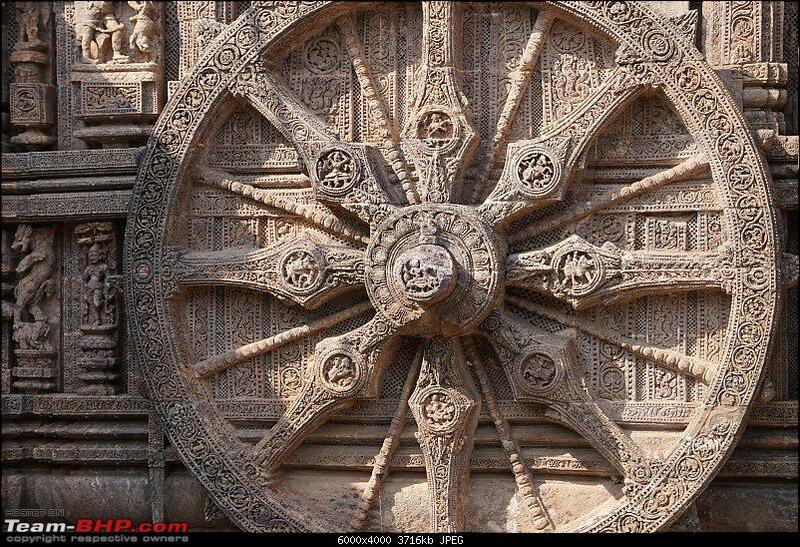 Intention this time was to enter the temple and have ‘Darshan’ of ‘Lord Jagannath’. 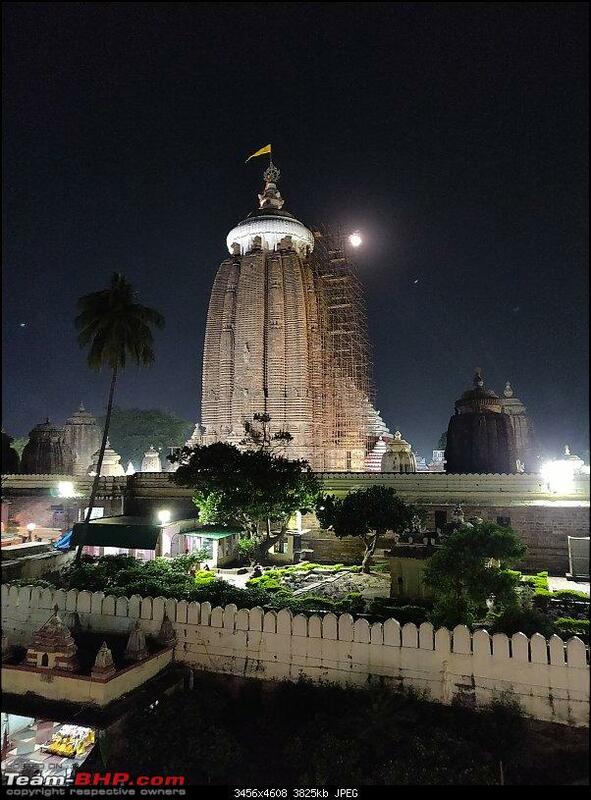 It took around 2 hours to visit all prominent spots in the temple complex and have good darshan of Lord Jagannath. 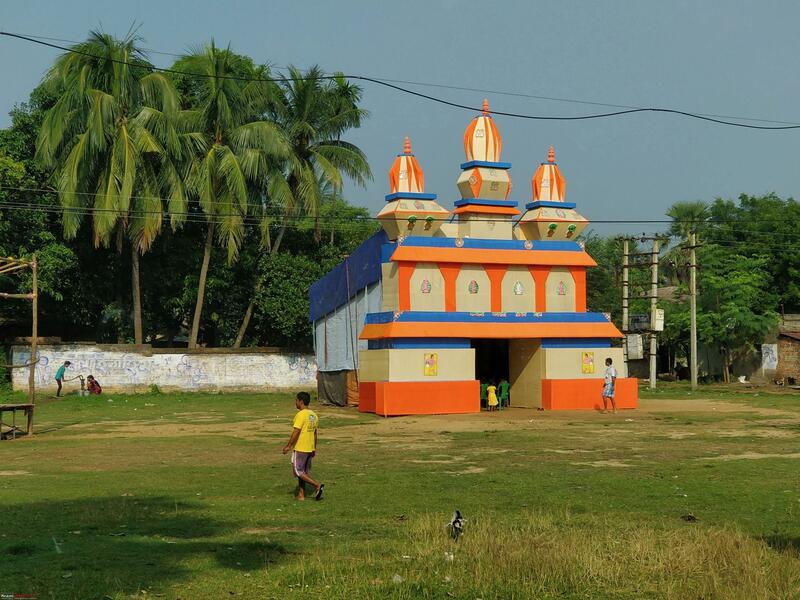 I roamed around Ananda Bazar after darshan and bought prasad (or Bhog, as it is popularly called). Came out and had few hot Samosas and Vadas with signature green peas curry for breakfast from an old eatery. Also downed couple of tasty sweets from another shop nearby. Took a scroll again on the by lanes of Puri and hired an auto rickshaw back to the hotel. 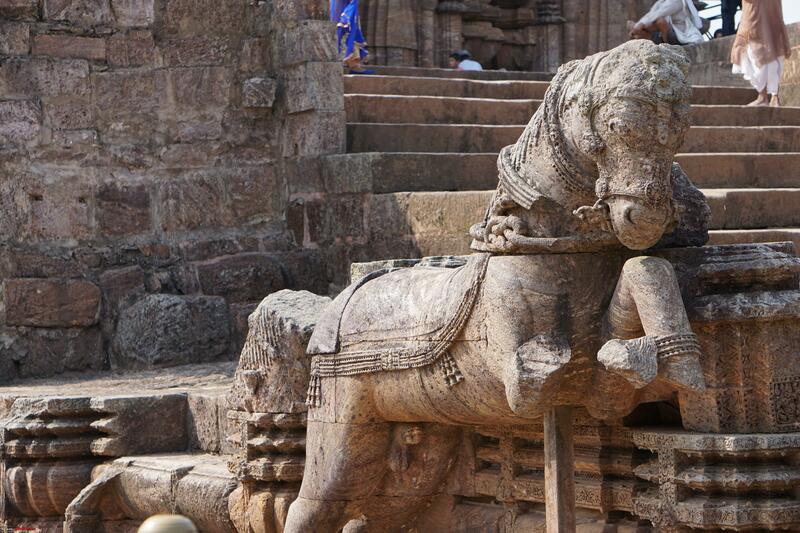 Next stop in the itinerary was Konark Sun Temple. 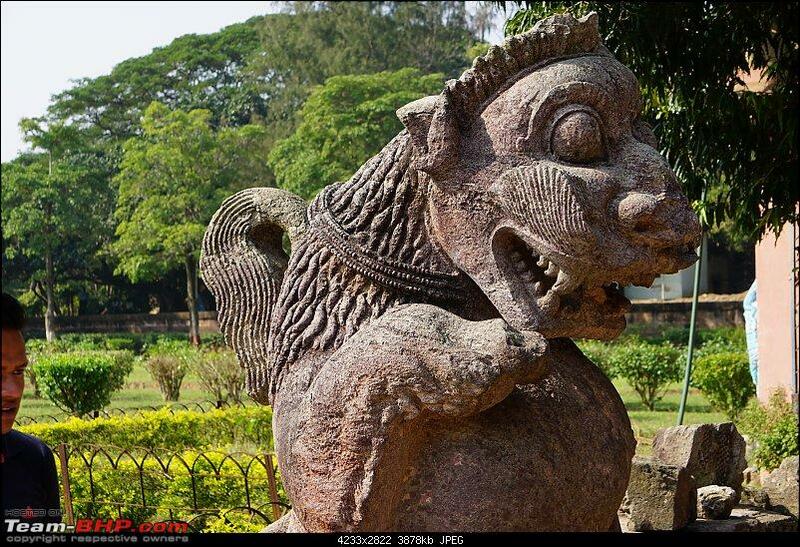 Puri-Konark Marine Drive connects these two temple towns and the roads are in good condition for entire distance of ~40 kilometers. 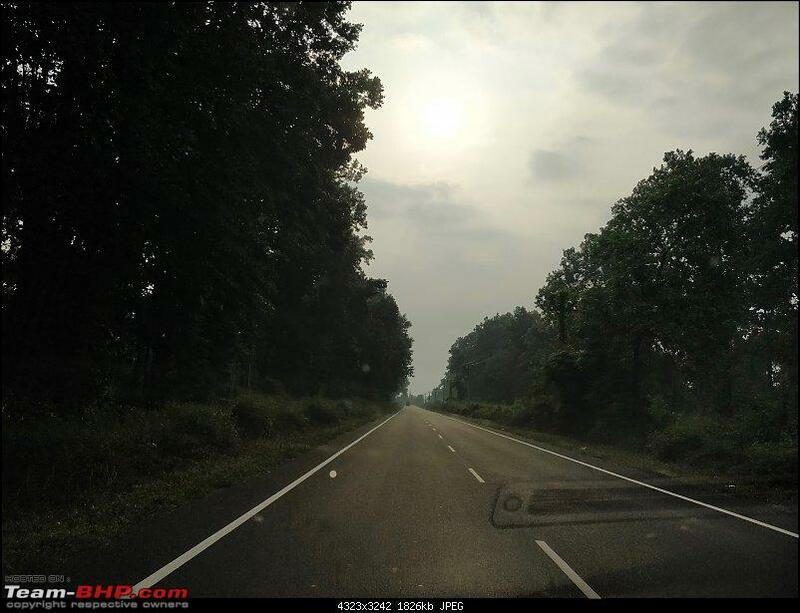 This road goes through Balukhand wildlife sanctuary and has many beaches on offer. 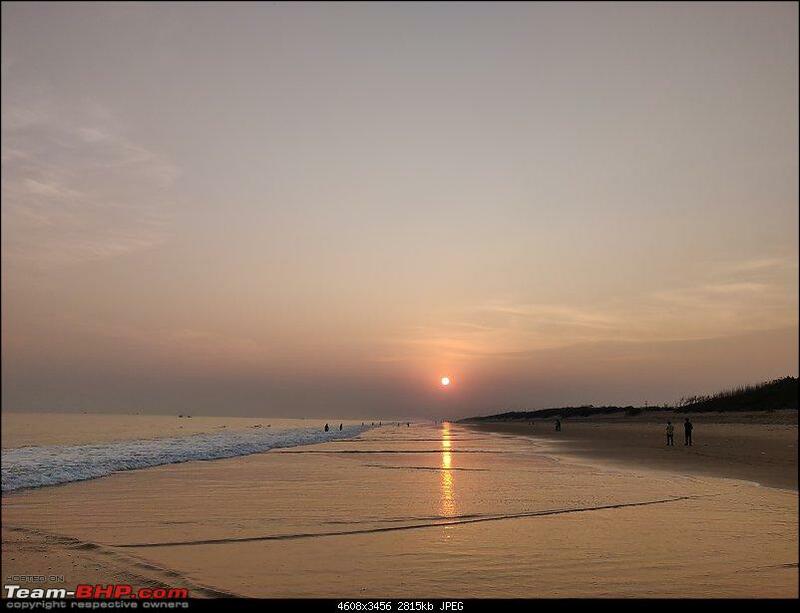 Chandrabhaga is one important beach among few others. 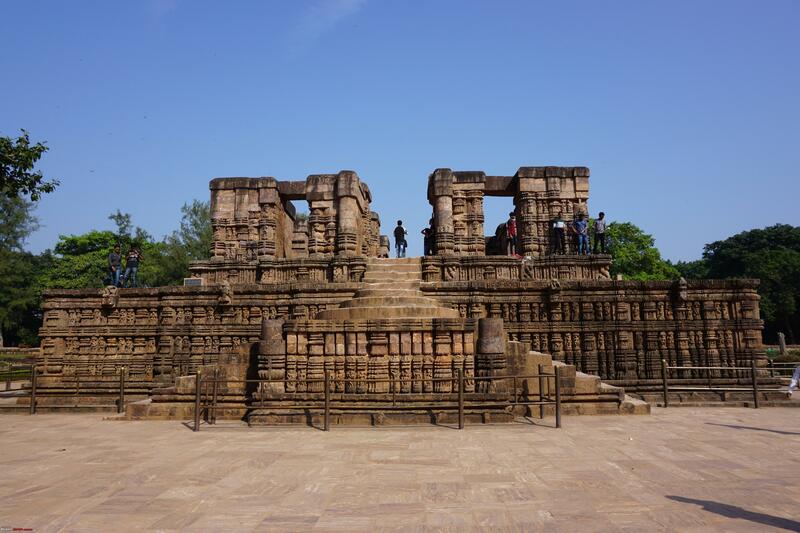 We reached Konark in an hour and hired an official guide who gave us a good insight of history and showed us all important places within the temple complex, which is an ASI monument. We admired intricate carvings on the remains of sun temple and saw the famous sun dial (wheel), along with other 23 wheels. After spending an hour inside the complex, we visited the museum built by IOCL. 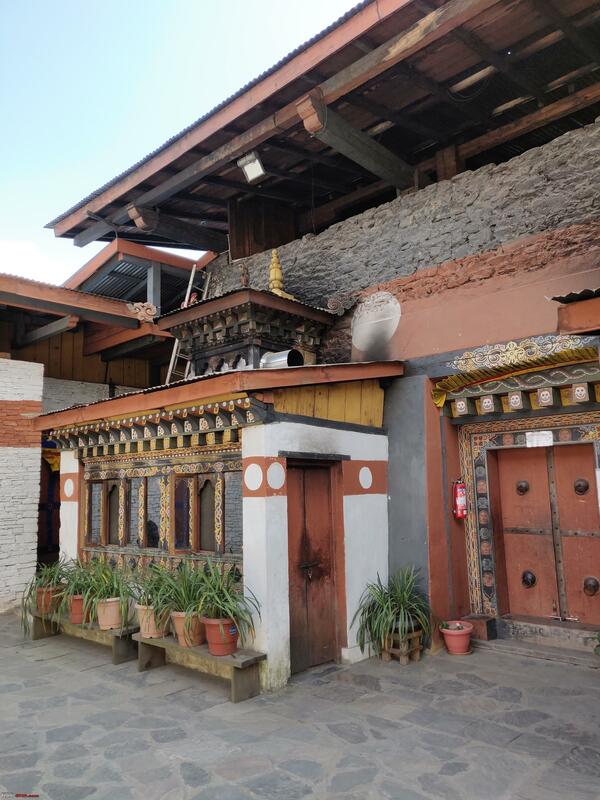 This air conditioned museum has replicas of various parts of the temple complex, few scaled models of past and current temple complex, pictorial representation of historical events and a mini theater, which shows a short film on history and mythology related to the temple. Had lunch in one of the vegetarian restaurants and started our drive back to Puri. 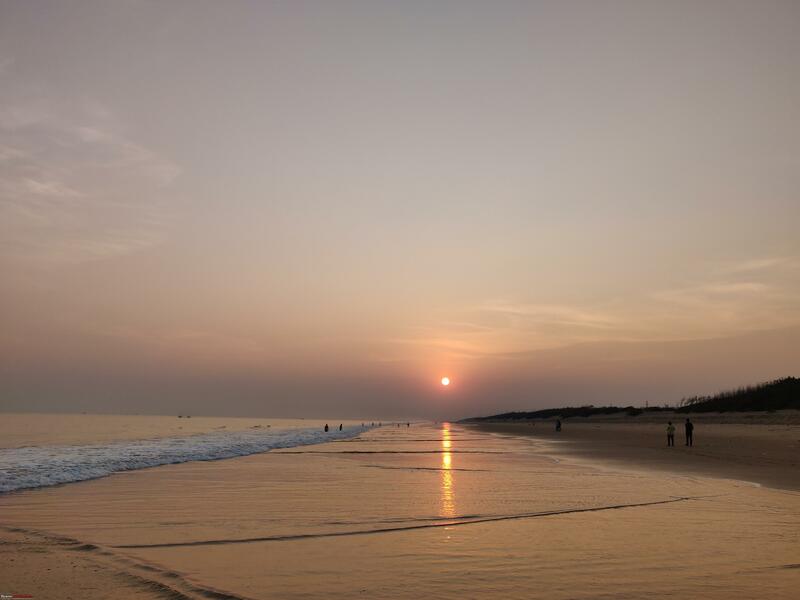 We stopped at the beautiful Chandrabhaga beach and viewed sunset. 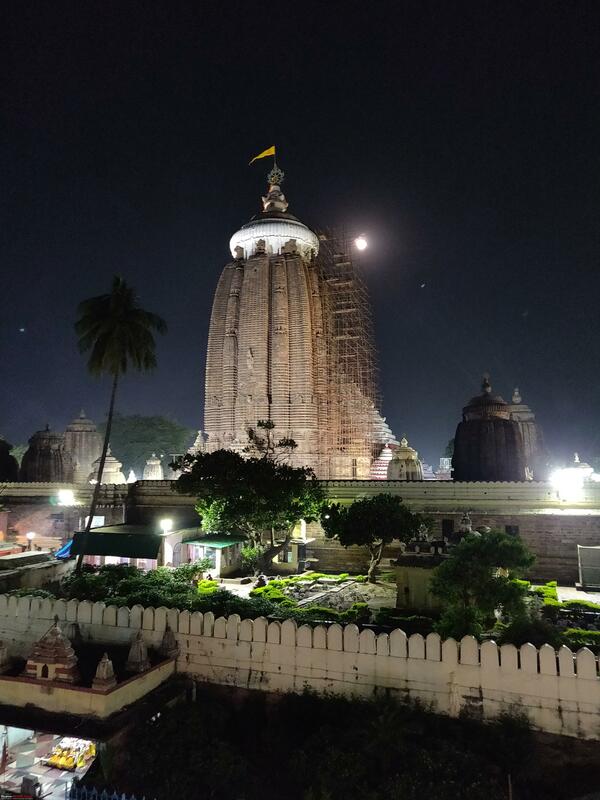 Reached Puri around 8 PM and called it a day. Last edited by prasanna_indaje : 19th March 2019 at 19:49. 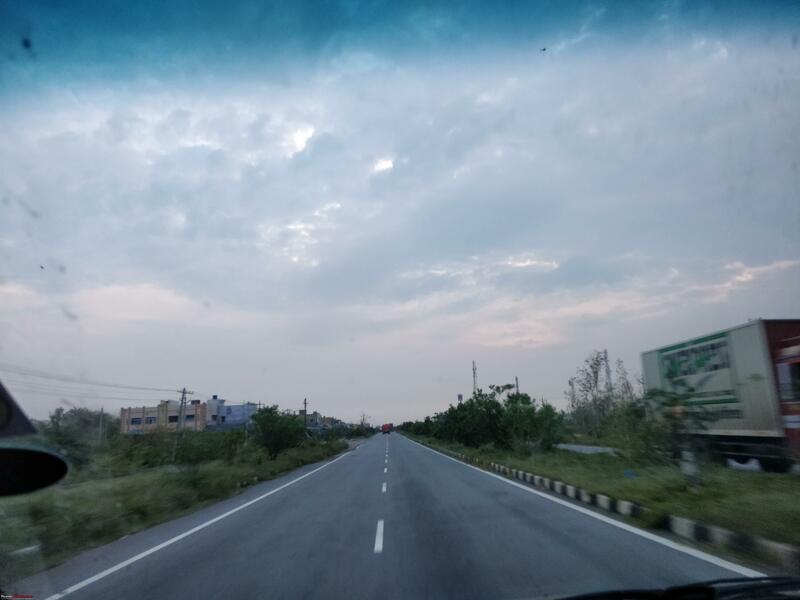 Target of the day 17 was Vijayawada and we started our drive at 6.30 AM. 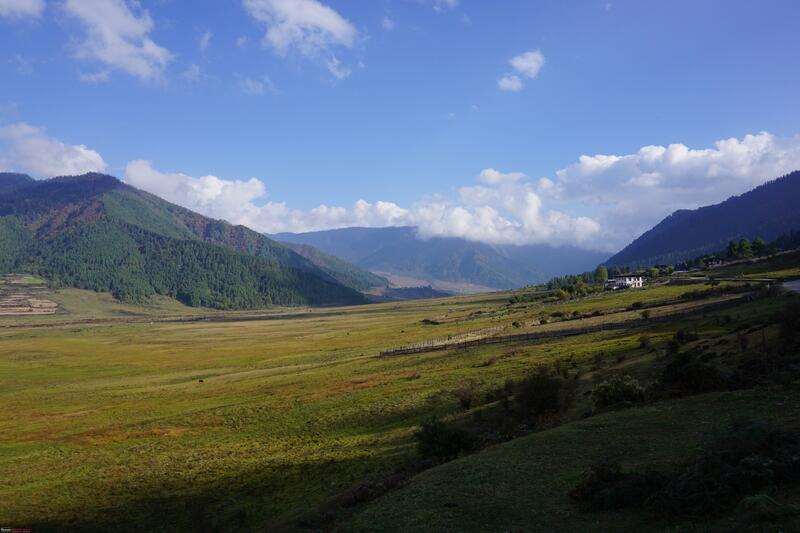 We visited Chilkha lake en route and had breakfast (of Vada’s and green peas curry) in one of the small eateries. We entered Brahmapur town in search of some small shop selling Odisha specific saris and found one. Bought some saris and joined the NH again. 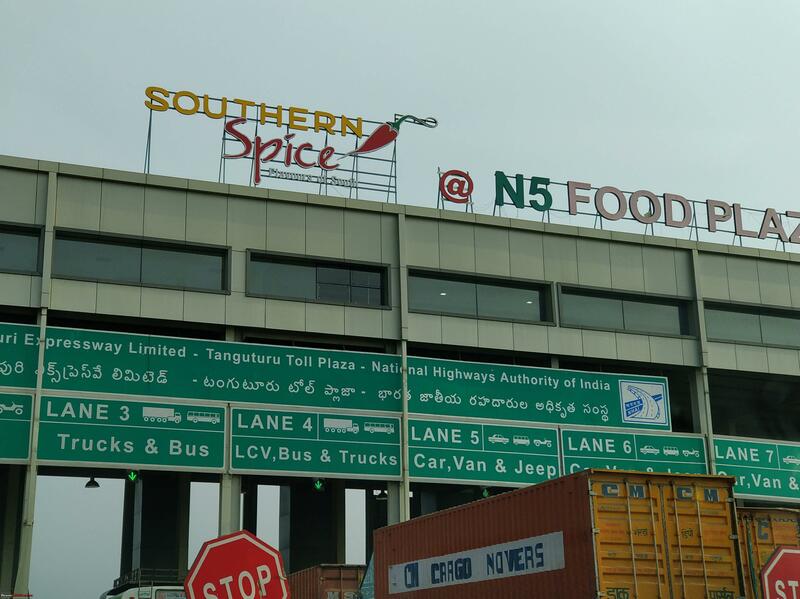 Border crossing to Andhra Pradesh was uneventful and did not even realize that we were crossing a state border. 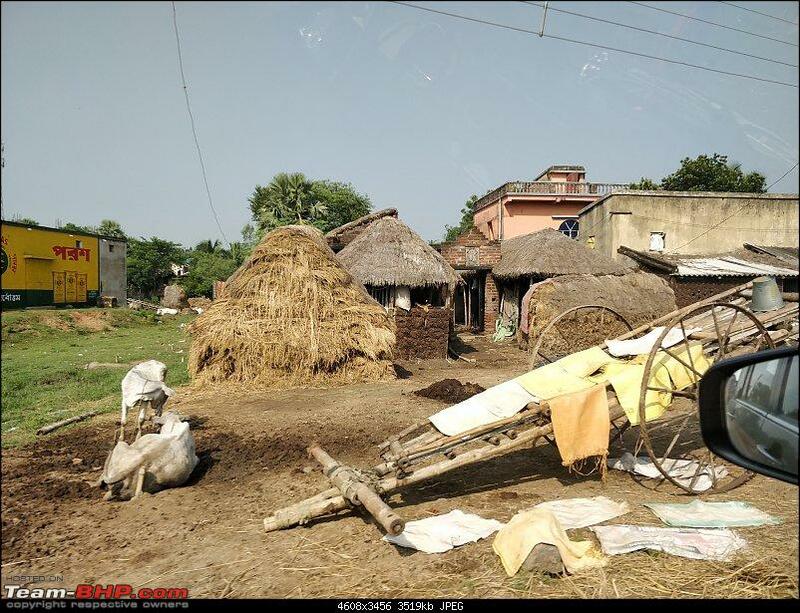 Border areas were still recovering from the jolt created by ‘Titli’ and many buildings were roofless. Entered a Reliance bunk for refueling and found that entire roof of the petrol bunk was ripped-off by cyclone. Crossed Vizag by 5 PM and reached our hotel at Vijayawada by 10 PM. 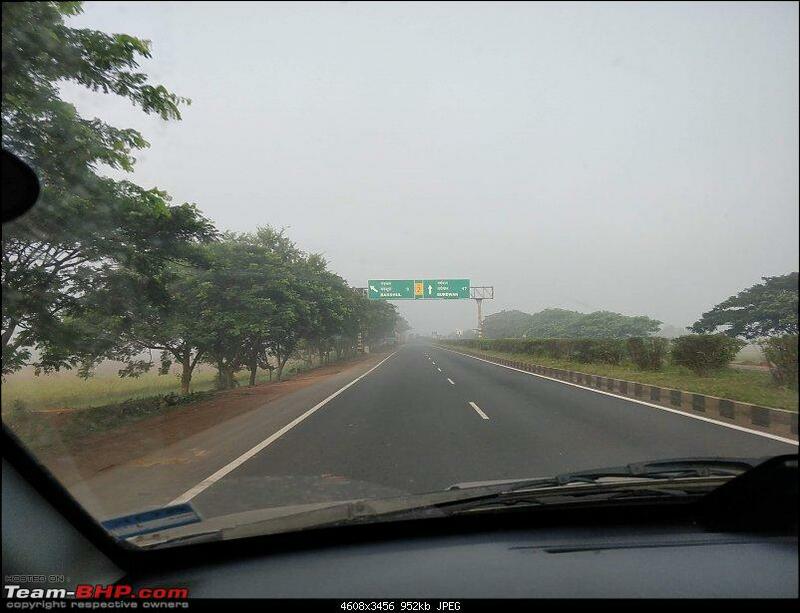 Drive back to Bangalore started at 7.30 AM of day 18 and we bid adieu to NH16 at 2 PM. Car was silent most of the time during the day and only consolation was a stupendous Andhra style vegetarian lunch and ‘Milk Khova’ from a hotel on outskirts of Srikalahasti. Took Kanipakam route on return and reached home by 9 PM. Overall, this trip gave us much needed family time and we enjoyed it the most. Also, belting miles all day long and crossing states on the fly gave different perspective to our understanding about those states and exposed us to multiple cultures ! Last edited by prasanna_indaje : 7th December 2018 at 21:57. 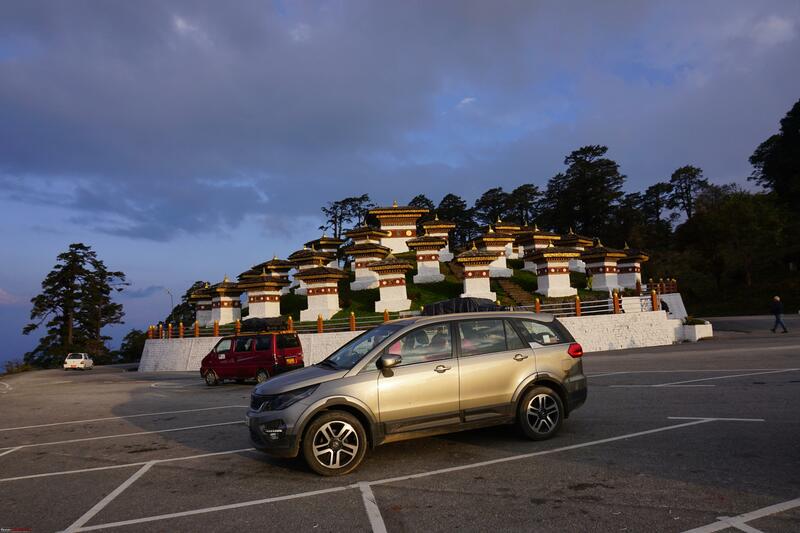 Well, to summarize, three of us (myself, my wife and our daughter) and our one-year old Tata Hexa, completed an amazing journey of 6,700 kilometers to Bhutan in 18 days. 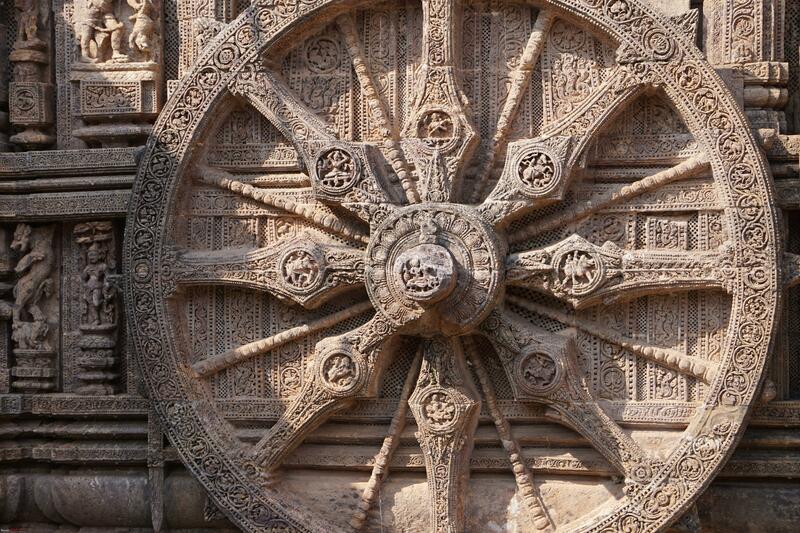 We traveled across the states of Karnataka, Andhra Pradesh, Odisha, West Bengal and Bihar (only few kilometers). We crossed the international border on 5th day after starting from Bangalore. All hotels within India and few in Bhutan were booked online on the go. 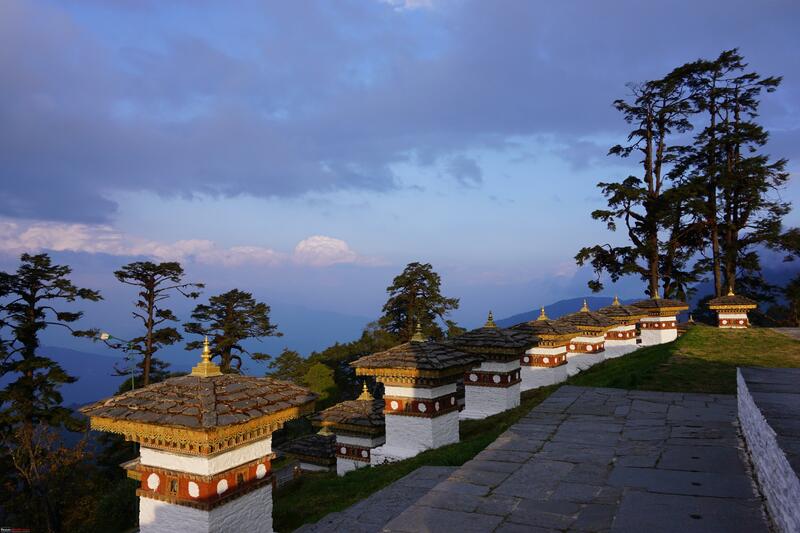 While remaining few in Bhutan were booked online in advance and by directly calling the accommodation. It’s simple to book and sometimes cost effective too. All we did was Google mail id of the resort and check their availability on our required dates. On receiving affirmative reply, transfer booking amount to specified bank account in Jaygaon / Siliguri. Take a screenshot of the payment (note: a screenshot of online transfer or scanned copy of deposit slip is must) and send it to the resort by email. 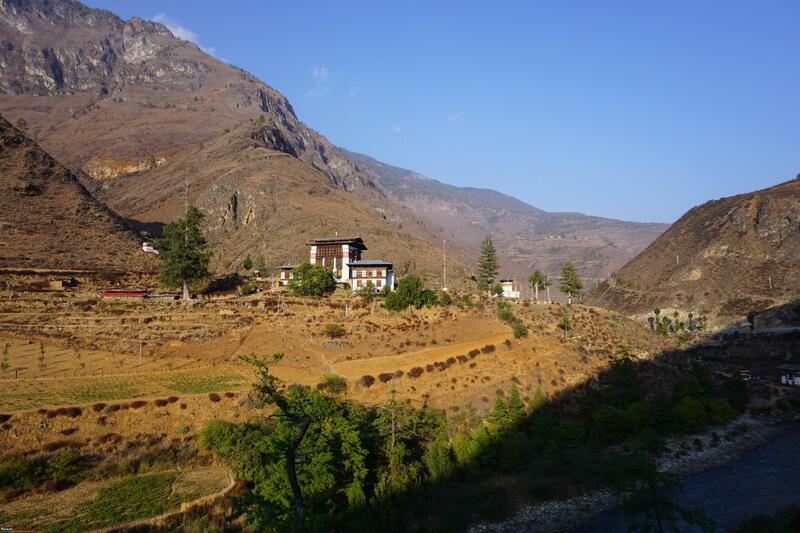 Resort will in turn coordinate with the bank to transfer amount to their account in some Bhutanese bank. Once amount is received, resort will send a confirmation PDF. 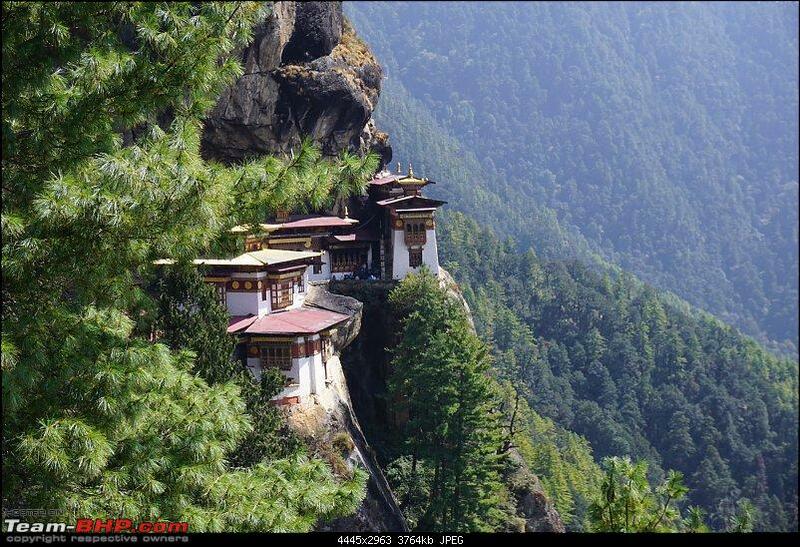 Please have booking confirmation for all days of stay in Bhutan and take printout of all hotel bookings. These need to be presented along with immigration documents. Being a vegetarian family who prefer to eat only in pure vegetarian restaurants, we had to carry our supplies and cooking gear. Cooking gear included a Coleman duel fuel stove, an electric rice cooker and few utensils. We cooked khichdi many times using electric rice cooker. Stove and other utensils were mainly used to prepare hot water for ready to cook breakfast and coffee. Typically, we used to stop by a less populated and clean stretch of the highway to cook our ready to cook items. 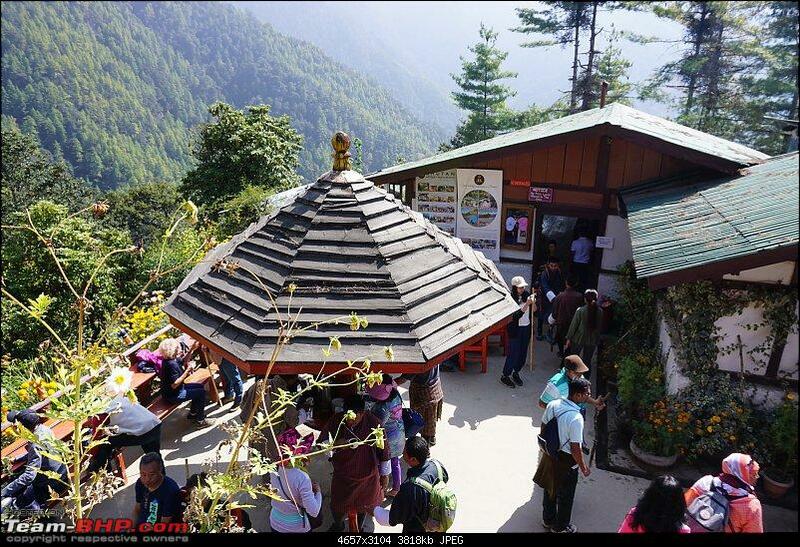 All major cities of Bhutan have at least one pure vegetarian restaurant, thanks to Indian tourists. 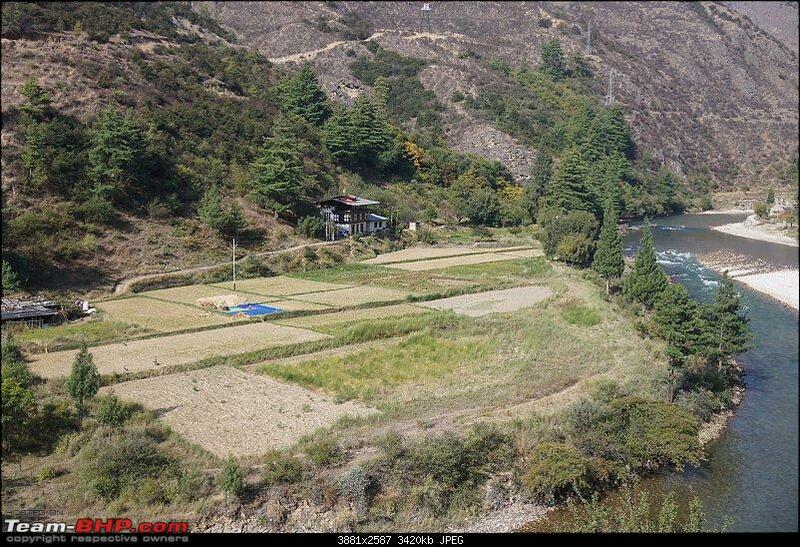 There will be plenty of Indian and Bhutanese hotels which serve all types of cuisines in most of the towns. 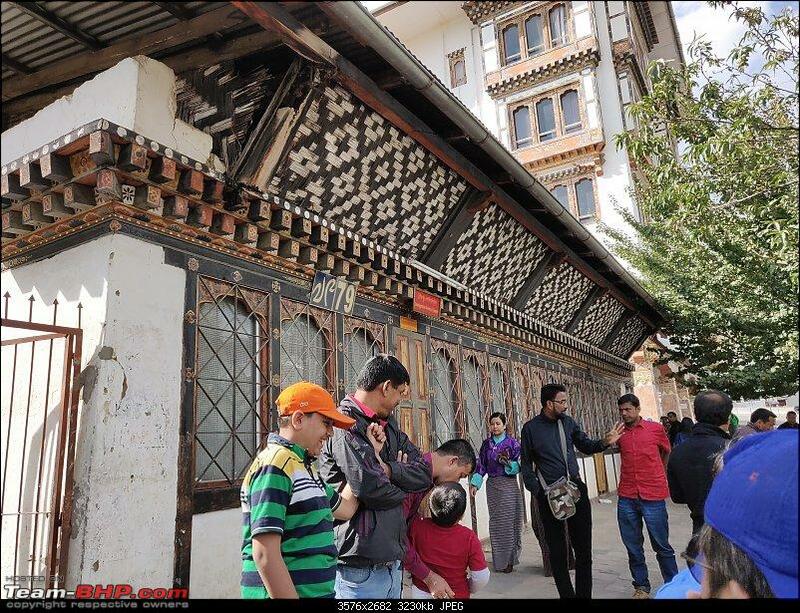 Thimphu and Paro has many cafes and upmarket restaurants, where foreigners (read non-Asians) frequent. 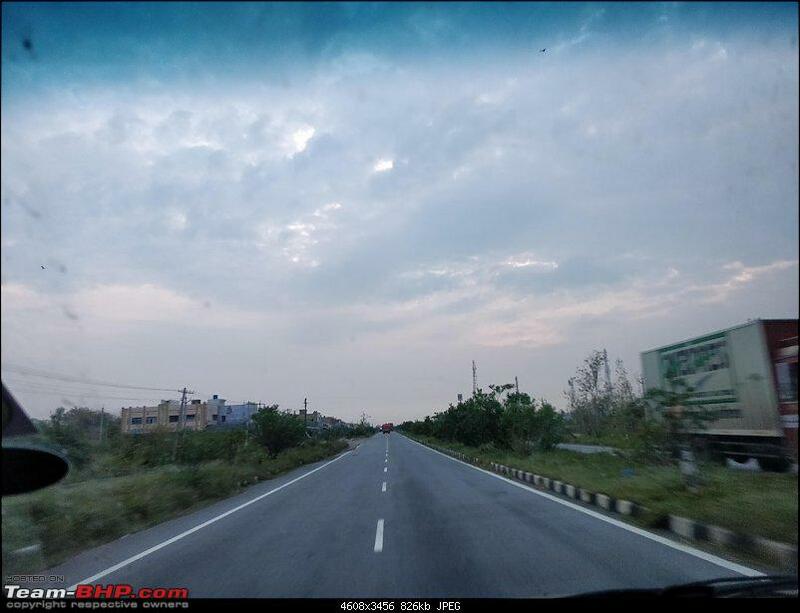 Roads were good for most part of the journey except some parts of Bangalore – Tirupati and Kolkata – Siliguri stretches. Border crossing between states was a breeze and we did not wait for hours behind line of trucks and there was no need to drive on the wrong side of the road to avoid trucks and cross state border. 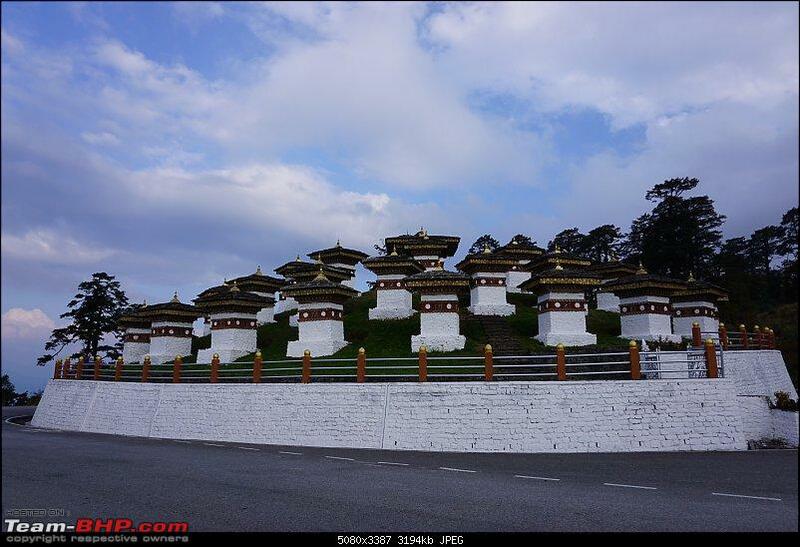 Roads in Bhutan were well maintained for most of our journey. There were few bad stretches in-between, but nothing a sedan cannot manage. 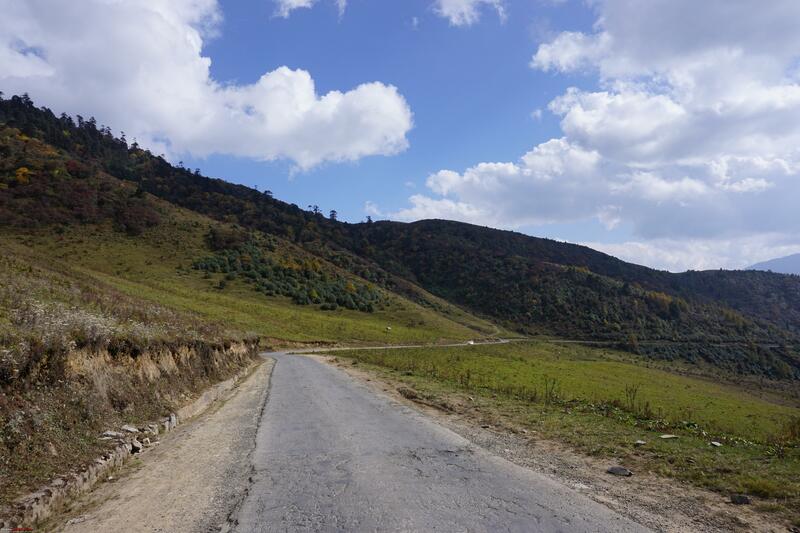 Only 4 lane road we found was few kilometers on either side of Thimphu. All other roads were undivided 2 lane roads, some with markings and some without. 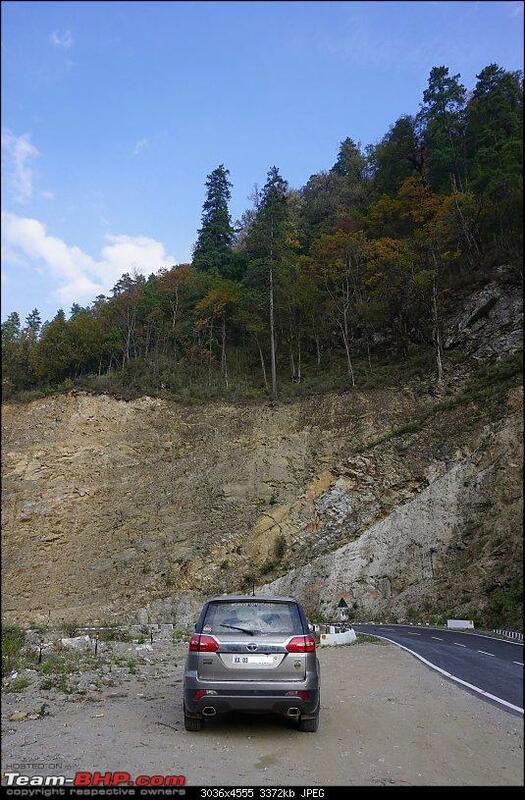 Remember, driving in Bhutan is like driving on a never-ending ghat section. 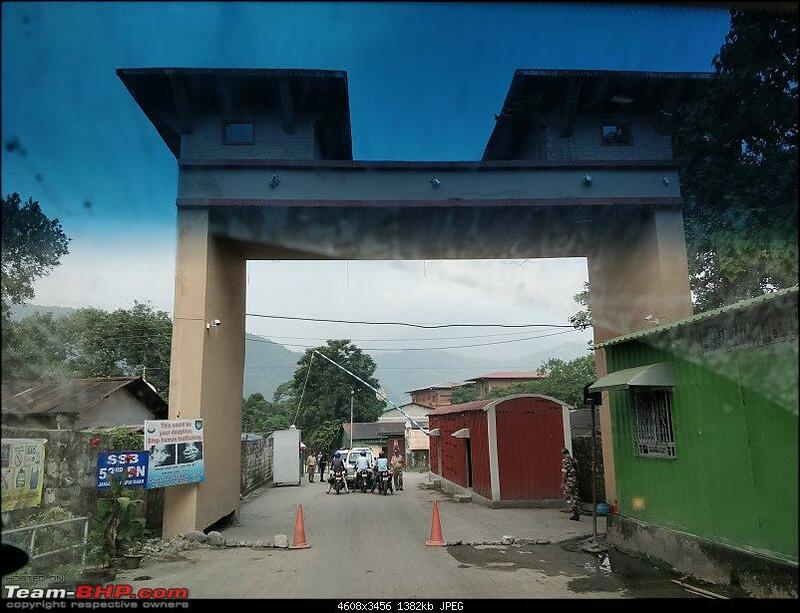 When we enter from Phuentsholing, at the gate there will be a couple of Bhutan police officers who keep glancing at vehicles entering and perform random checks. 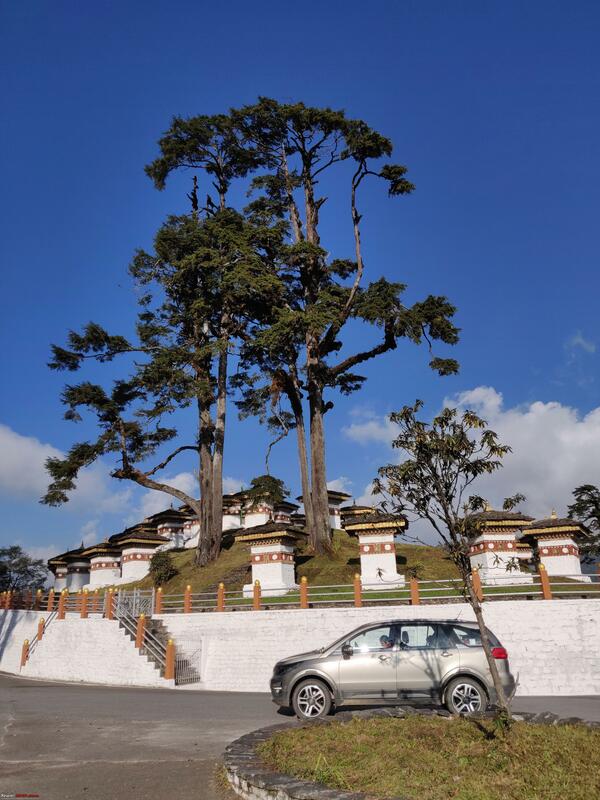 Once we enter Bhutan, we can drive around Phuentsholing freely, no permits are required. To go further, we need to get visa for people and entry permit for vehicle. 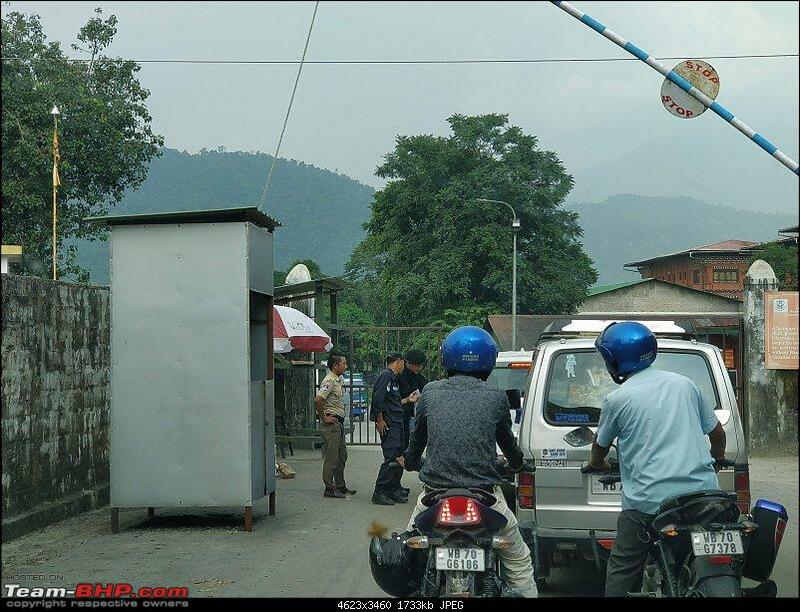 Visa / Entry permits are issued at immigration office Phuentsholing. Visa will be stamped directly on the passport. In case of voter ID, a separate entry permit printout with stamp and official signature will be given. Following are the documents needed for getting Visa / entry permit: Application form (one per traveler, provided free of cost at immigration office), Passport / Voter ID, 2 Passport size photographs, Itinerary of the travel (either hand written or printout) and hotel confirmations as per itinerary. Ensure you carry at least two photocopies of all documents. Take few photocopies of Visa / Entry permit. These will be needed in all future office visits. 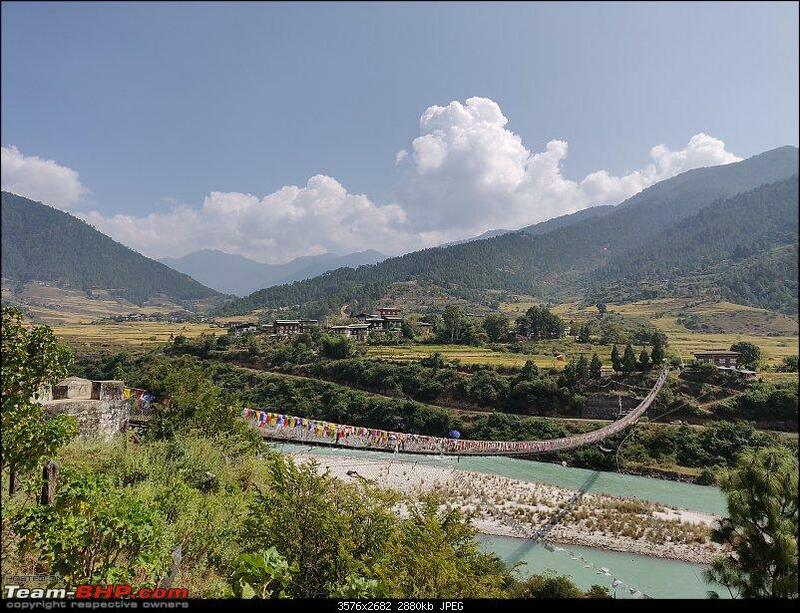 Visa / Entry permit issued will be valid for Thimphu and Paro, only for 7 days. 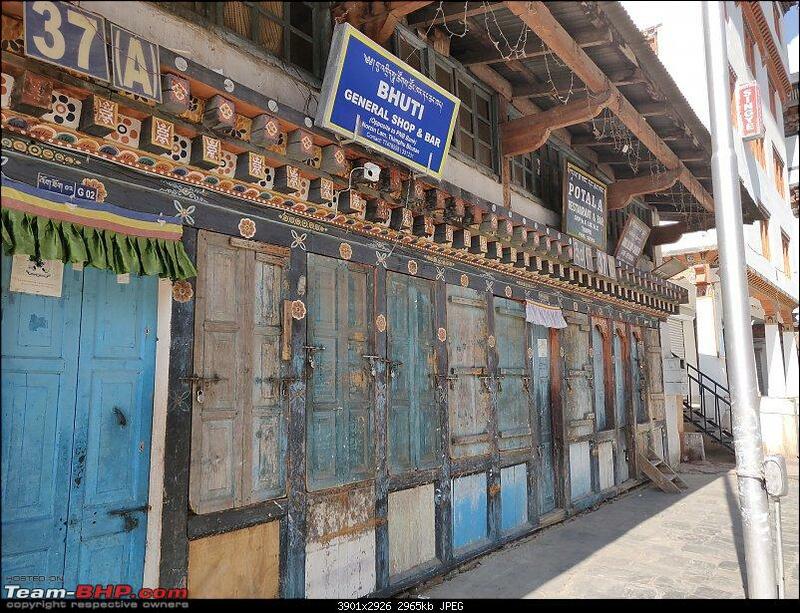 Extension of duration or permit to visit other places should be requested at Immigration office in Thimphu. 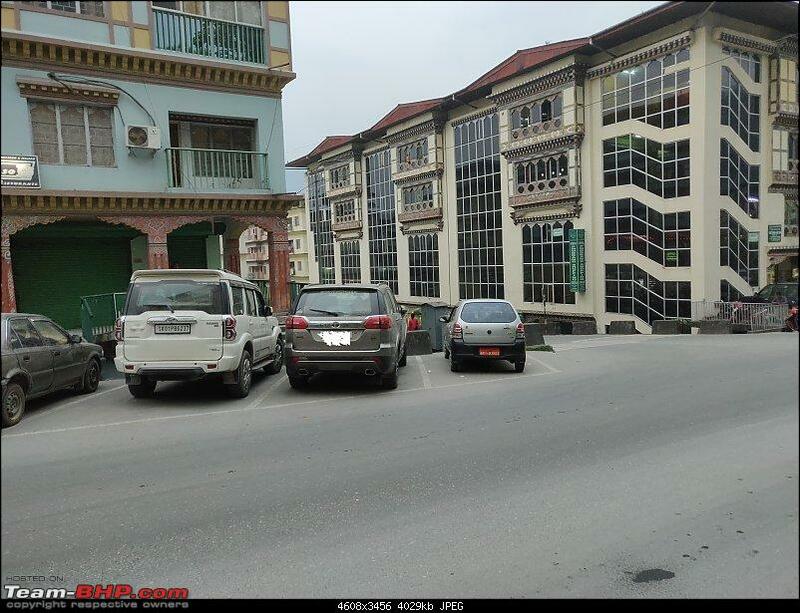 Get a vehicle permit form (Nu 10) from the photocopy shop opposite to RSTA office at first floor of Phuentsholing bus stand and fill it with details. If there are multiple drivers, include everyone’s name. Handover the form to the RSTA official, who will verify all documents and ask to pay fee of 100 Nu per day. Pay specified fees at cash counter in second floor and submit documents along with the receipt in second floor. After some time, your name will be called, and the permit will be given. Verify correctness of all details and if all is correct, you are all set. 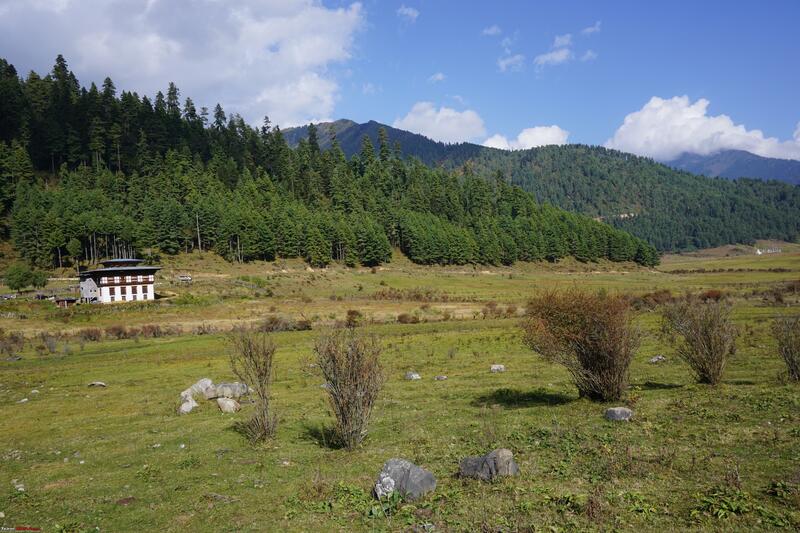 ILP is needed to visit places beyond Thimphu and Paro districts. ILP can be obtained from Immigration office in Thimphu. ILP form needs to be filled and submitted along with original permits / passports. After approximately an hour, ILP will be issued. 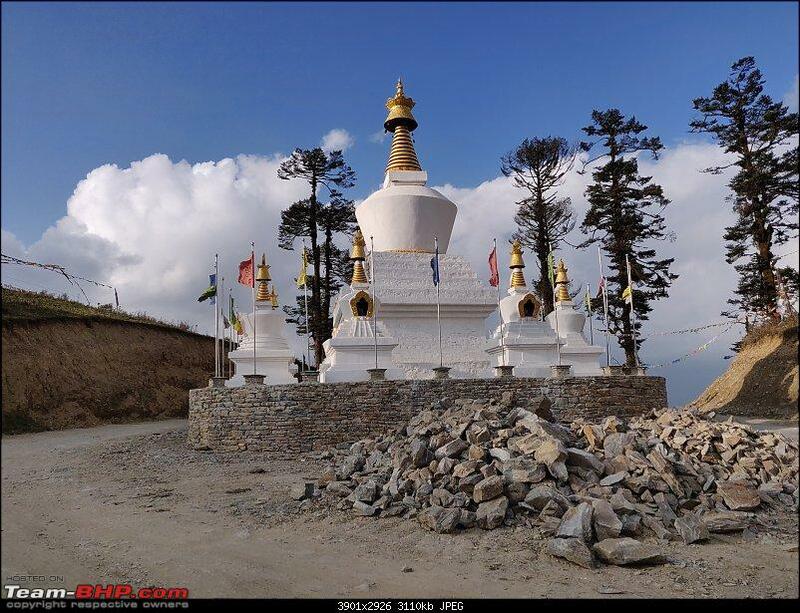 This will be a paper with details of original permit from Phuentsholing and list of additional places permitted. 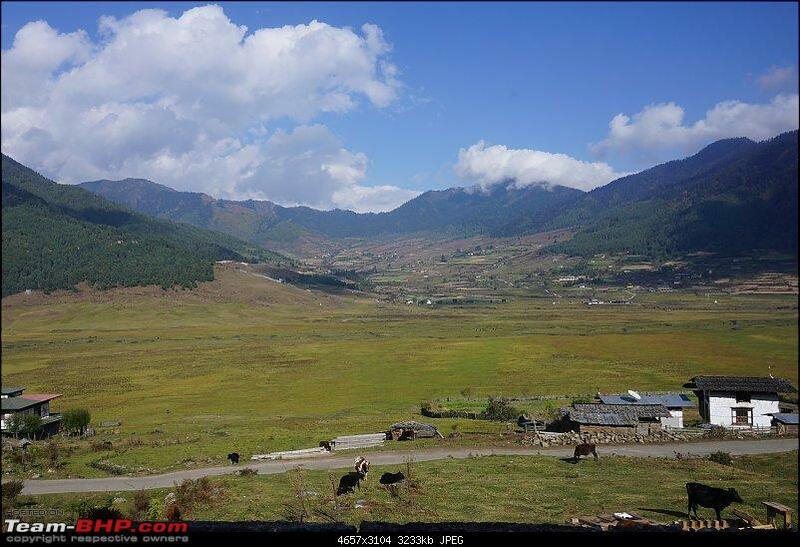 Add all places you want to visit and few more (Haa, Punakha, Phobjikha etc.). This is free . 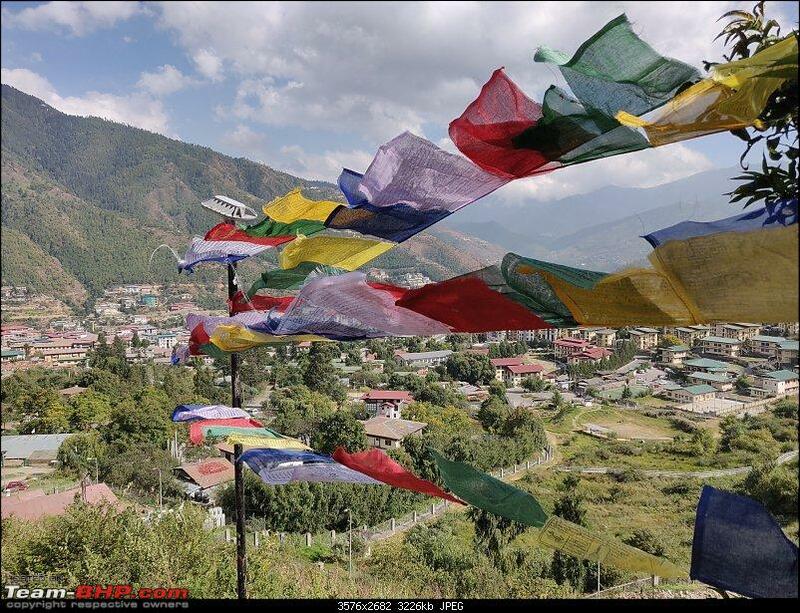 If the plan is to stay beyond 7 days in Bhutan, extension of visa needs to be applied at immigration office in Thimphu, before visa expires. Extension form needs to be submitted along with original passport / entry permit at extension counter of Immigration office in Thimphu. An officer will verify and grant extension after approximately an hour. For passport holders, it’s just a stamp on the passport and for entry permit, a new permit will be issued. This is free too! If both are required, that is visa extension and ILP, extension should be done first and then ILP. 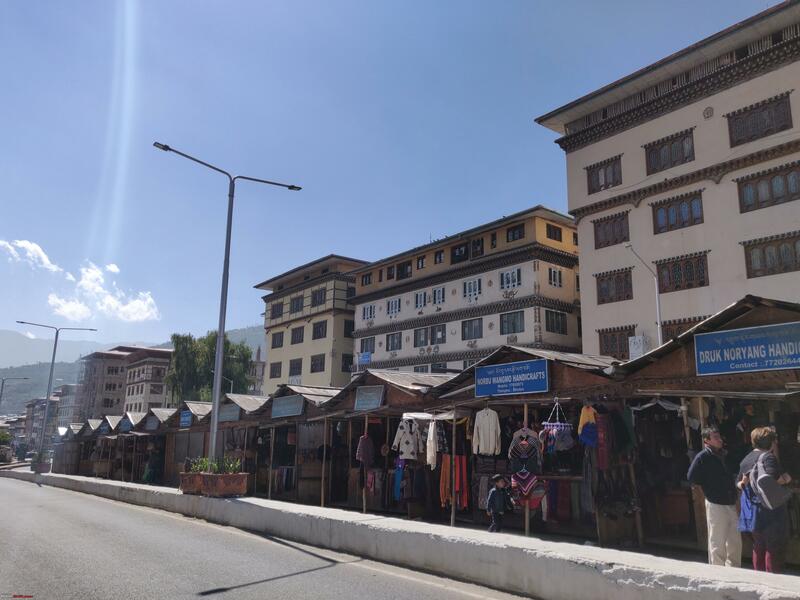 Once people related tasks (ILP, Extension or both) are done, ILP / permit extension for vehicle should be obtained for the vehicle from RSTA Thimphu. 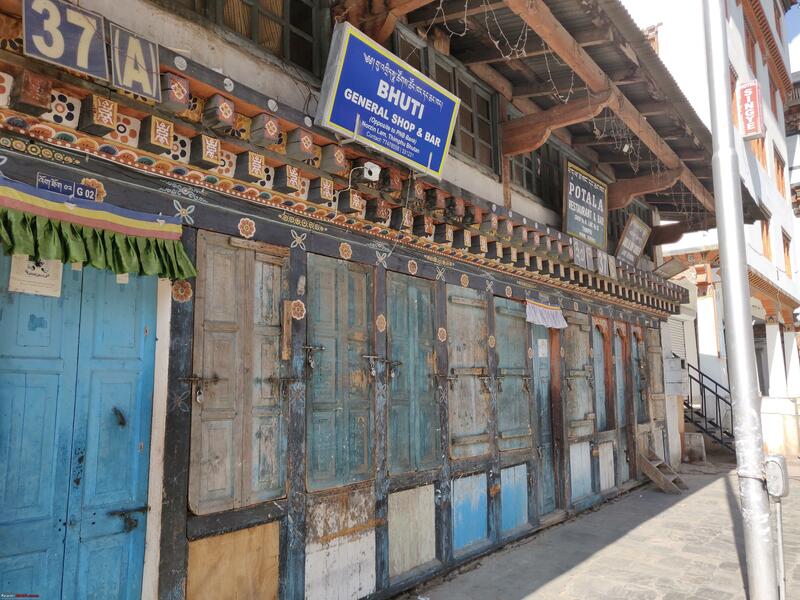 On the ground floor of Thimphu bust stand, there is a small RSTA office, which will have an officer if you are lucky. Present him with a copy of extension permit / ILP for driver and he will write additional places on the existing vehicle permit paper, with a stamp and sign. Again, this part is free. If you need to extend the vehicle permit beyond 7 days, pay additional amount as suggested by officer (100 Nu per day) at first floor of the same building and go back to the ground floor, to the same officer, who will write new dates on the permit. 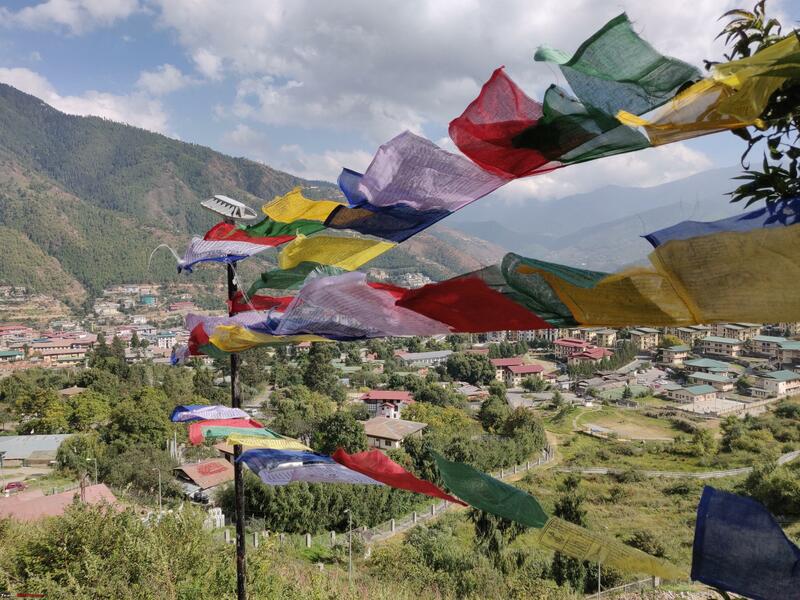 All Indian currency denominations are accepted widely in Bhutan (Despite of circular from Indian Reserve Bank asking not to accept INR 500 and INR 2000 notes). Merchants return change in Nu, if you pay in INR and the value is 1 INR = 1 Nu. ATMs dispense Nu and there will be some charge per transaction. Most transactions happen in cash only mode. Swiping machines don’t exist in many shops, petrol pumps and hotels. Even if they exist, they don’t work most of the times. 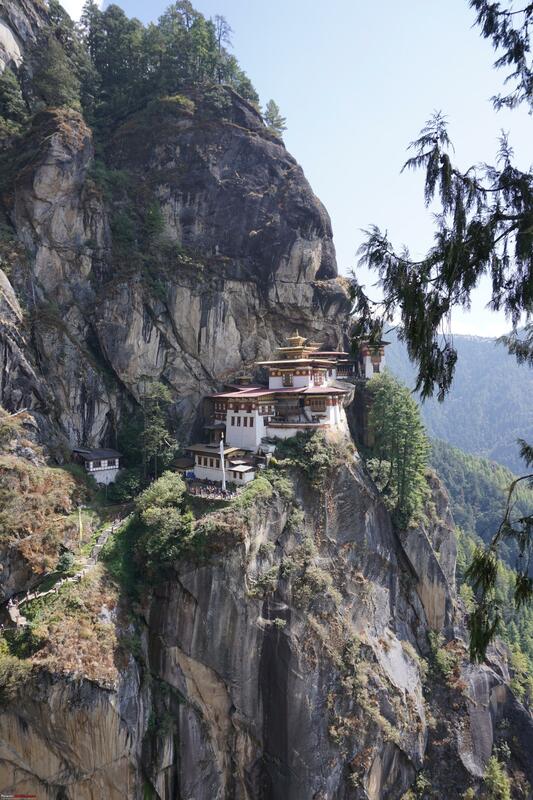 To summarize, I did not get any opportunity to use credit cards while in Bhutan. First question you will be asked is “Do you have a guide?”. They seem to have preference for tourists who hire guides. Immigration and RSTA offices seem to promote guide culture. I was asked twice in immigration office and once in RSTA office, why I did not hire a guide. 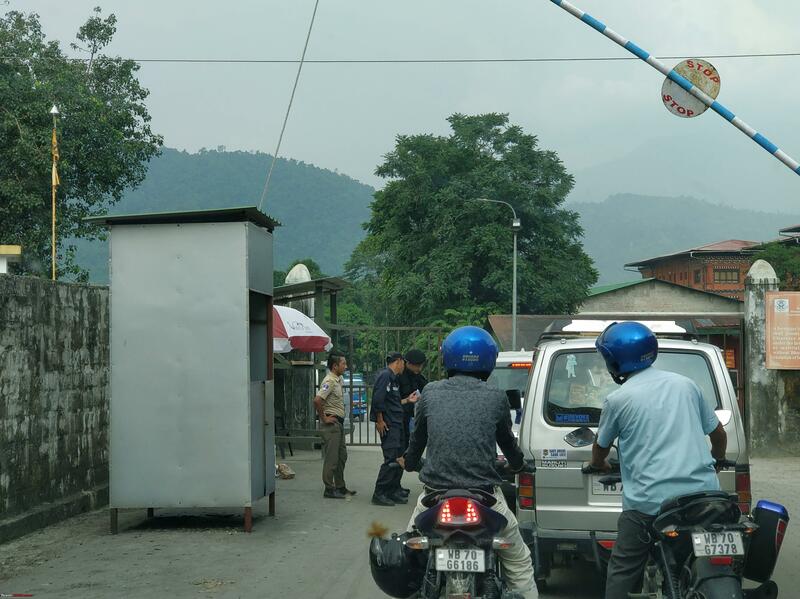 Officers at Phuentsholing Immigration office stressed on the fact that they offer free visa to Indians for tourism, to almost every Indian in the queue. 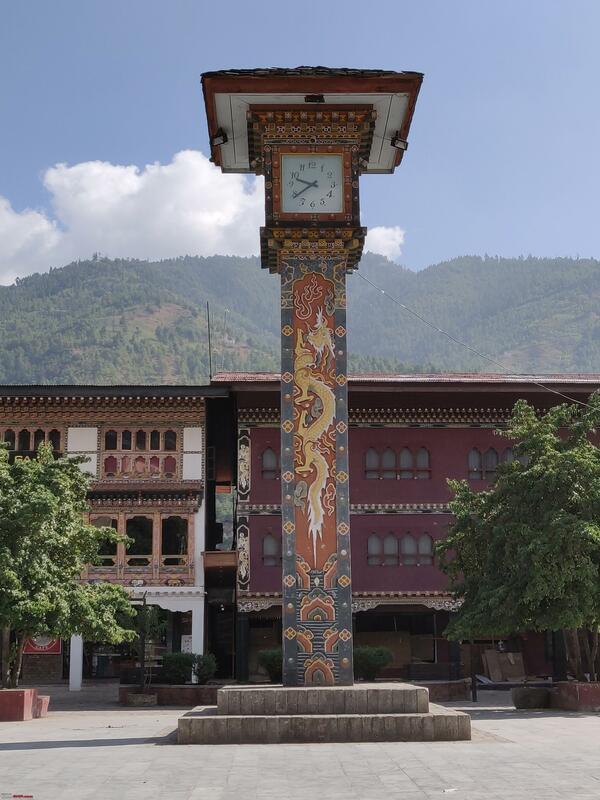 Officer at RSTA Thimphu to me on asking whether he will be available till 3.30 PM – “I can’t confirm. If I am there when you come, I will extend your permit. 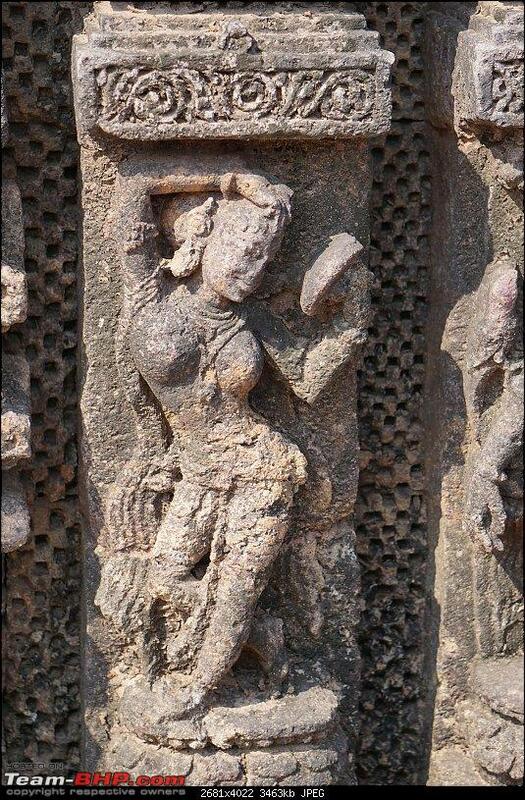 If I am not there, come tomorrow at 10 AM and be here and I will do the needful when I come”. I was fortunate that he was present in his office, when I went there at 3 PM. Overall, experience in any government office was not very encouraging and their attitude made us feel Indian offices are a lot better. 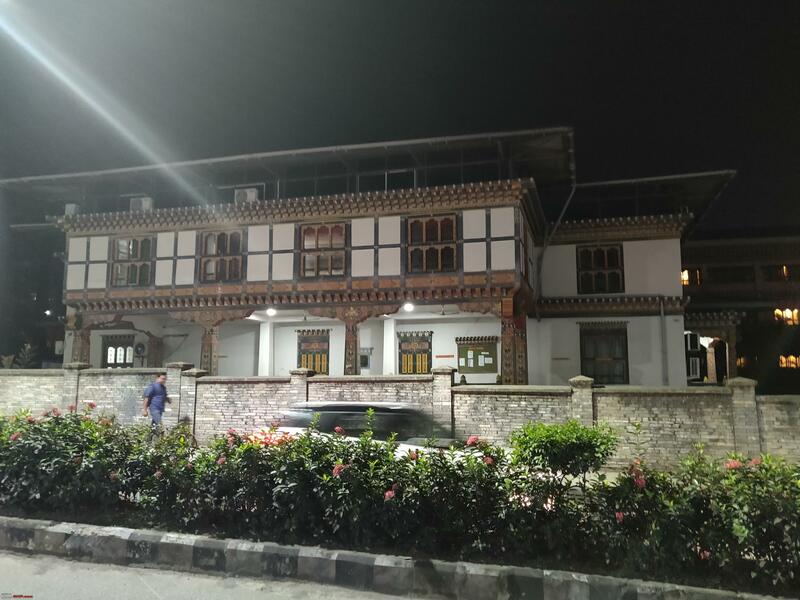 A restaurant in Thimphu refused to serve dinner to three of us , citing reason that they had a group of 25 people visiting them for dinner. No honking, unless driver ahead is really a pain. Strictly no honking in city limits, even if driver ahead is a pain. Pedestrian crossing: Stop for people to cross roads at zebra crossings (or anywhere on the road for that matter). Pedestrians get higher priority. Overtaking: Stick behind the vehicle in front of you and overtake only if driver ahead permits by switching on Left indicator OR the road ahead is absolutely clear and visible. In city limit, park only in designated parking areas. These are well marked. Parking is charged at most of the places. 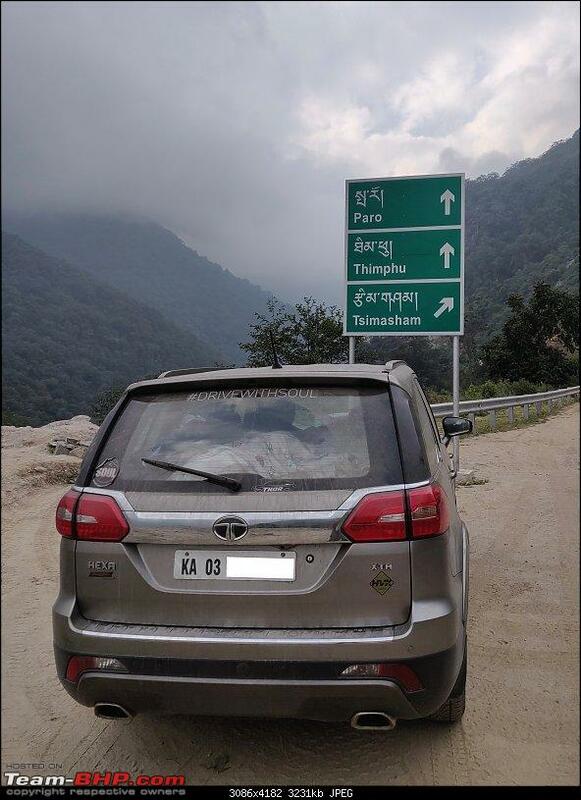 If there is a need to stop on highway, please do so where there is enough place to park the car. Do not park on the road. There are no traffic signals. Watch out for hand signals from traffic police. In roundabouts, people from left get priority. Finally, Do not expect local taxi drivers to follow rules above! This is the only part about which one can afford to be least bothered. Almost everyone speaks Hindi and English along with their local language(s). 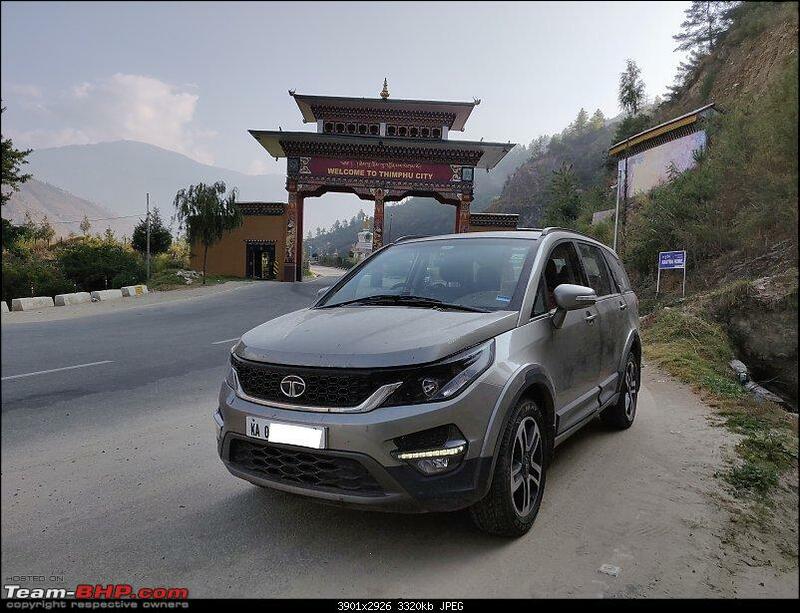 Hexa covered all those 6670 kilometers tirelessly. No issues at all. Three of us were very comfortable during journey and fatigue free after. Even after driving more than 14 hours a day for three days in a row, during onward and return journey. Automatic transmission helped a lot to reduce fatigue levels. Fuel efficiency averaged at 11 kmpl for the entire journey. Special mention goes to stock MRFs. They stayed put on all road conditions, weather conditions and terrains. No punctures or issues. I did not even top up air for entire journey. Last edited by prasanna_indaje : 19th March 2019 at 17:40. Thread moved from the Assembly Line. Thanks for sharing. All times are GMT +5.5. The time now is 12:14.